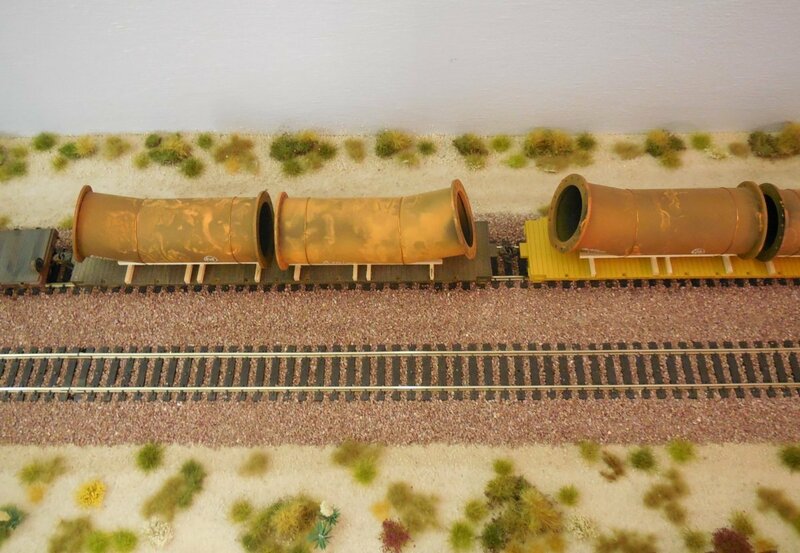 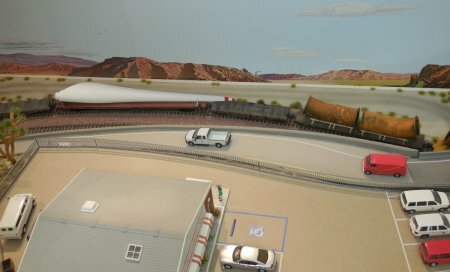 As the layout is more or less finished, I was putting two trains together and made testruns. Well, the real problems are becoming reality. 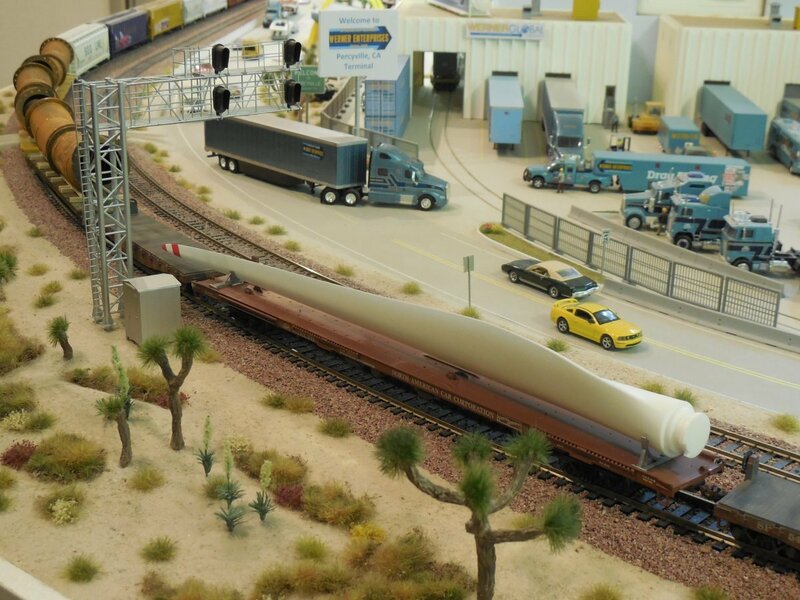 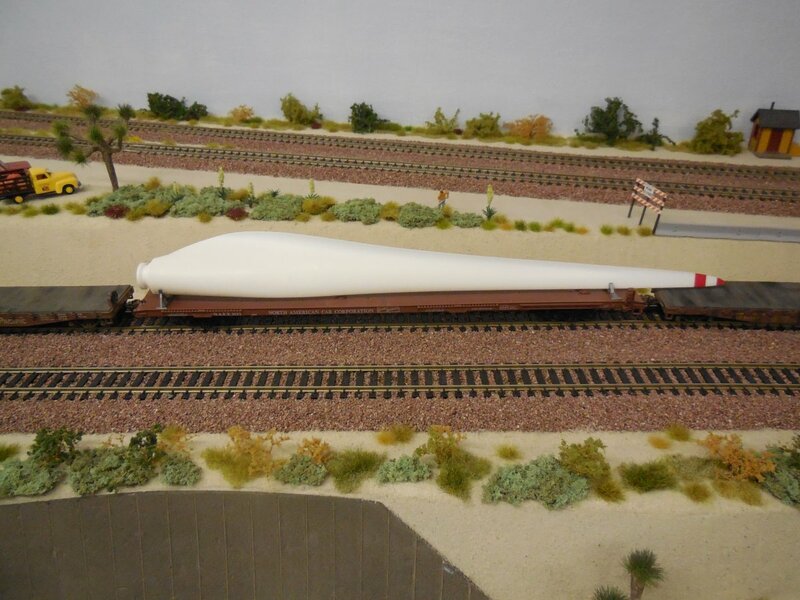 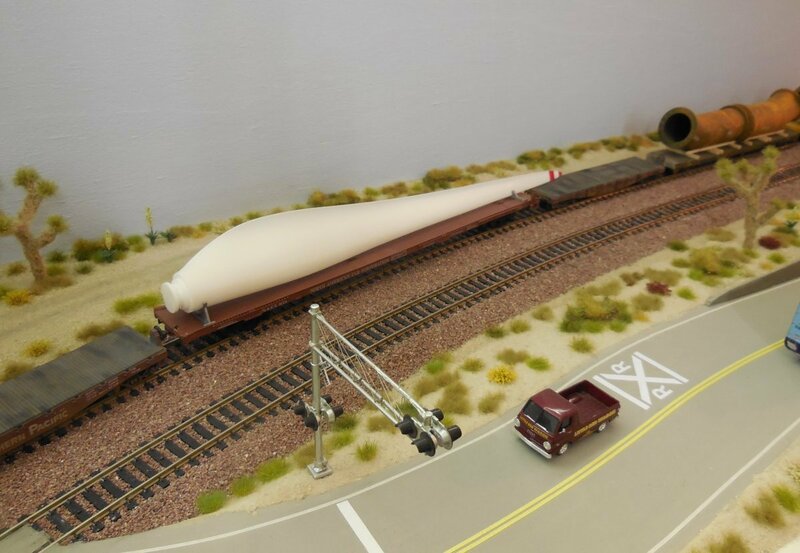 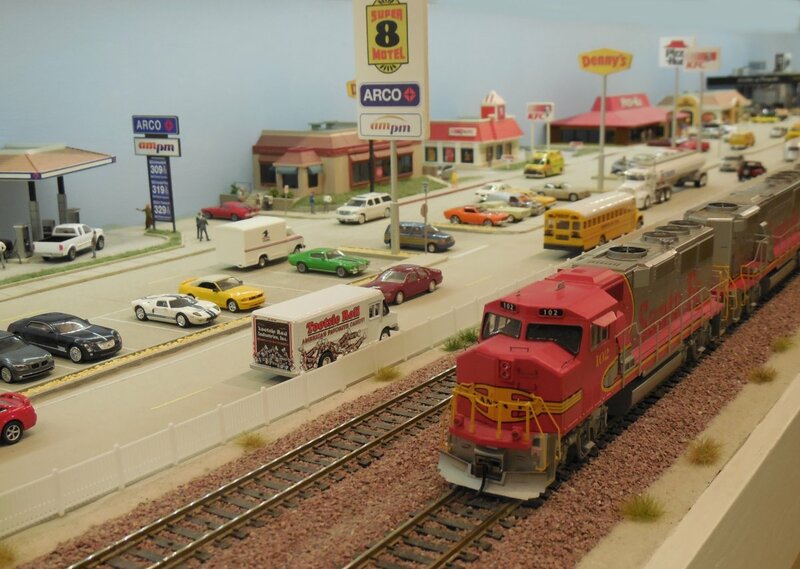 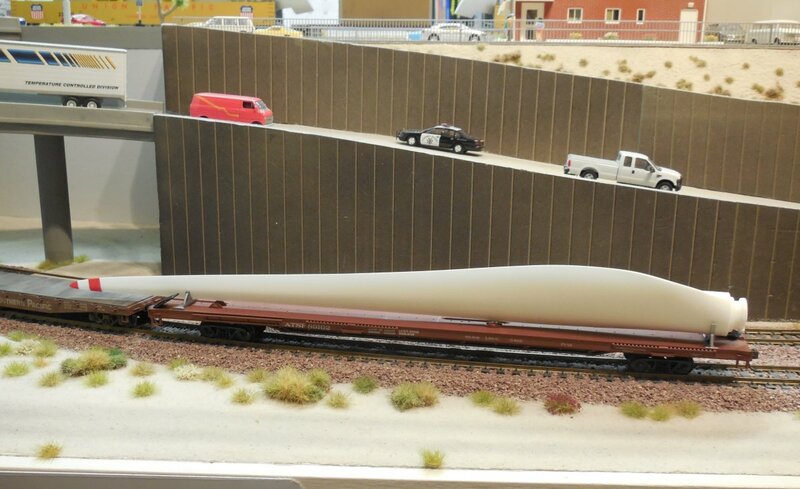 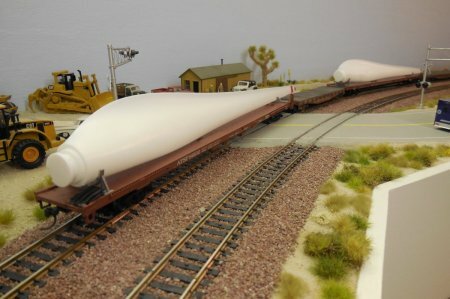 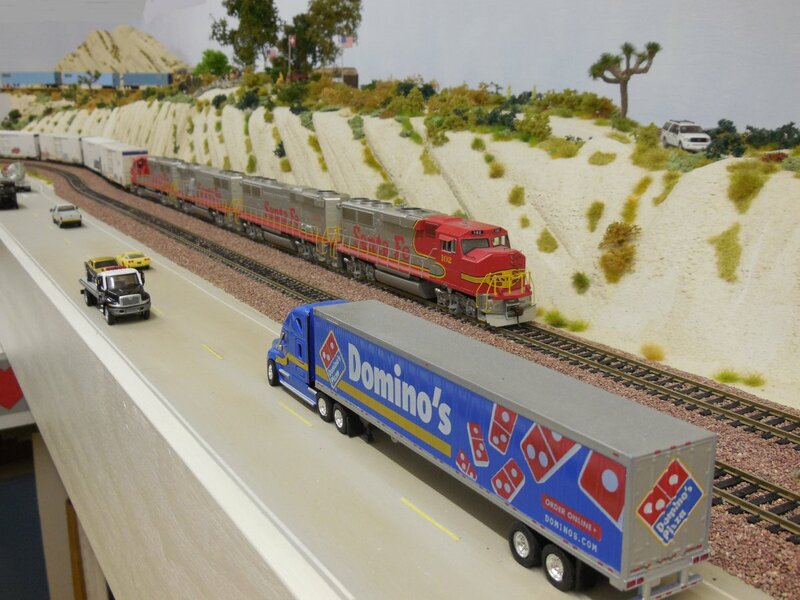 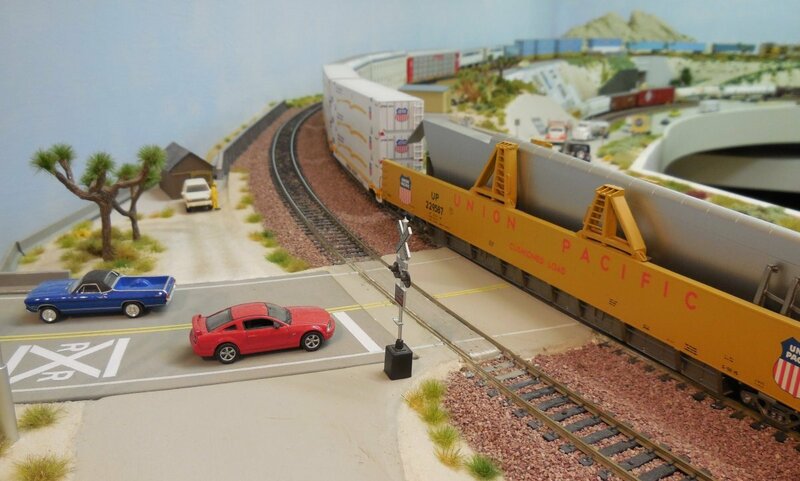 Sometimes, locos or cars are uncoupling and as longer a train is getting, more power is needed. 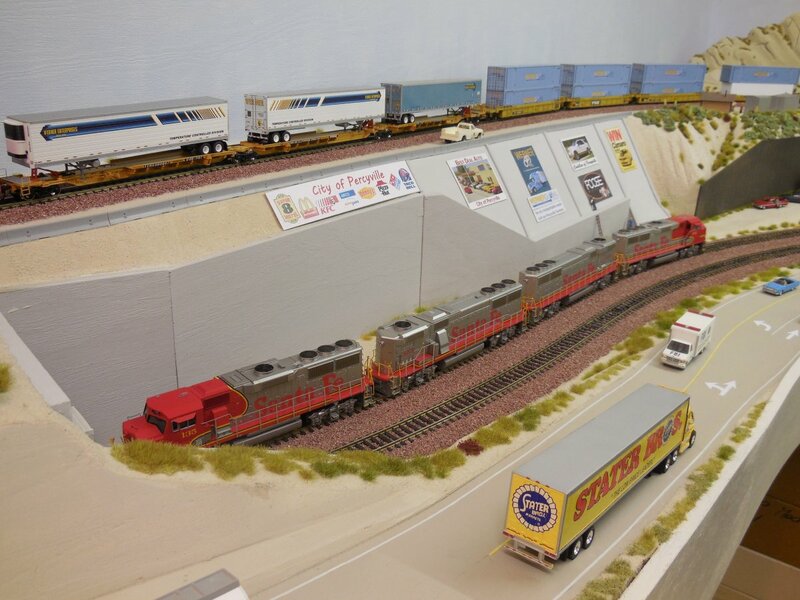 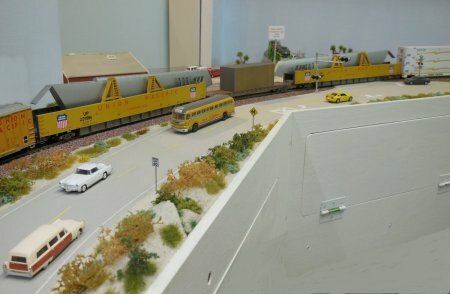 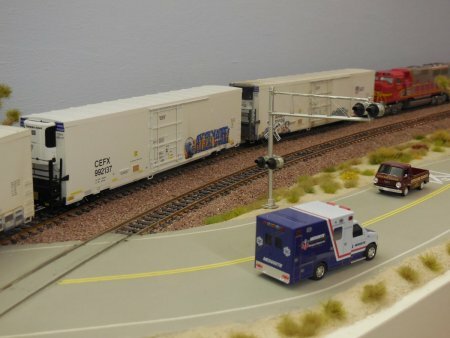 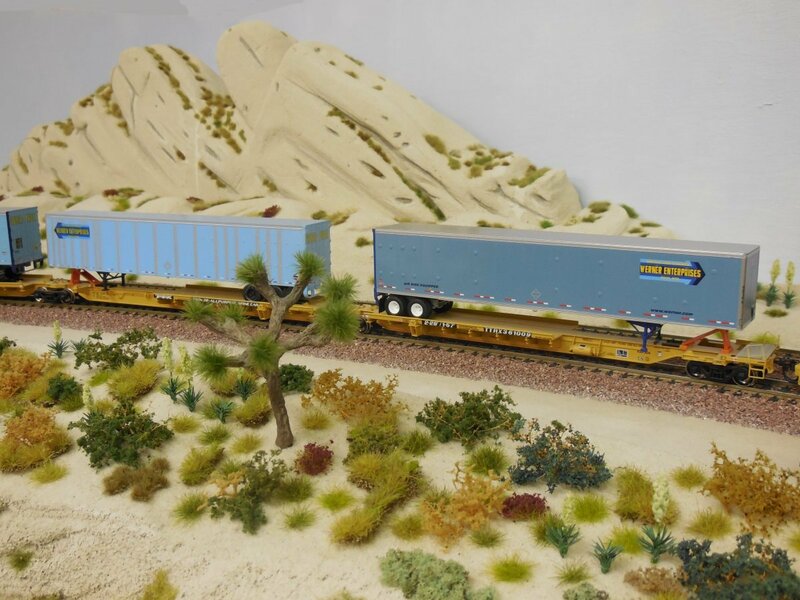 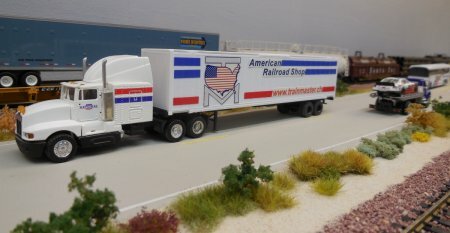 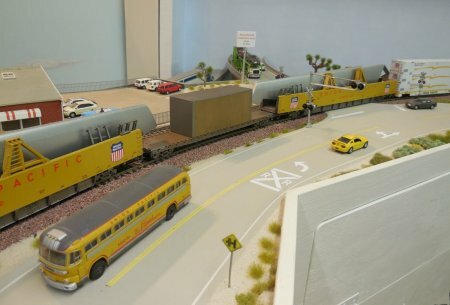 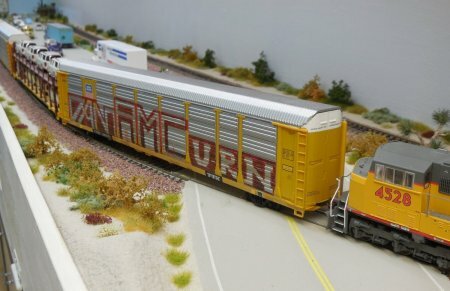 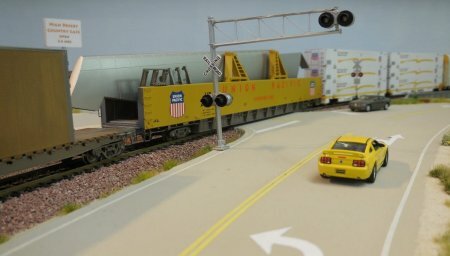 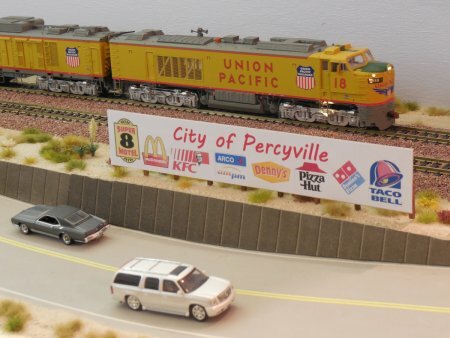 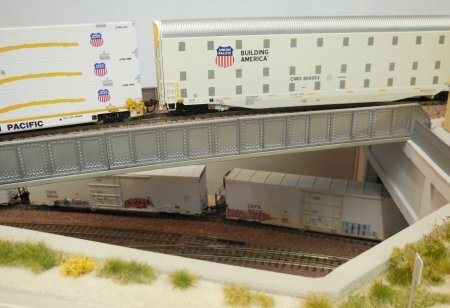 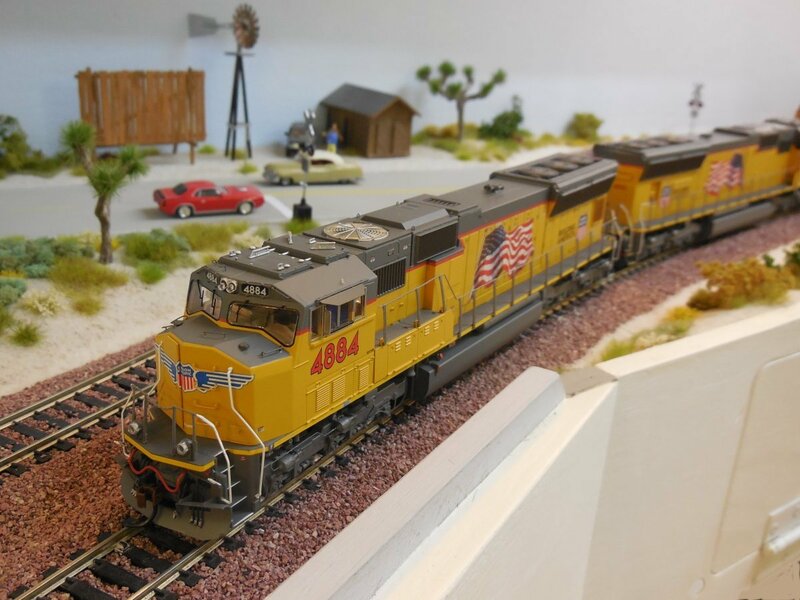 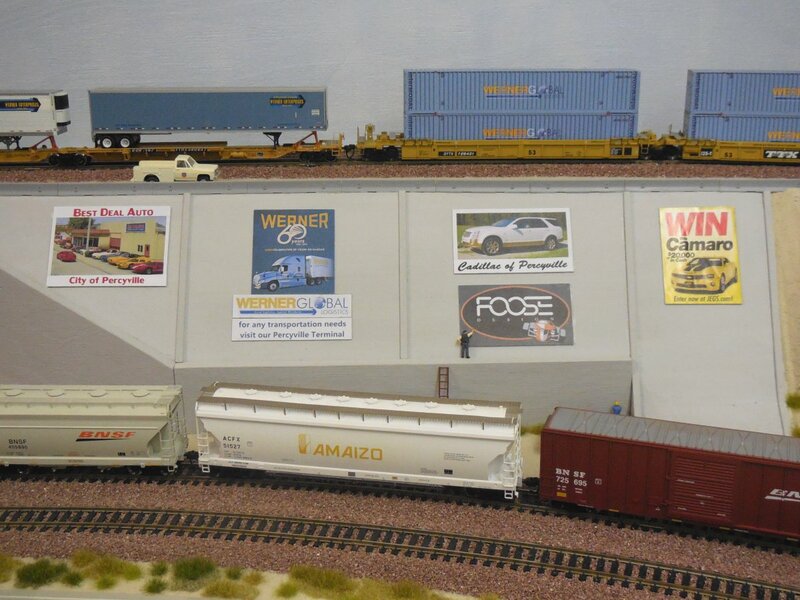 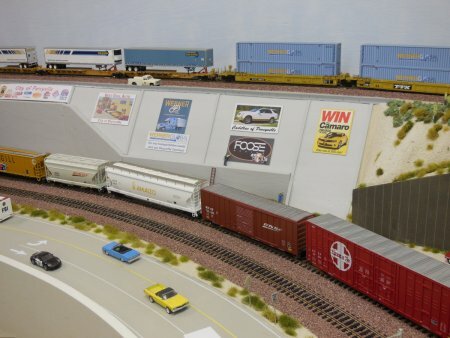 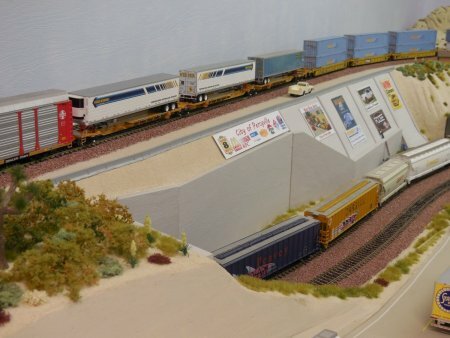 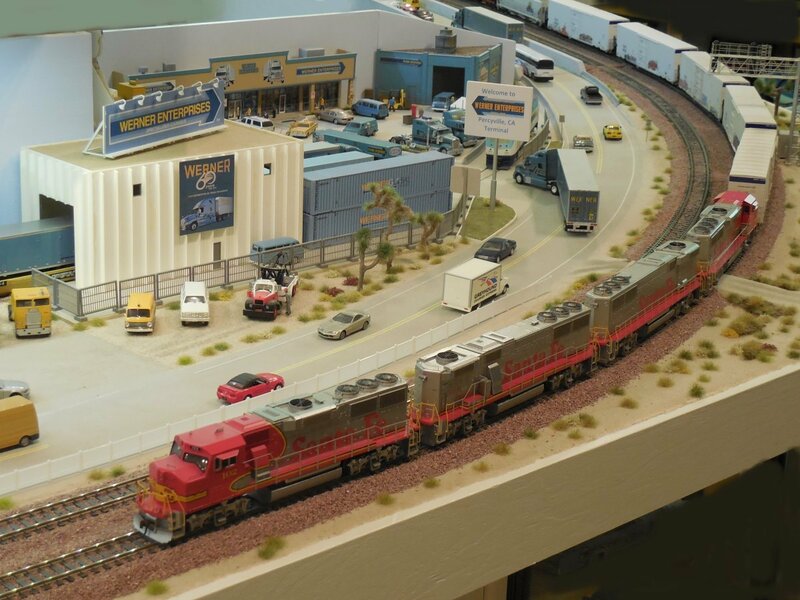 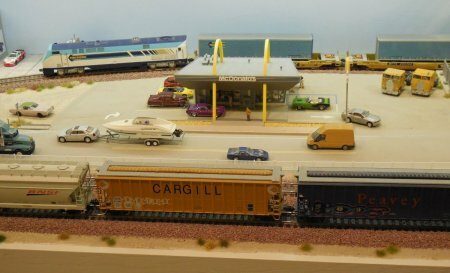 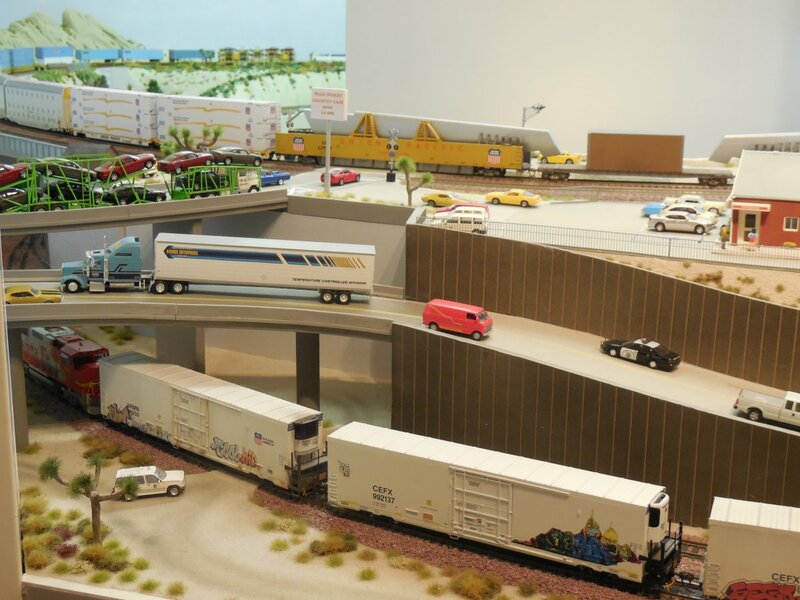 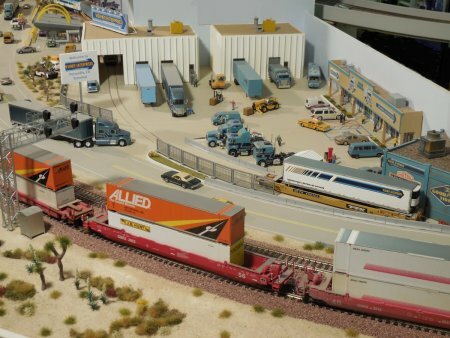 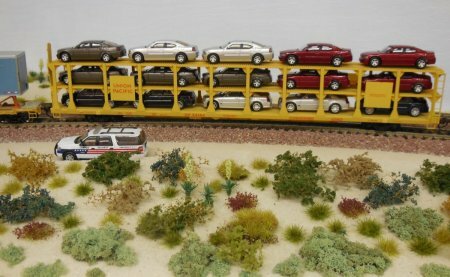 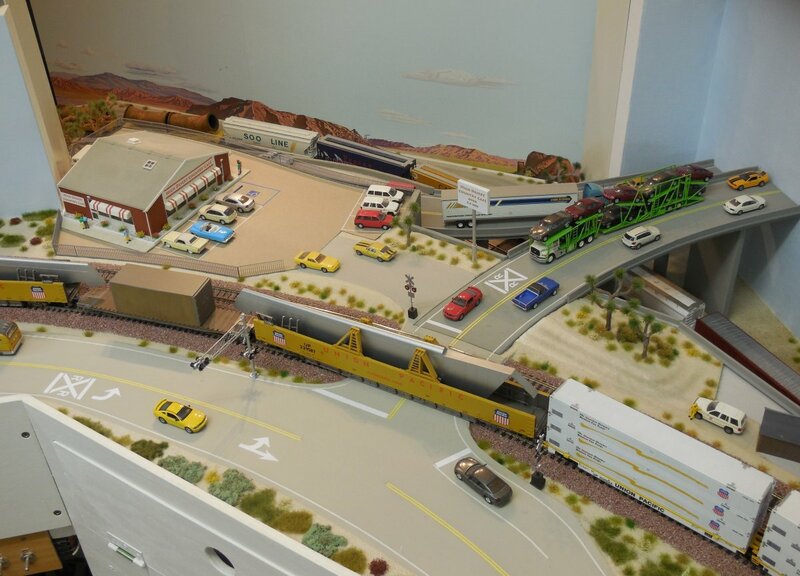 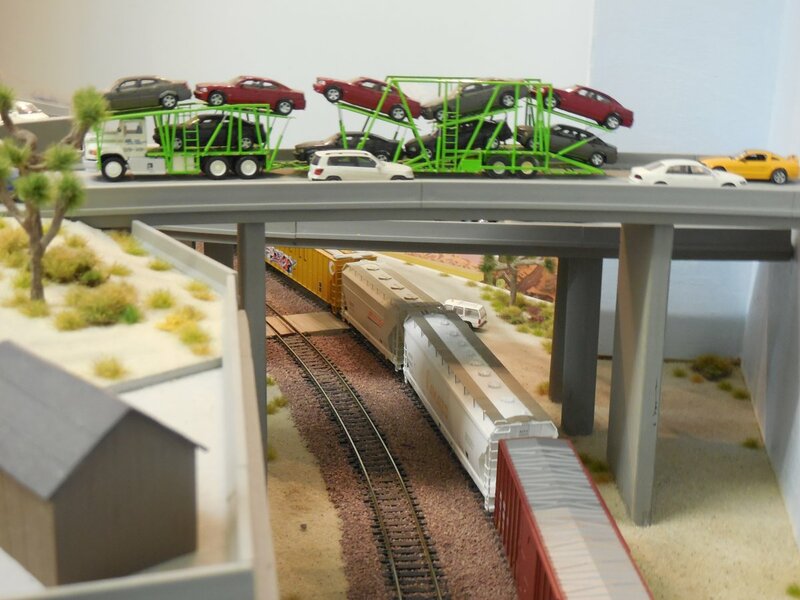 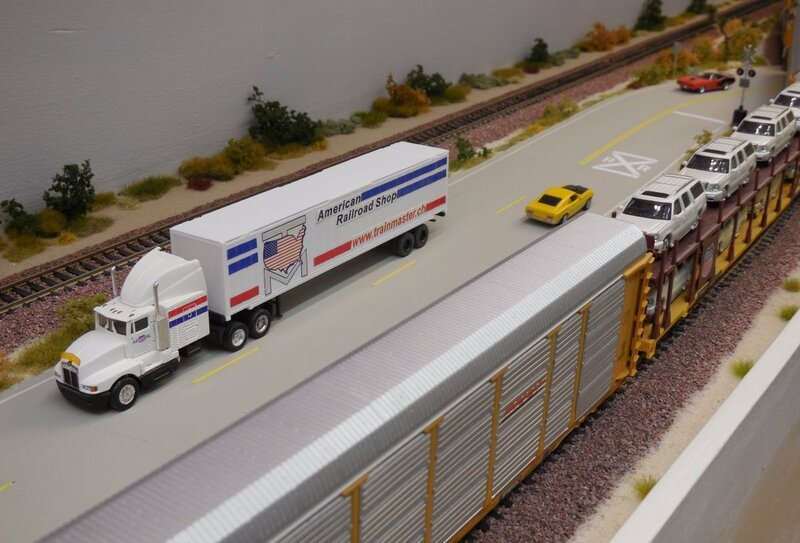 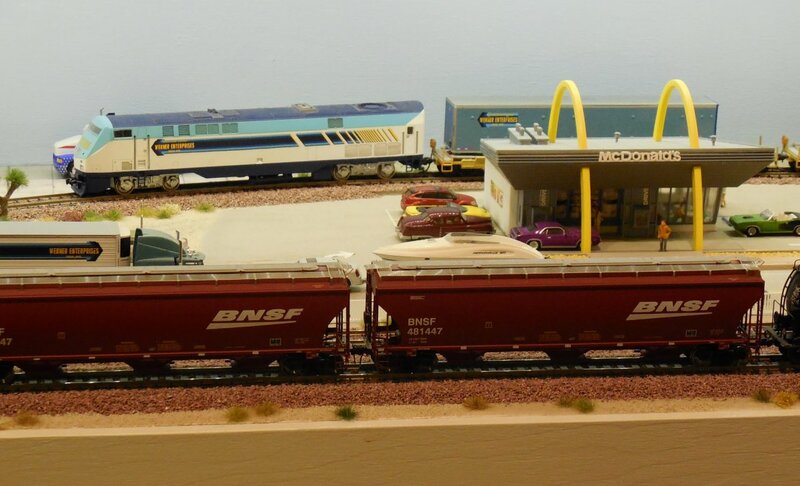 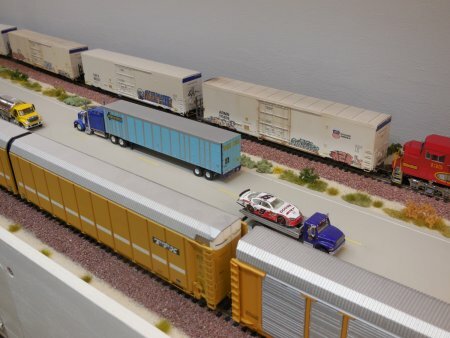 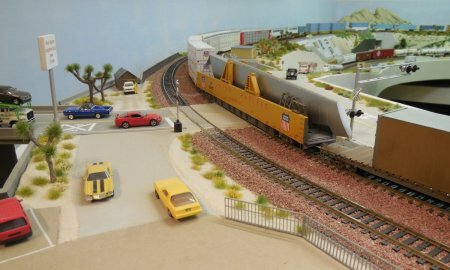 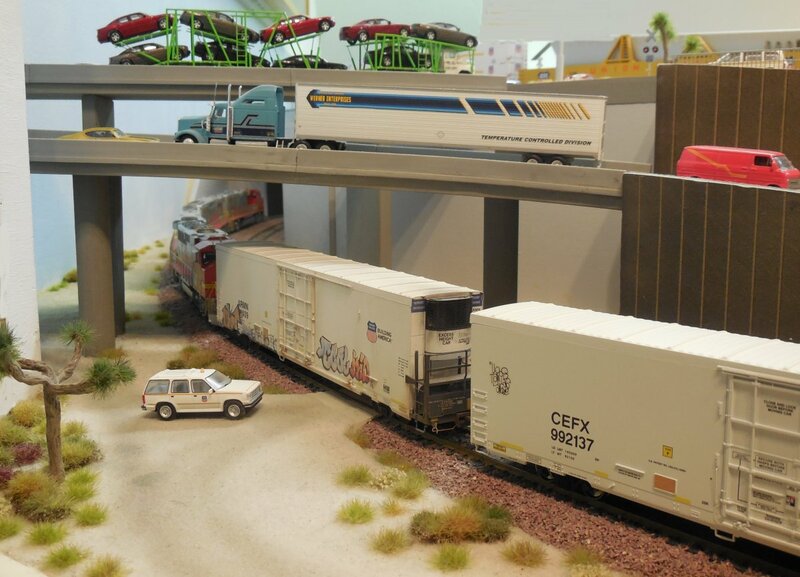 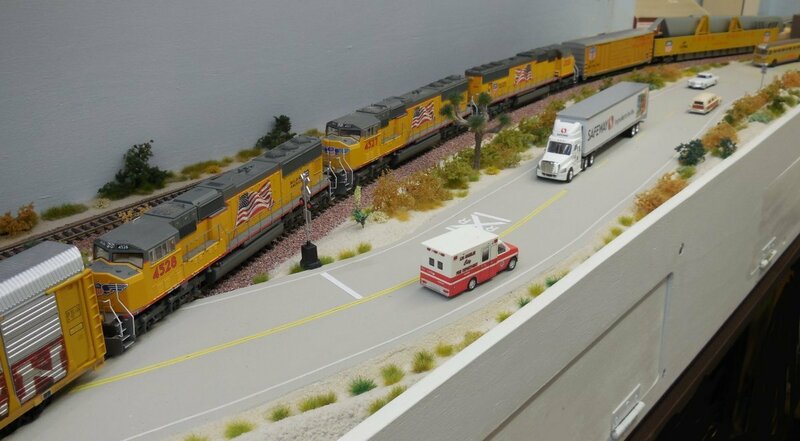 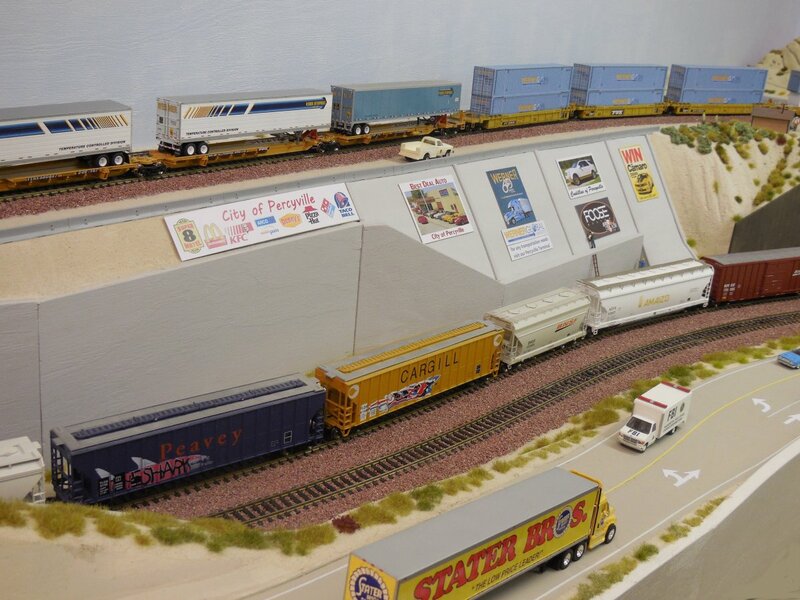 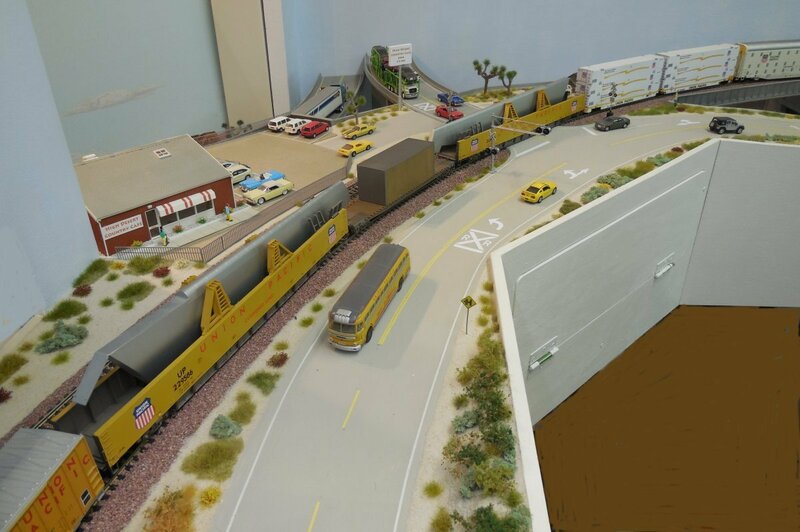 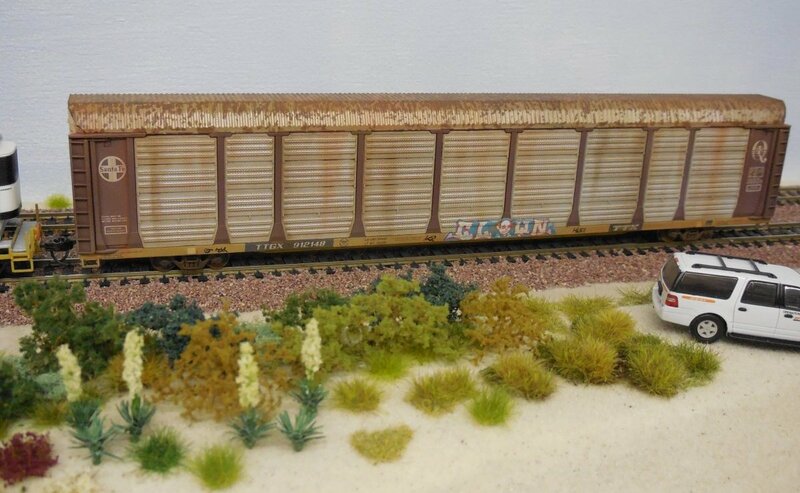 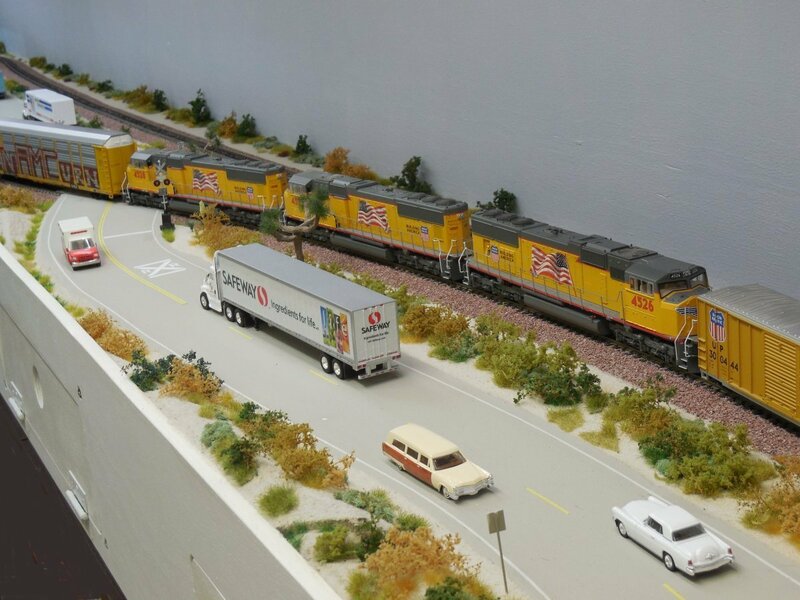 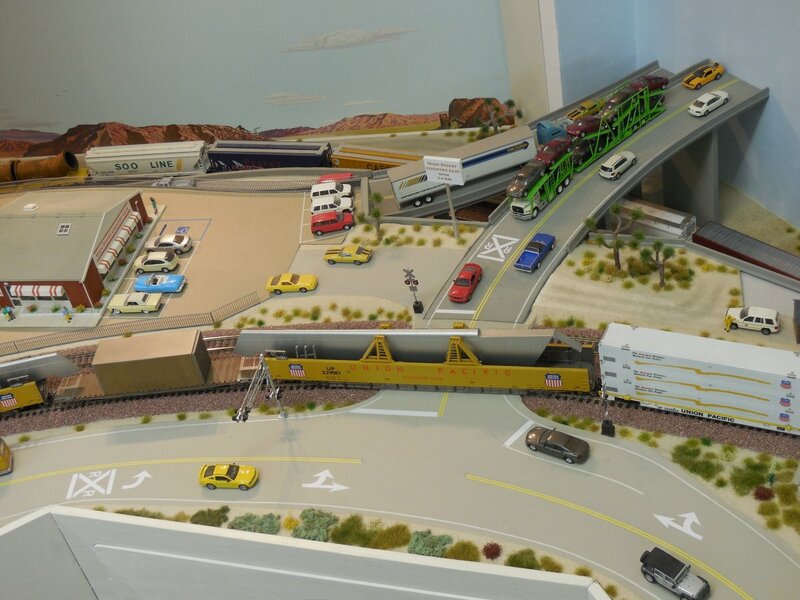 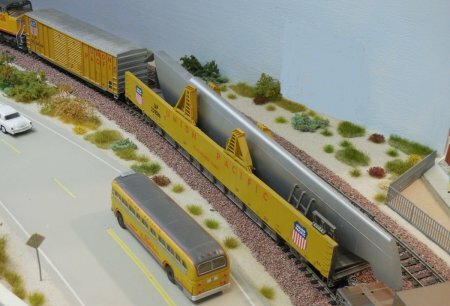 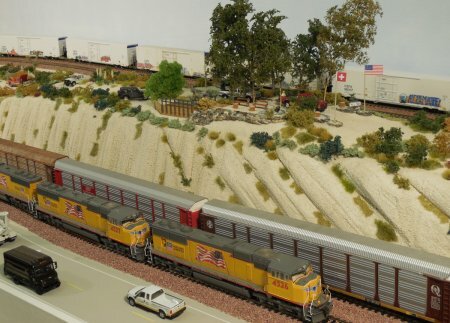 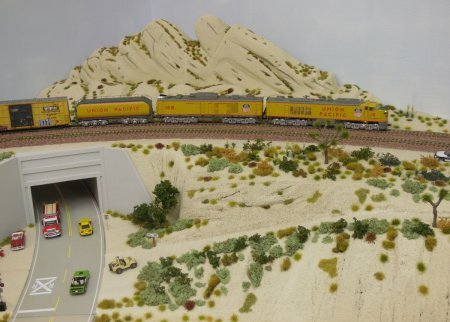 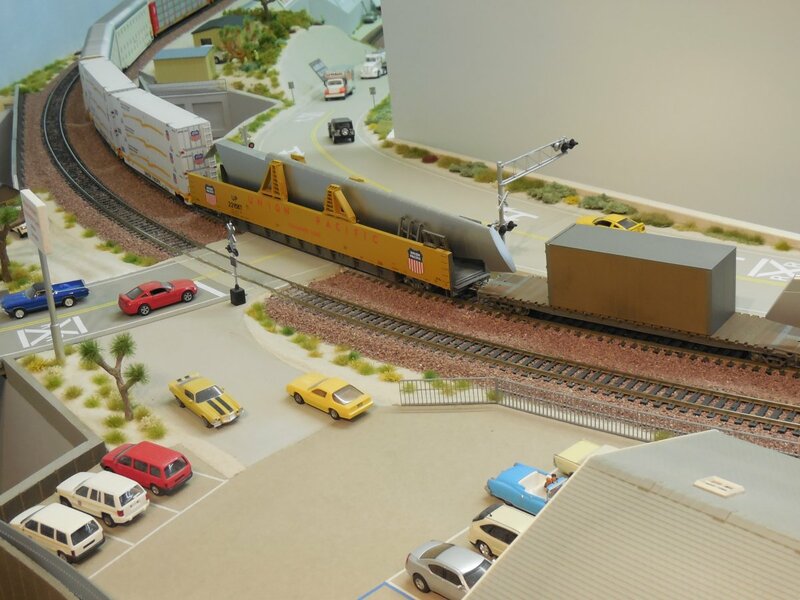 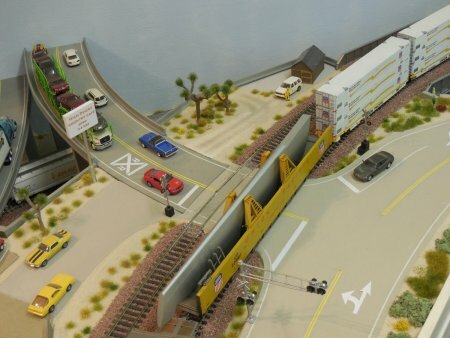 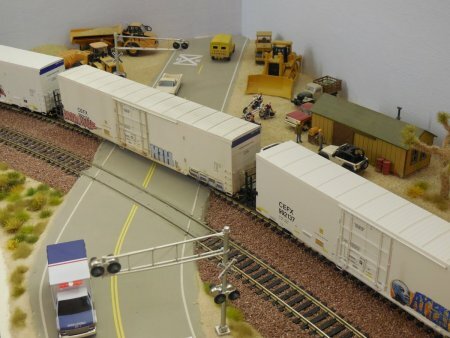 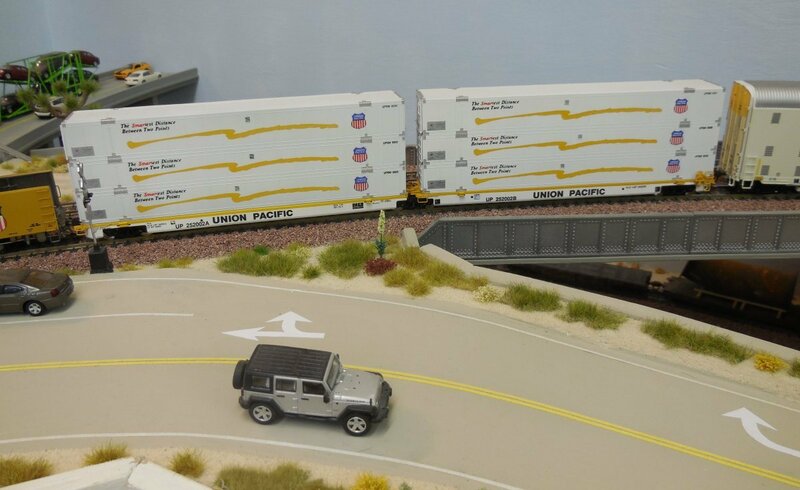 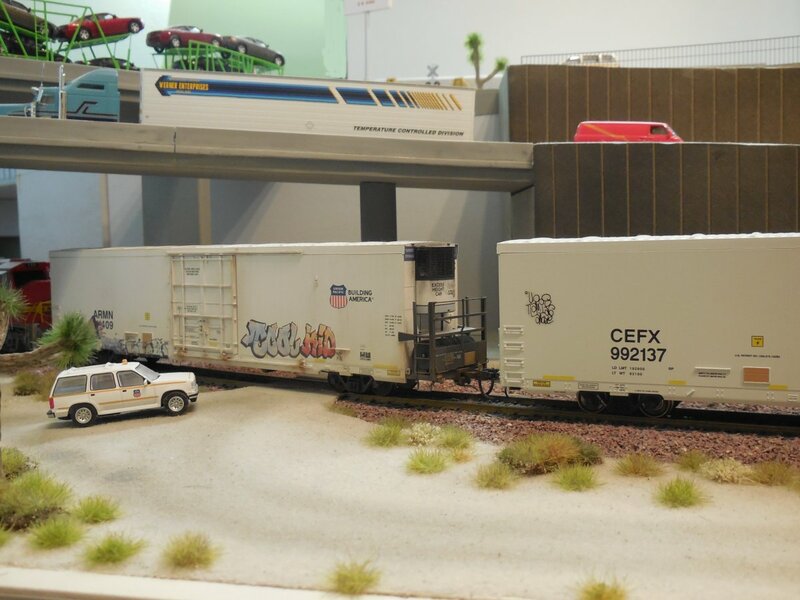 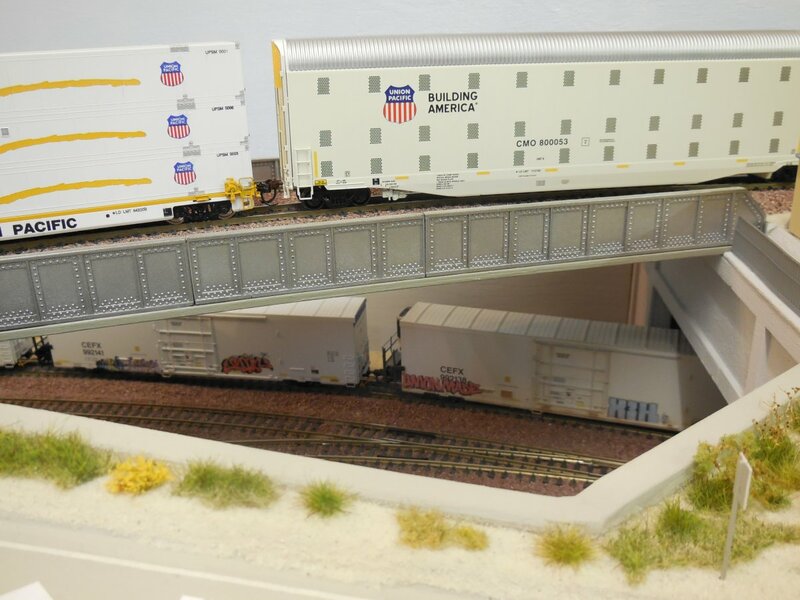 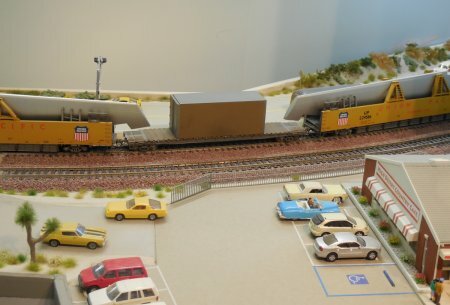 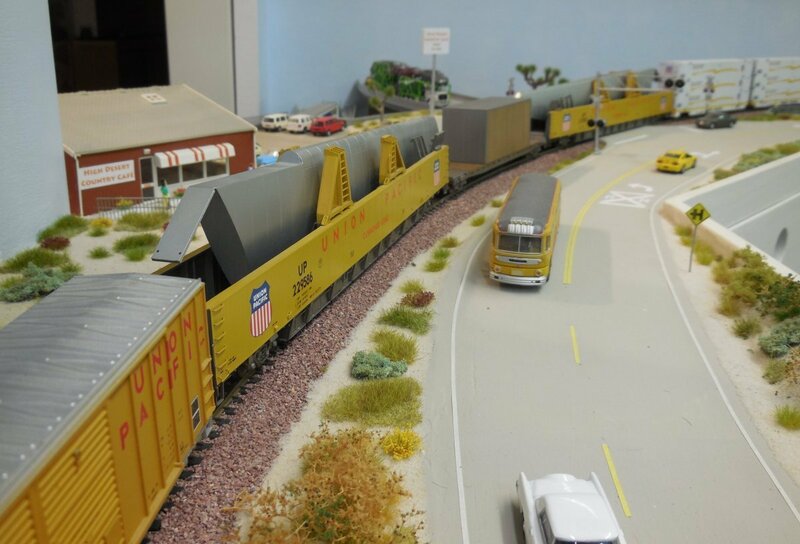 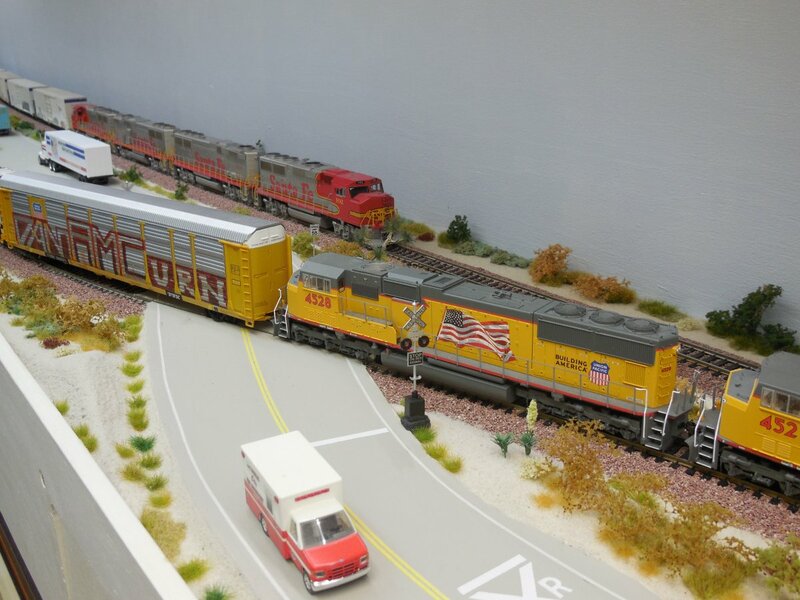 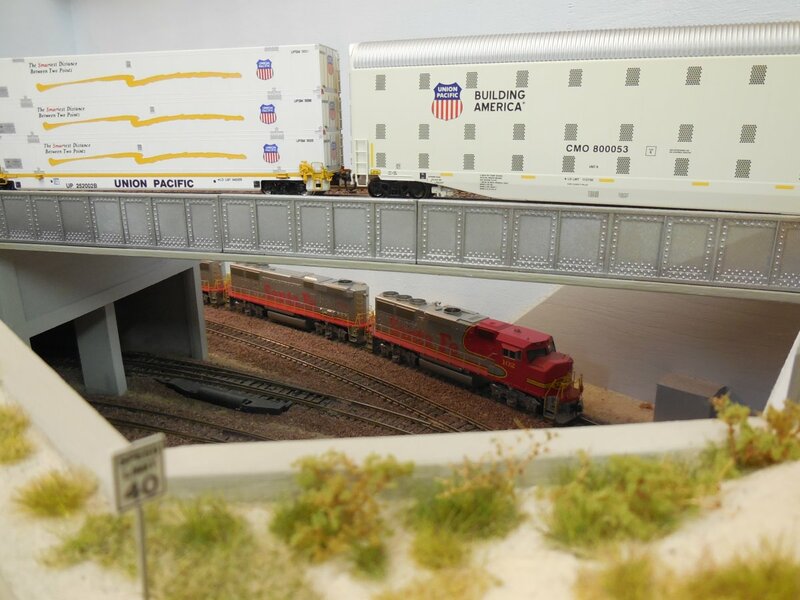 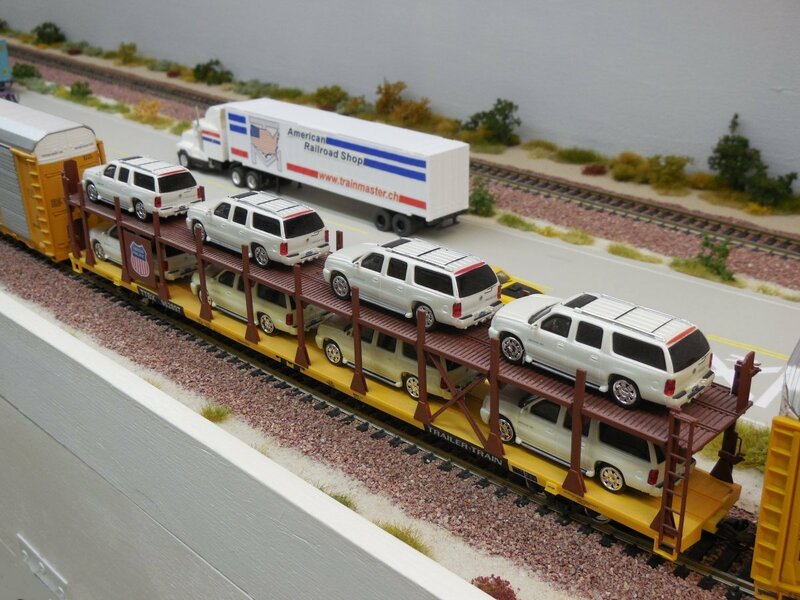 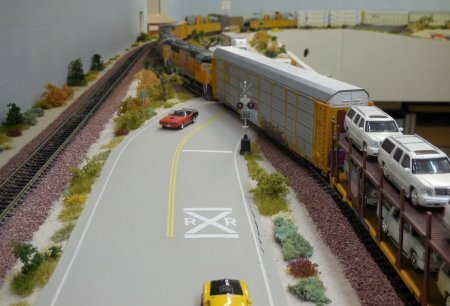 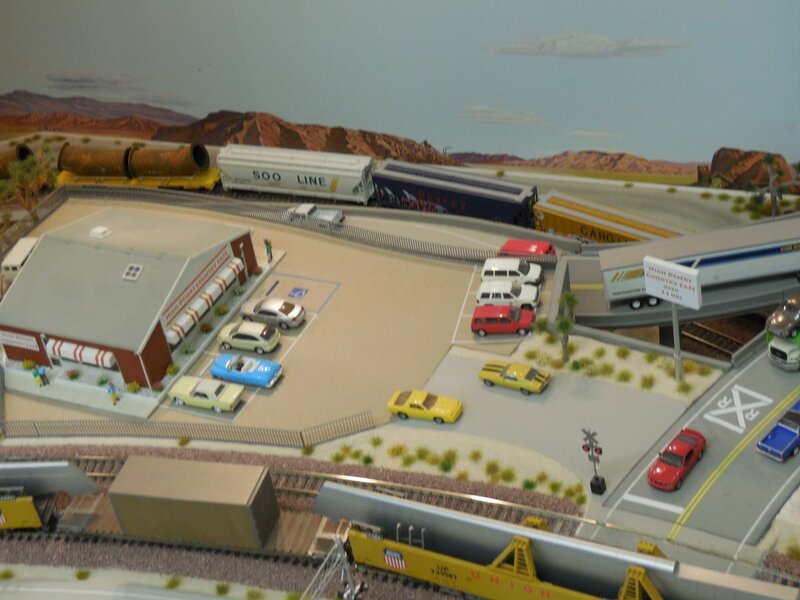 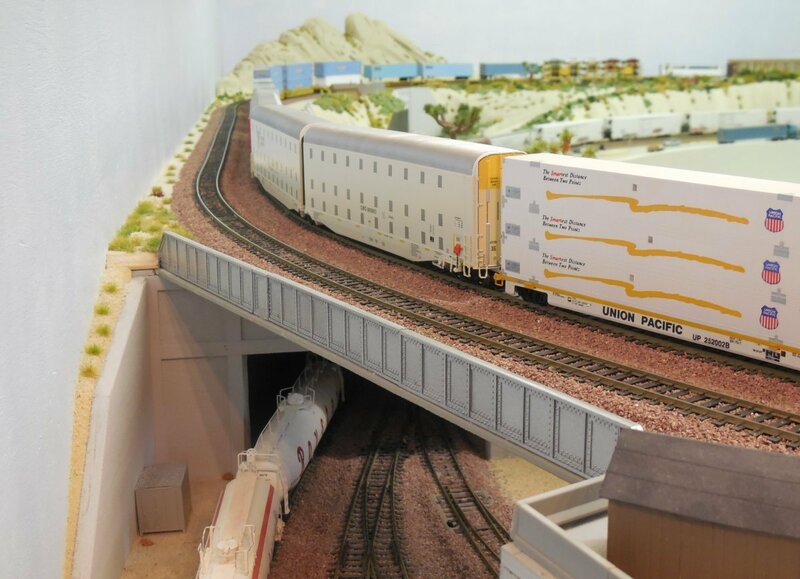 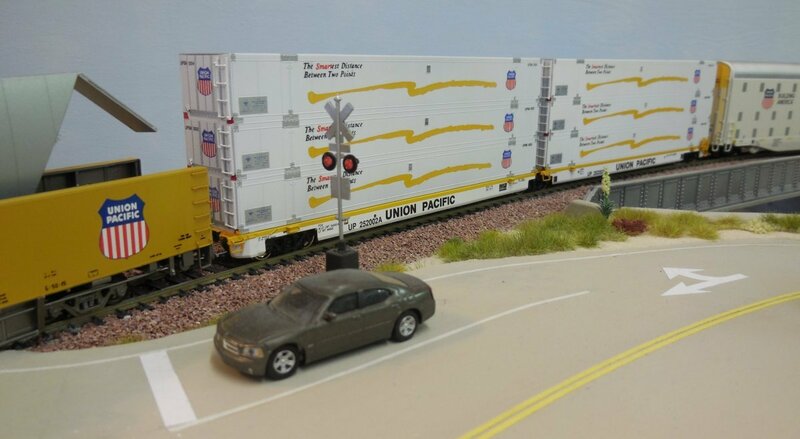 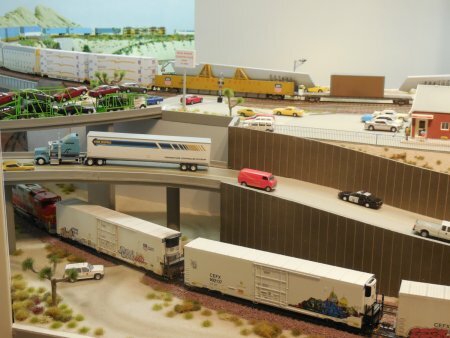 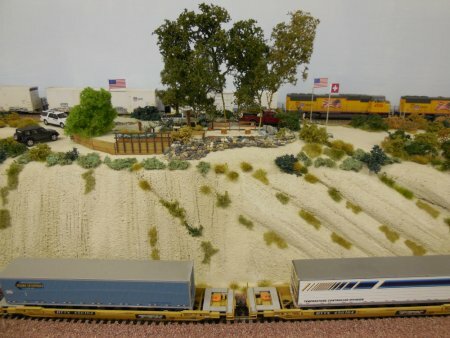 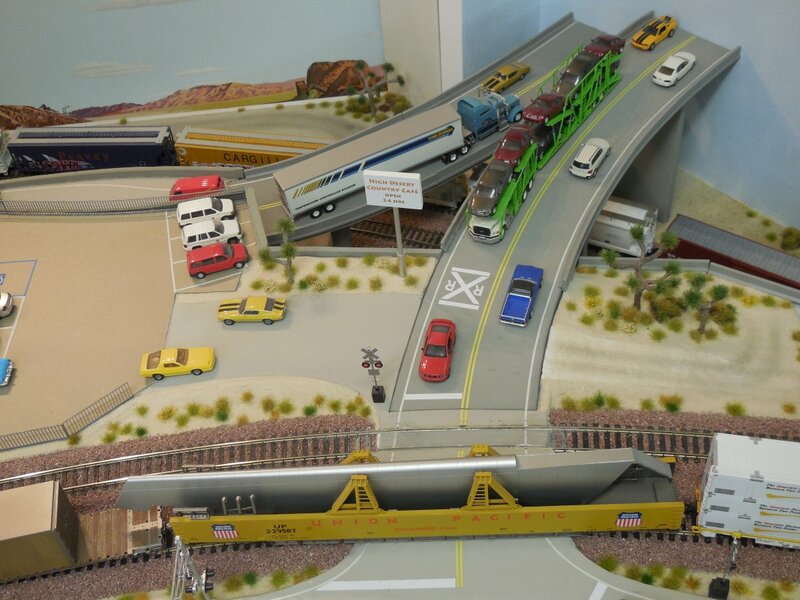 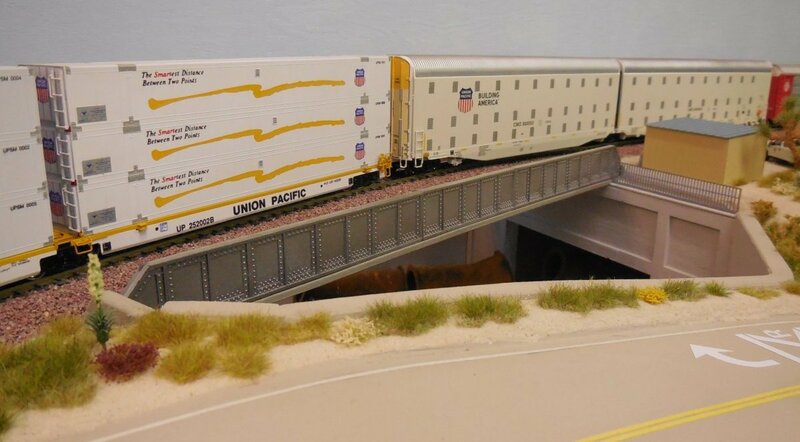 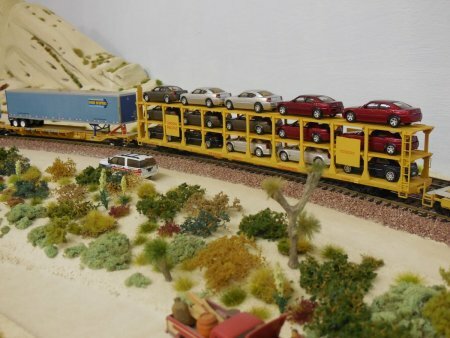 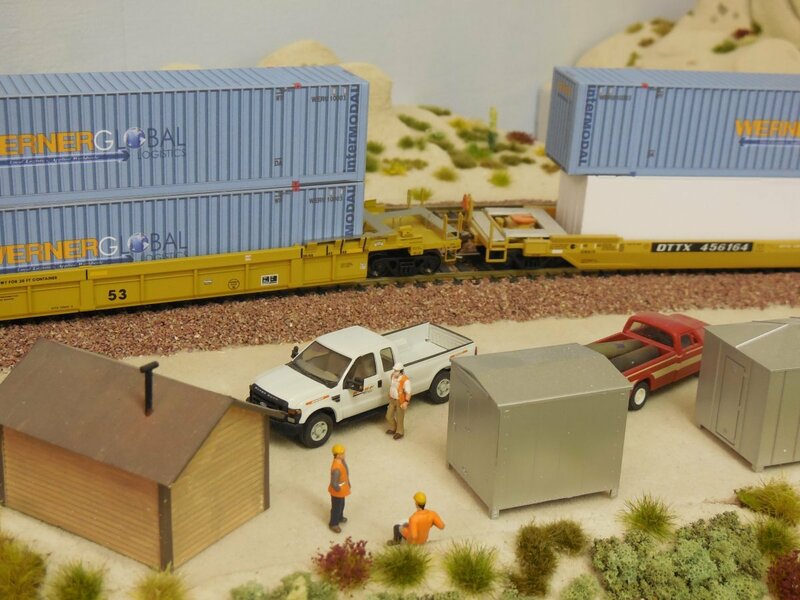 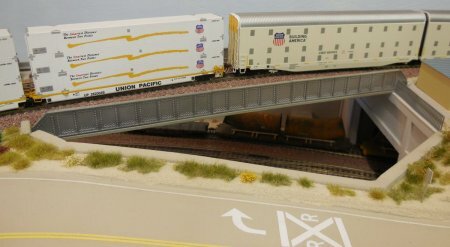 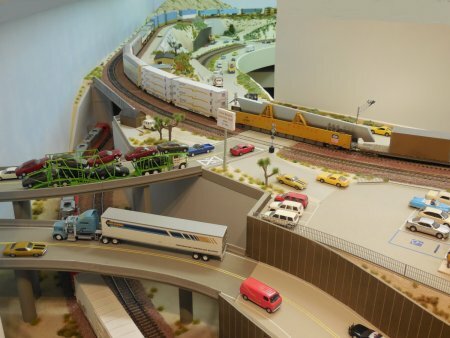 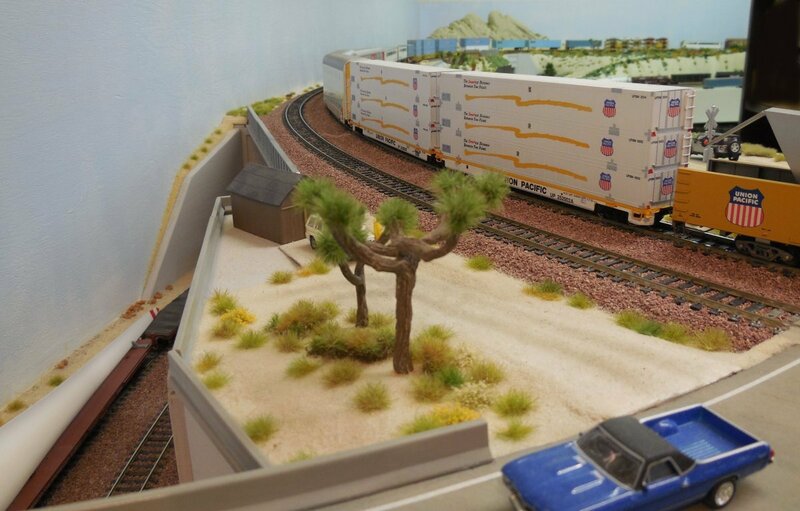 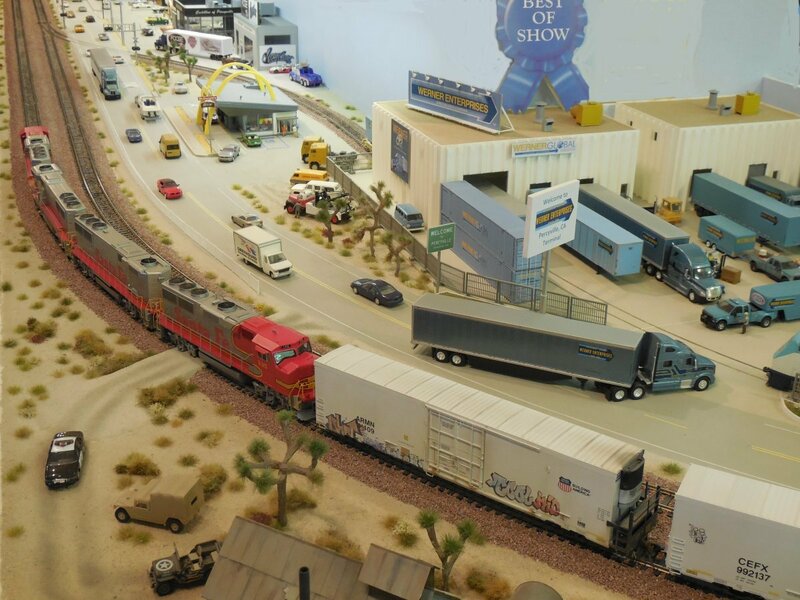 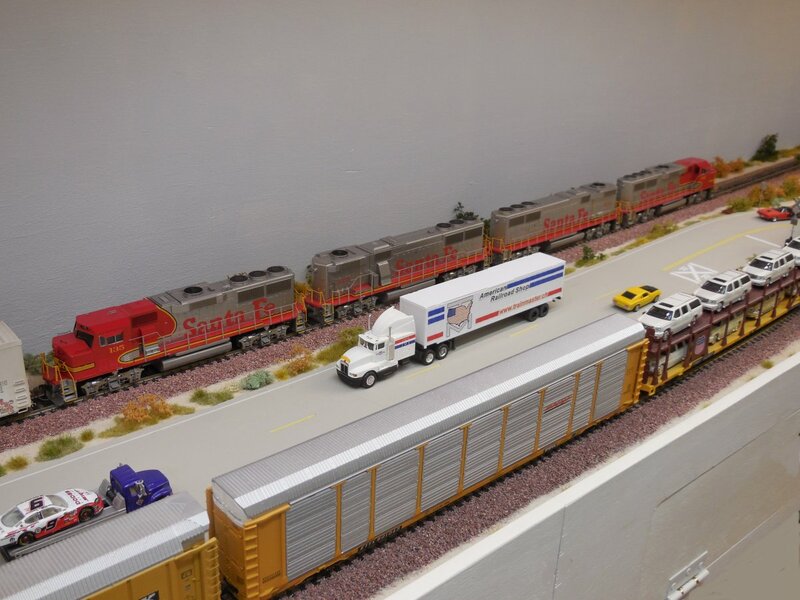 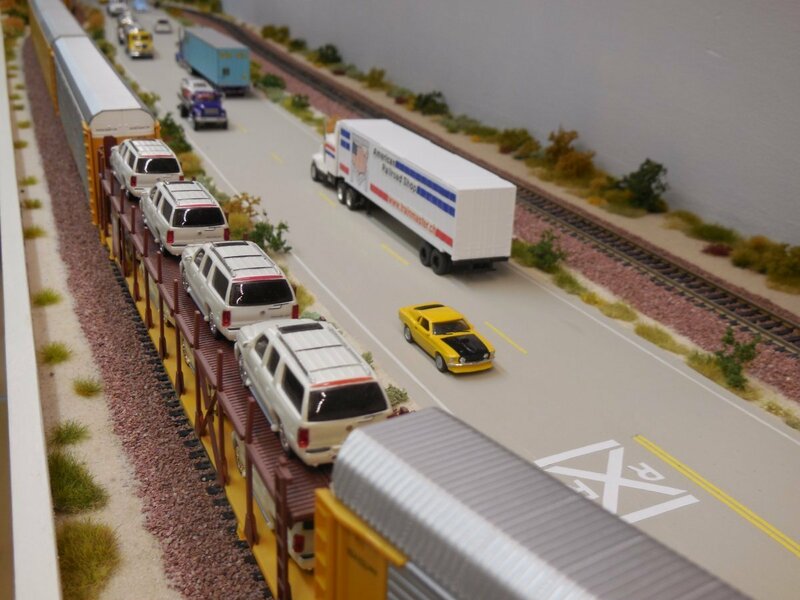 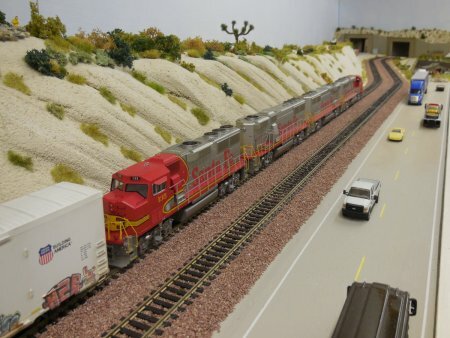 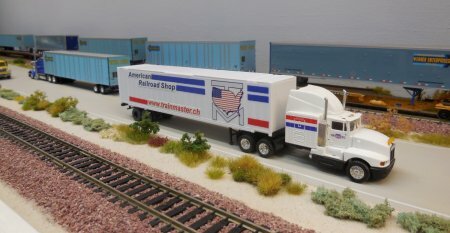 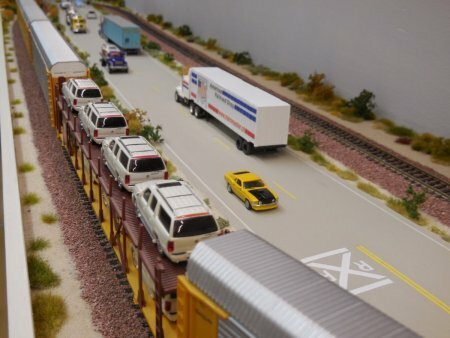 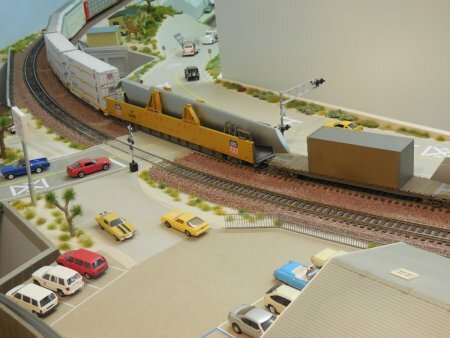 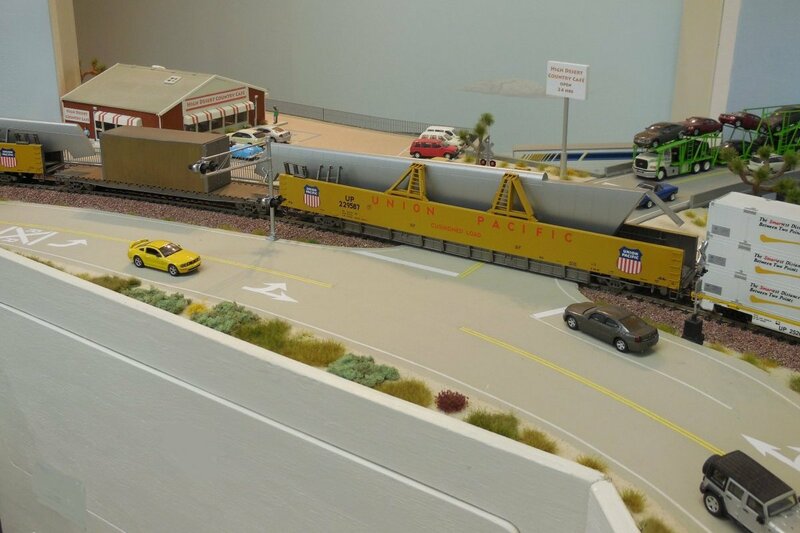 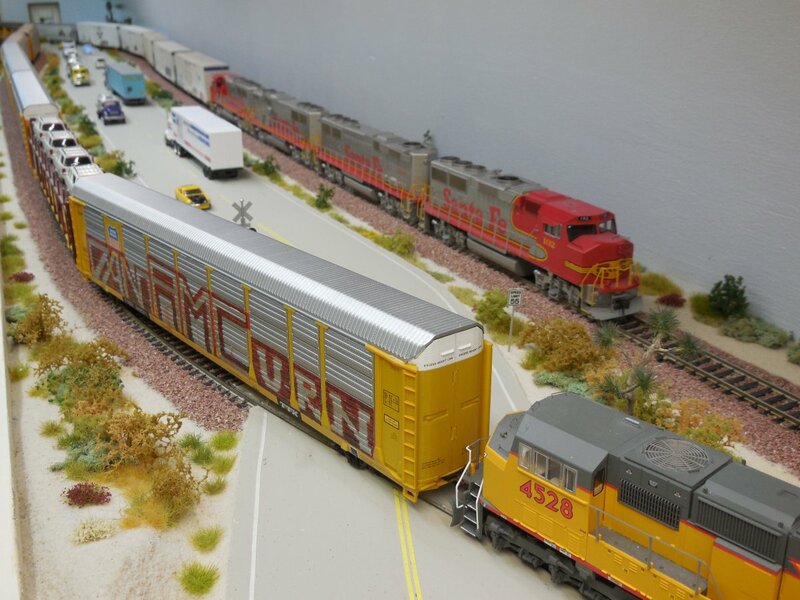 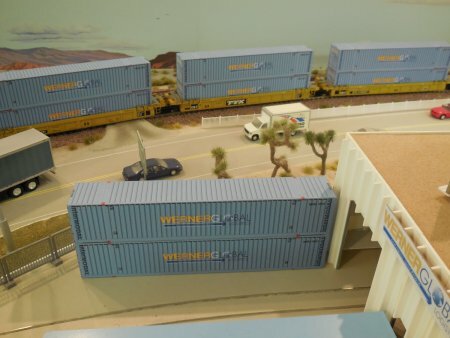 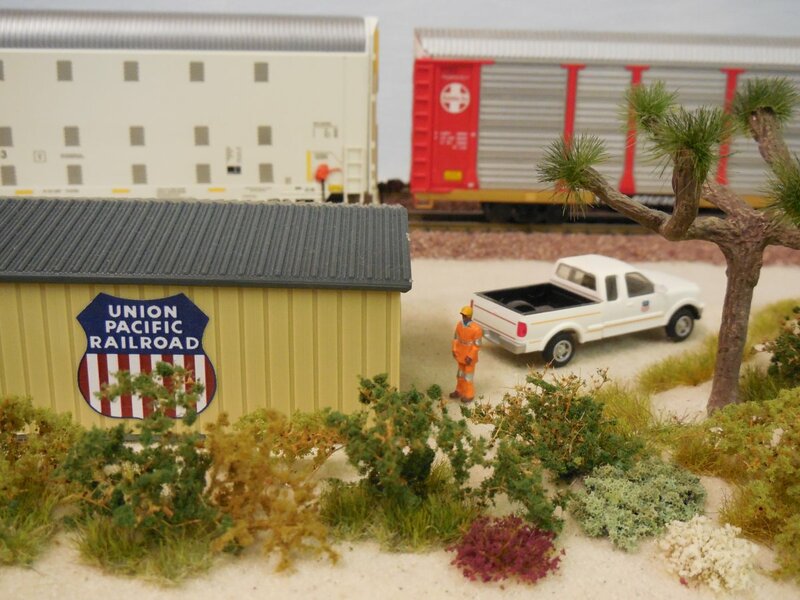 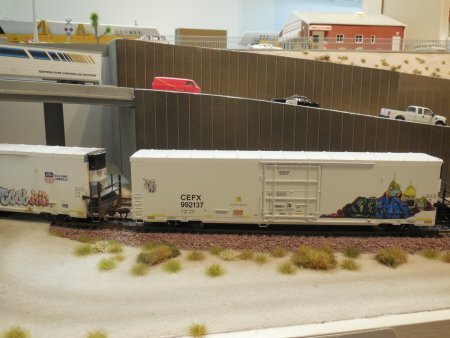 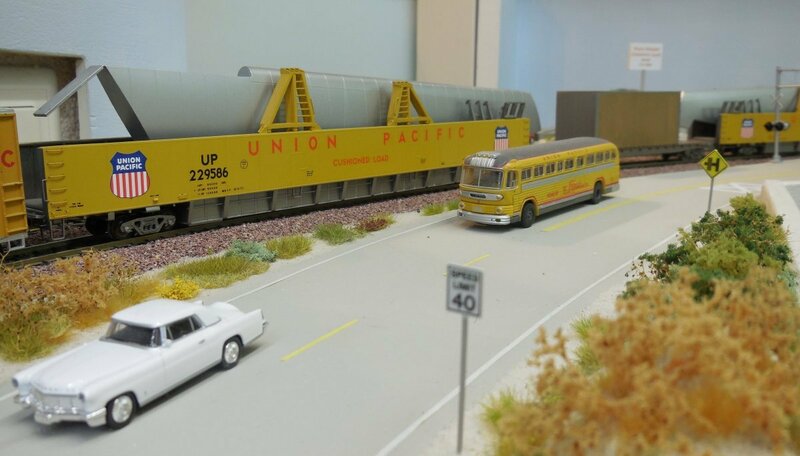 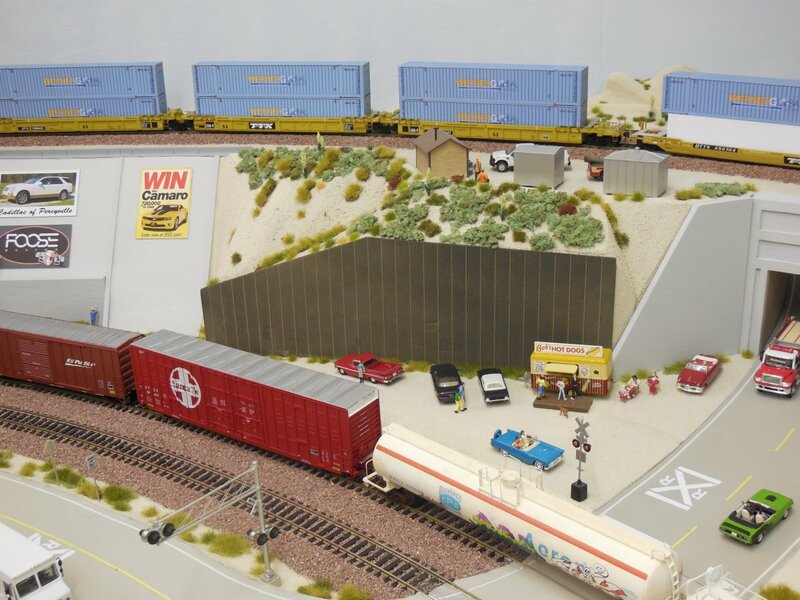 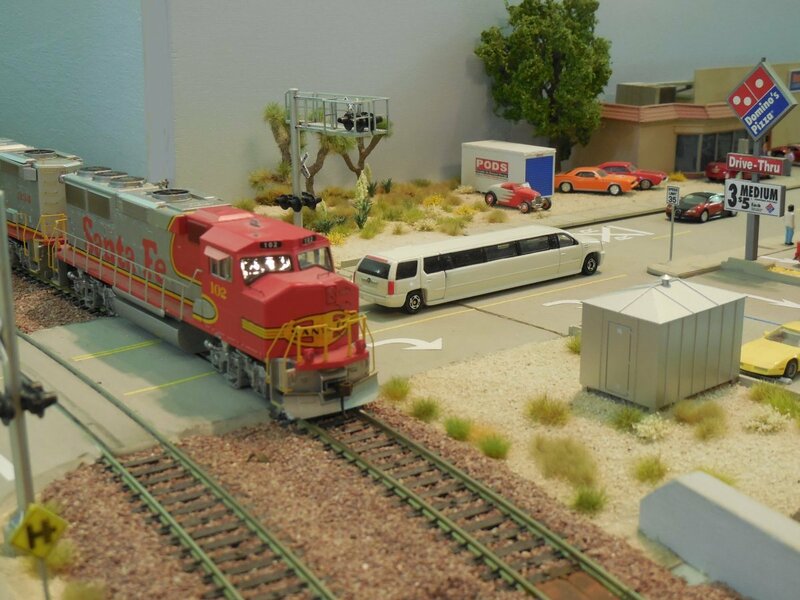 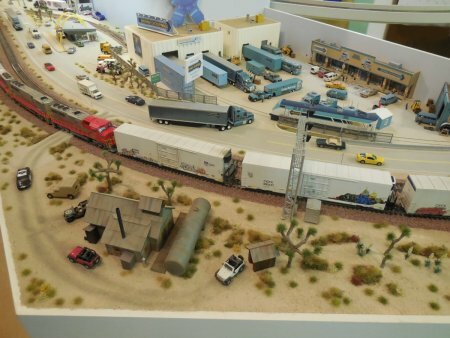 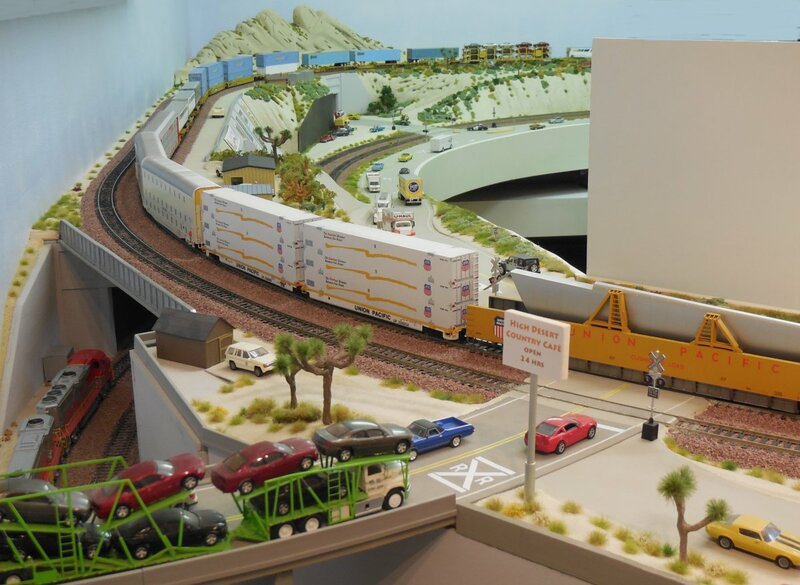 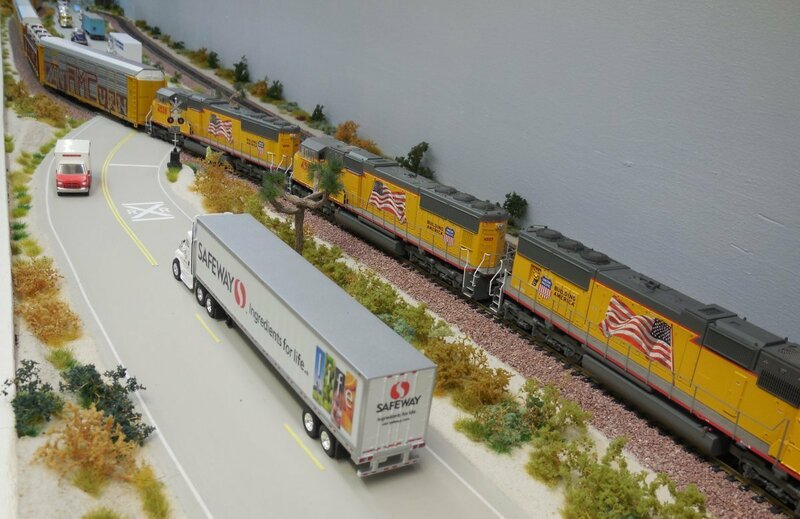 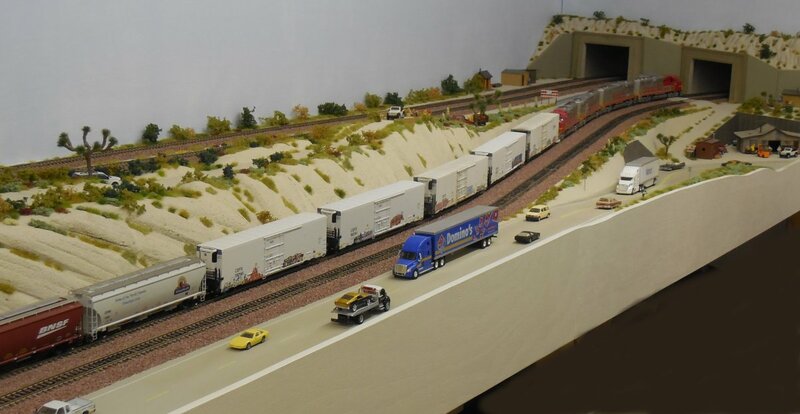 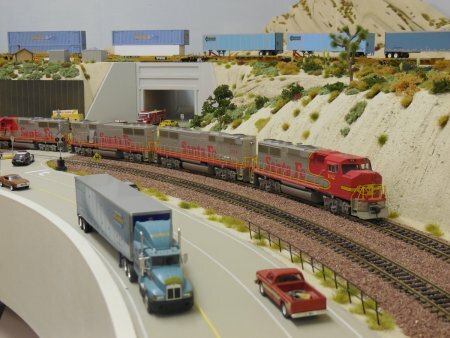 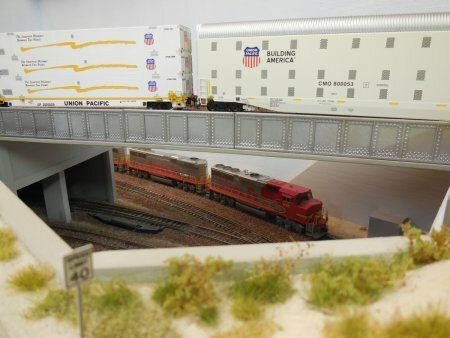 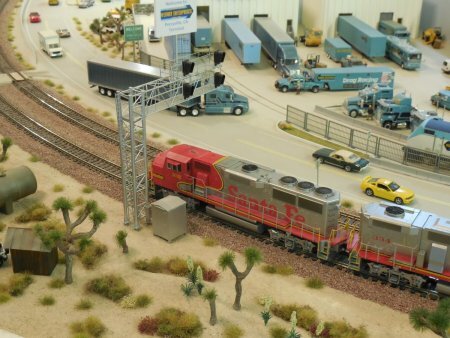 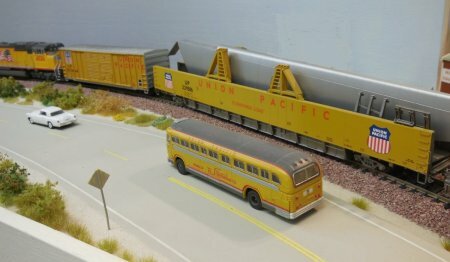 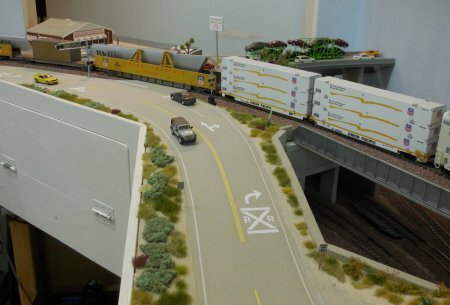 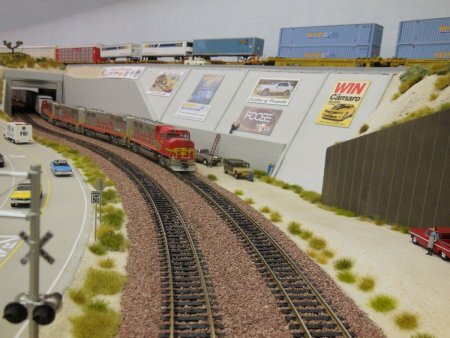 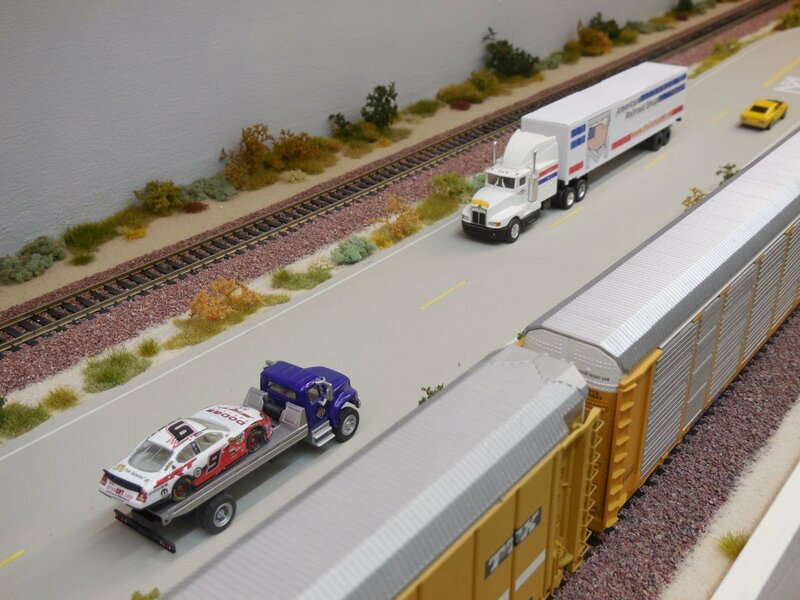 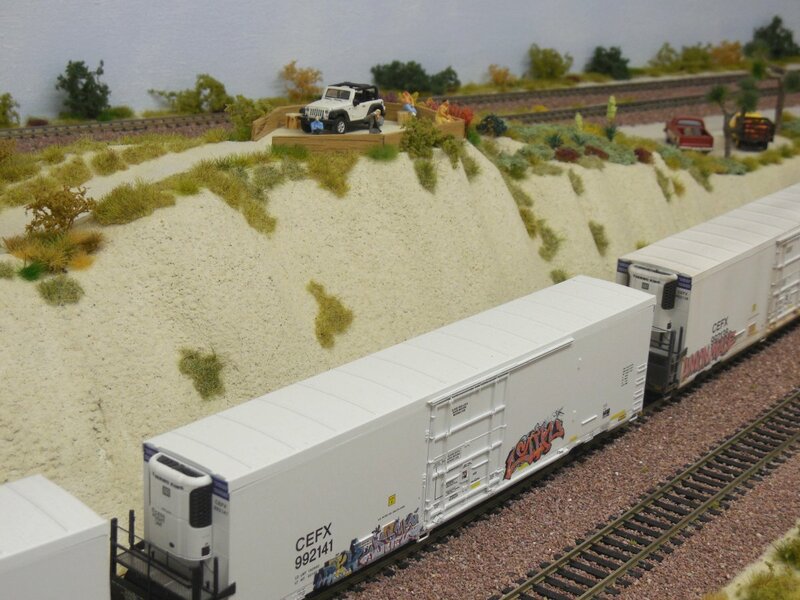 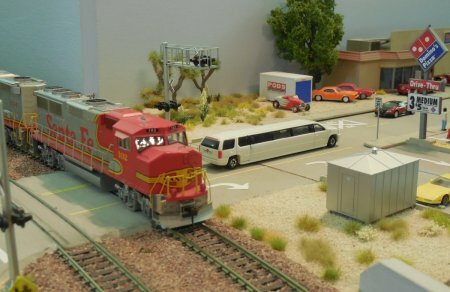 Union Pacific combined Auto Carrier, Intermodal and special equipment. 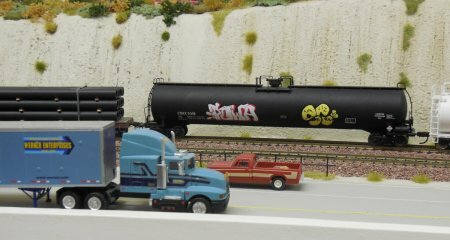 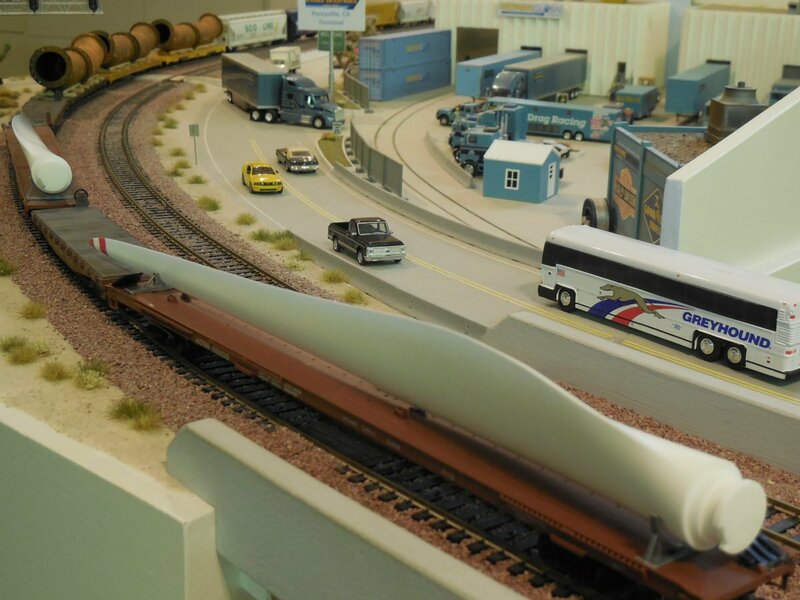 My UP train consists of 2 SD70M diesels with flared radiators, several Auto carriers, 3 SD70M diesels as mid train DPU's, a DC-10 Wing Gondola, Tri-Level Smart Car (UP experimental), Auto Rack, Double Stack and TOFC cars. This train is not rolling but we are following from front to rear. 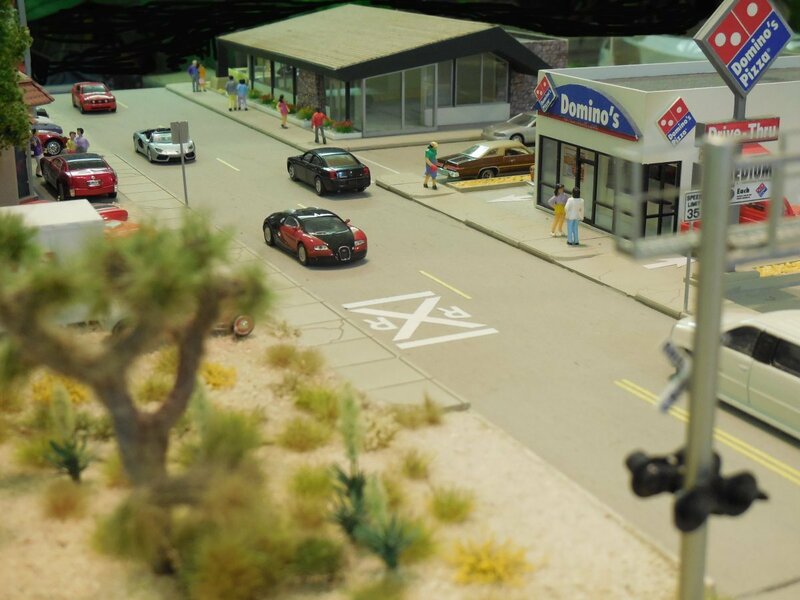 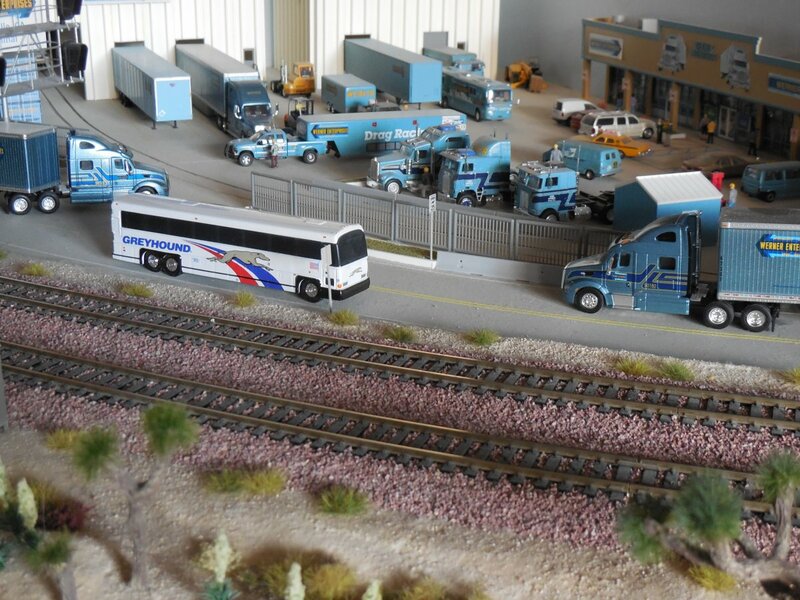 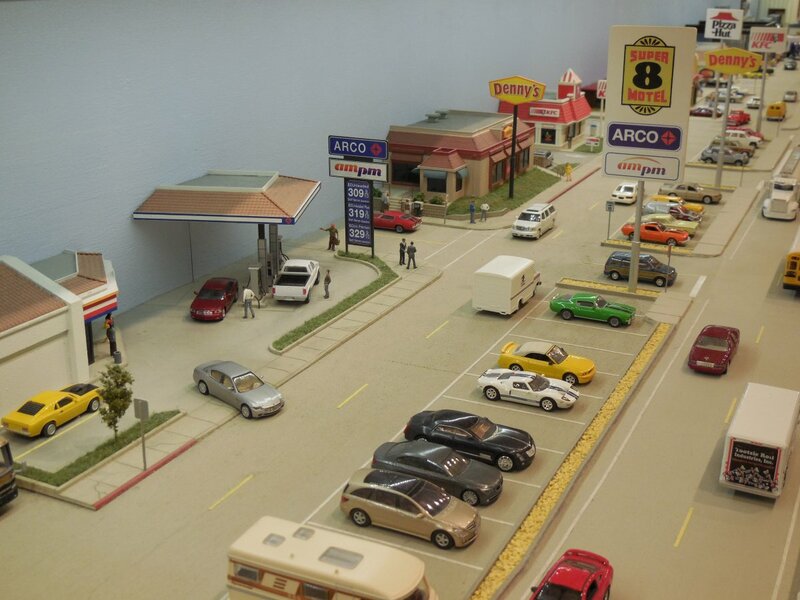 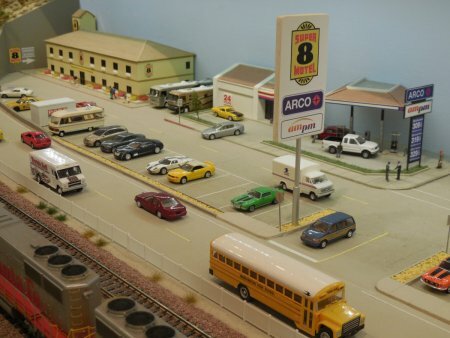 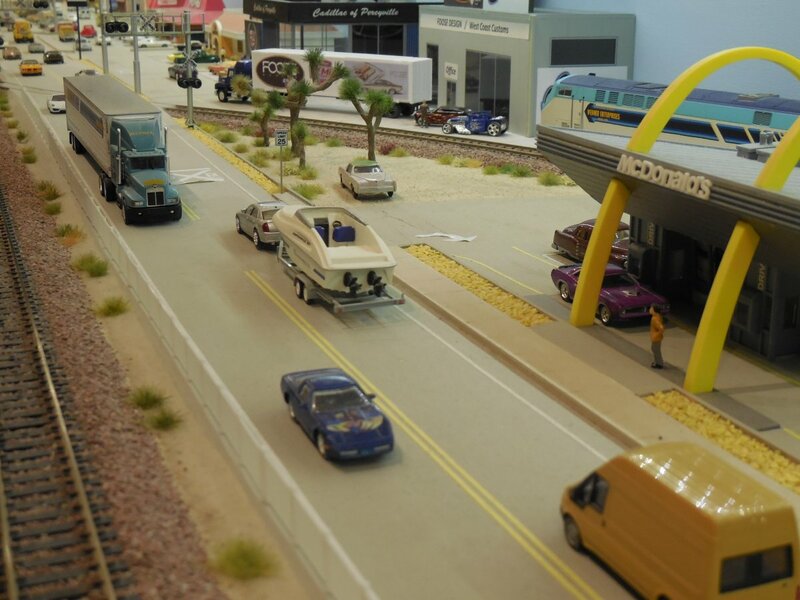 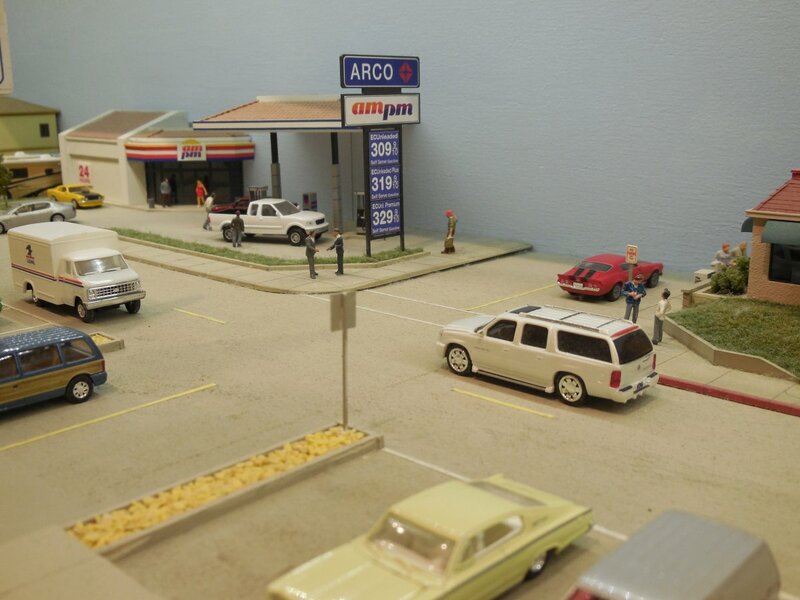 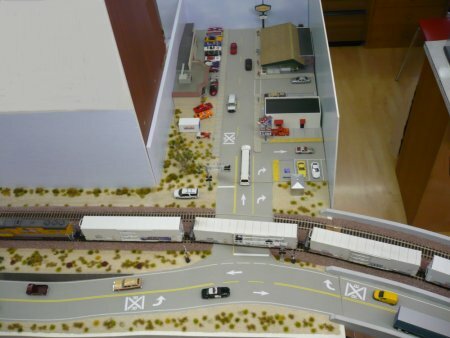 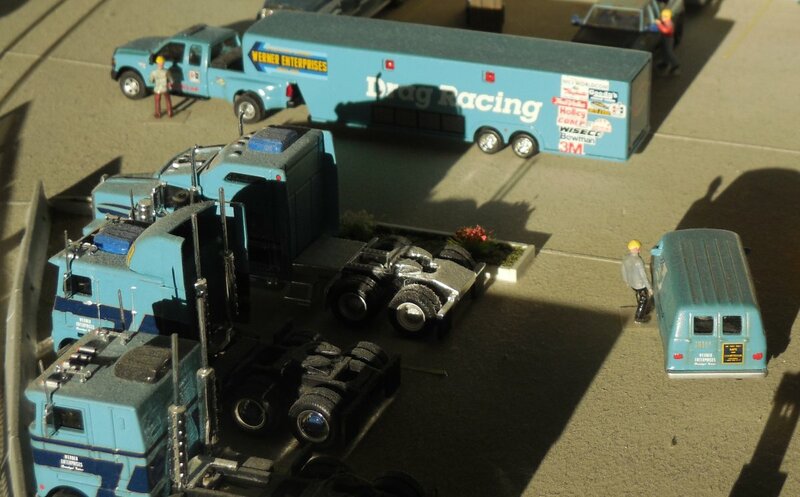 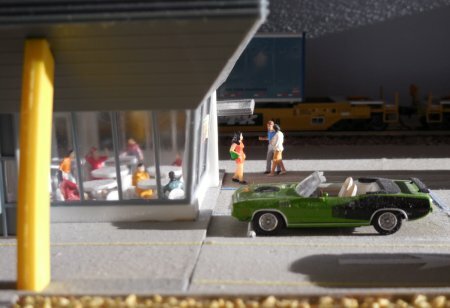 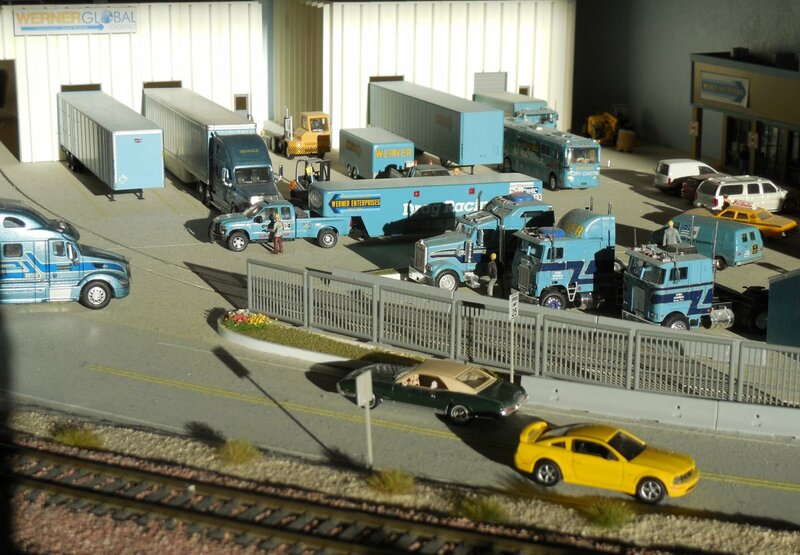 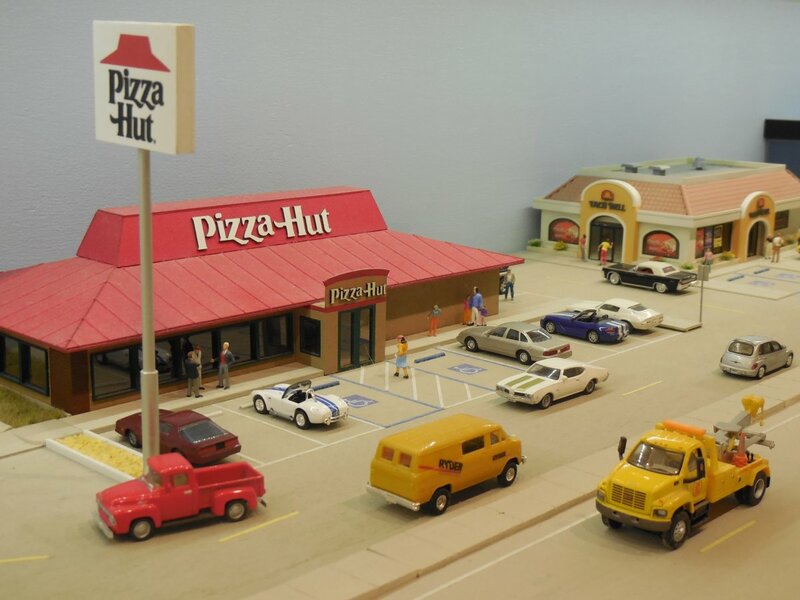 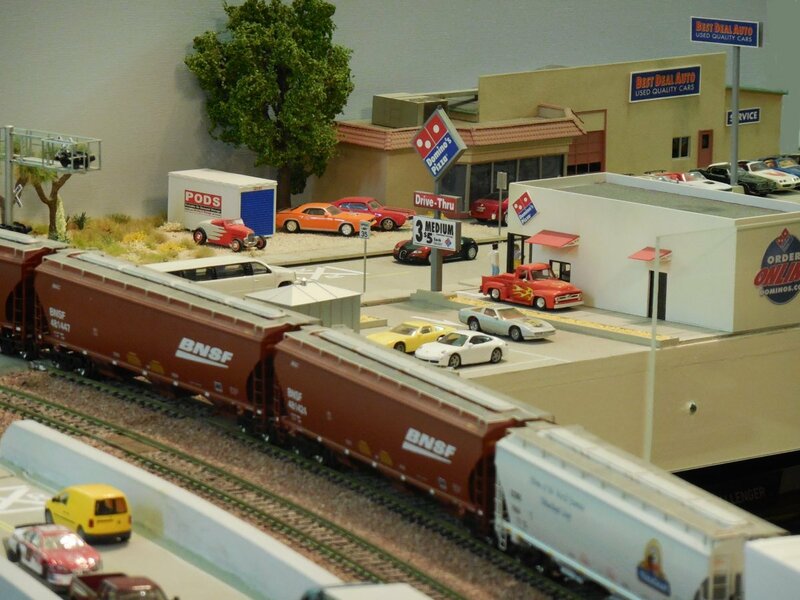 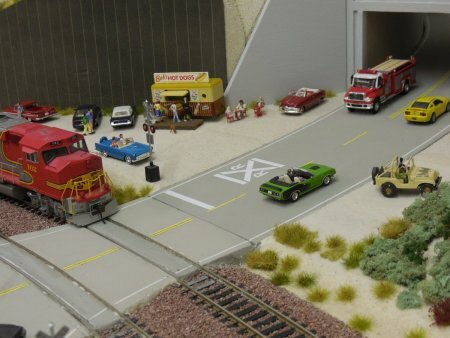 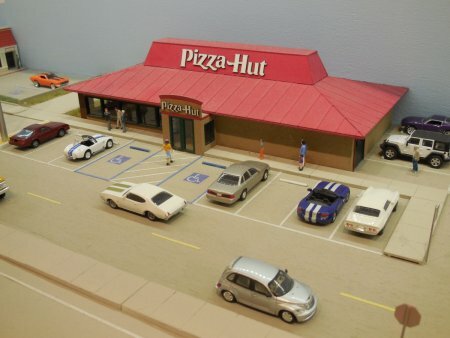 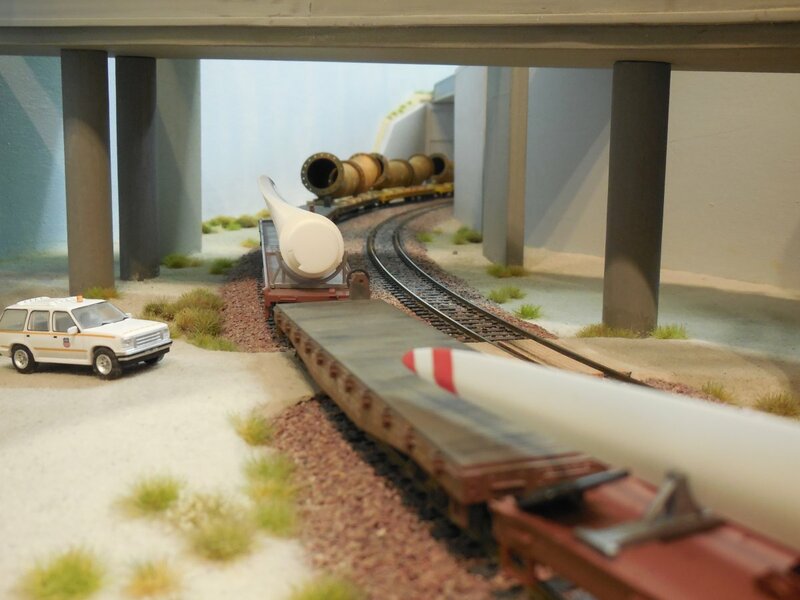 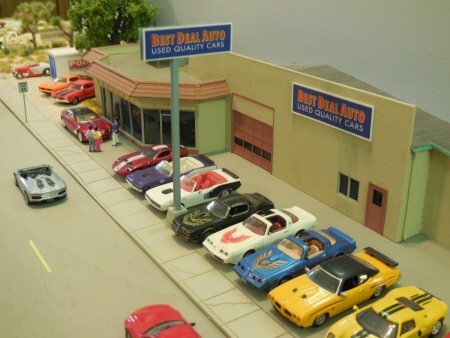 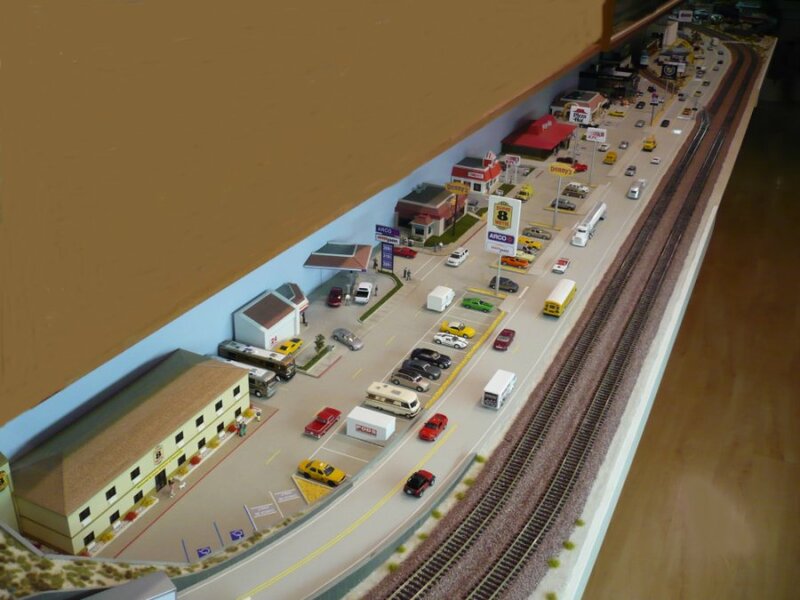 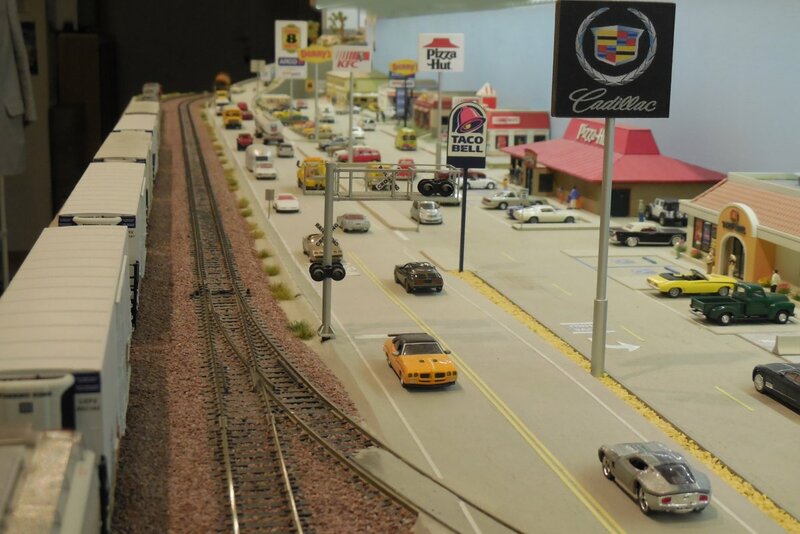 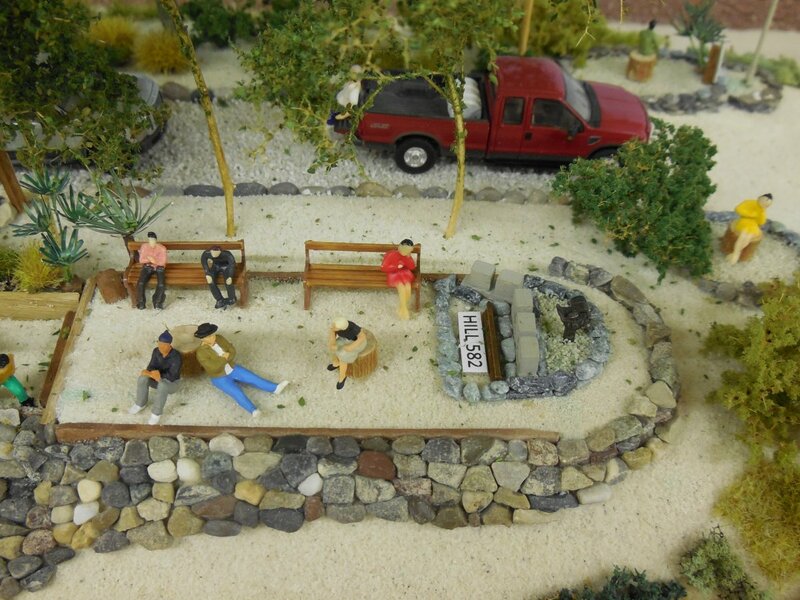 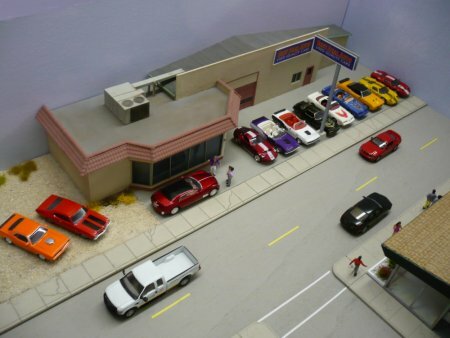 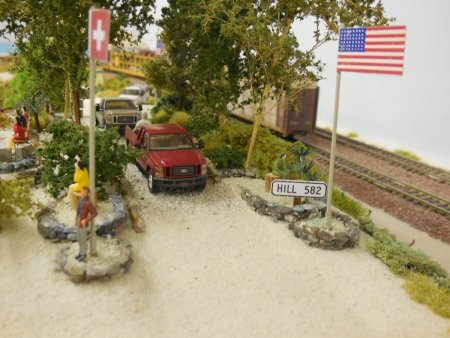 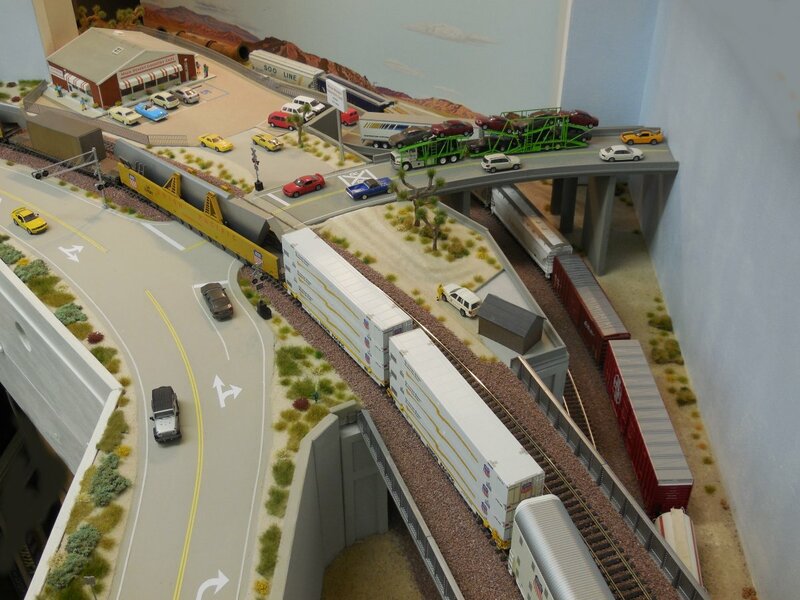 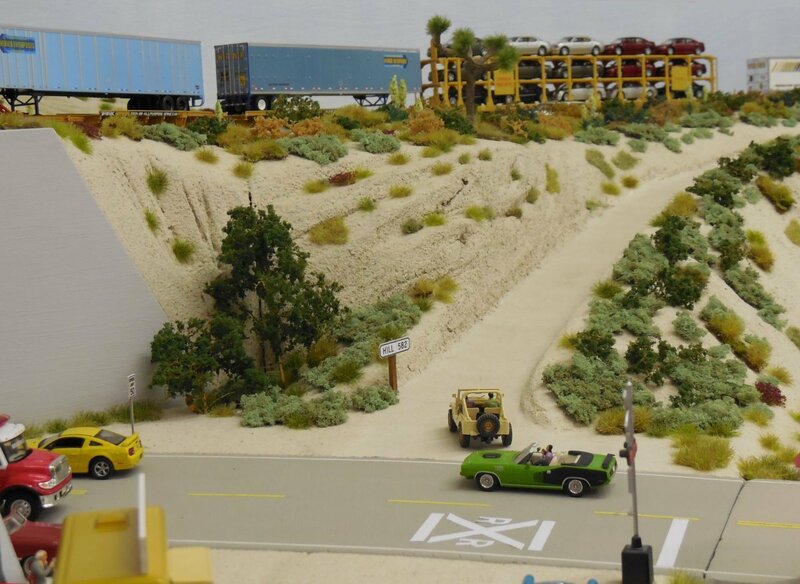 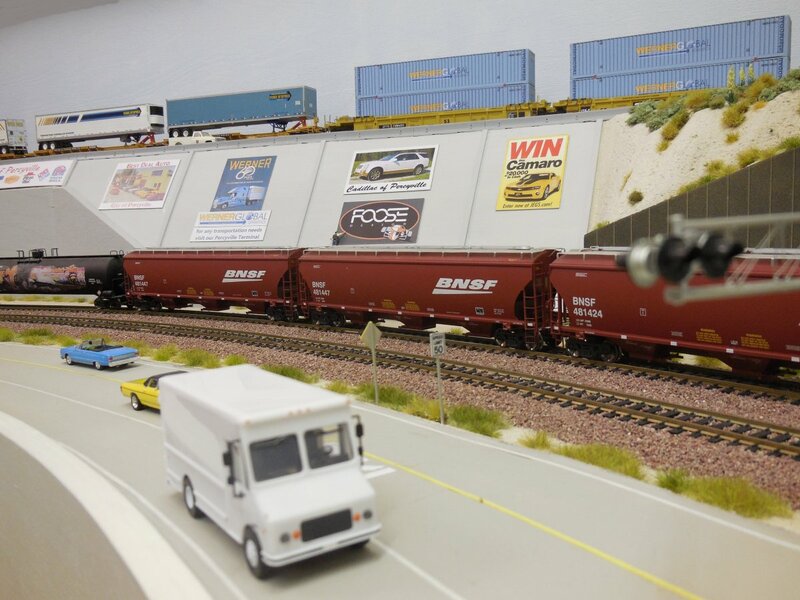 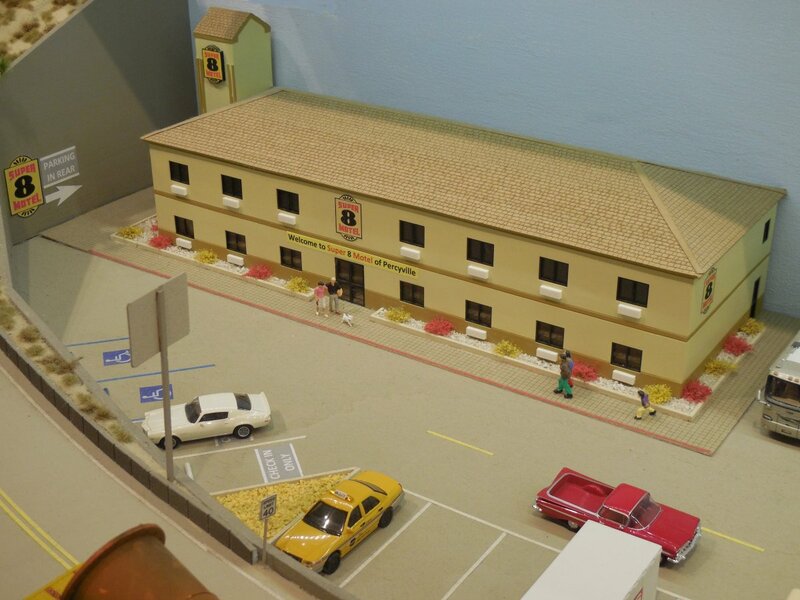 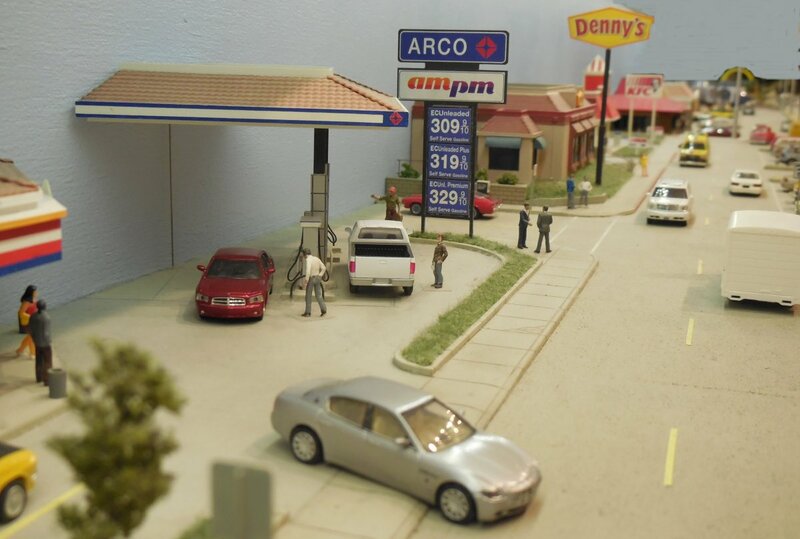 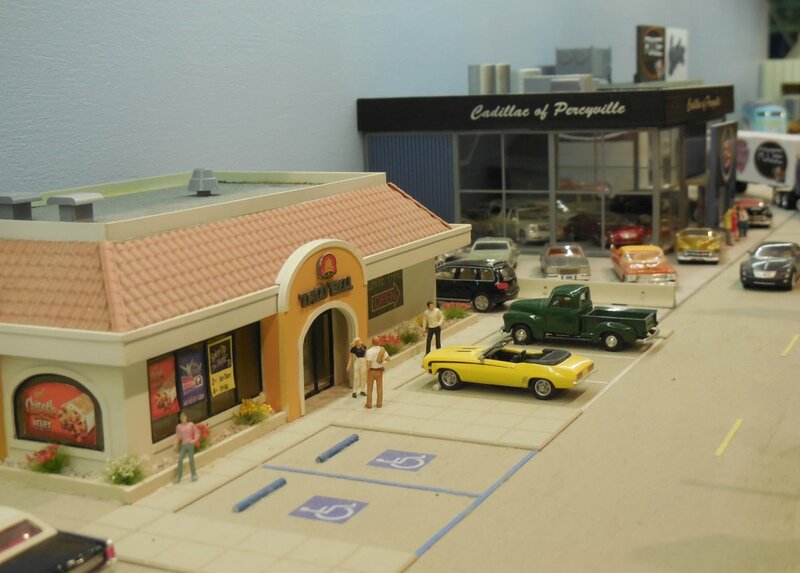 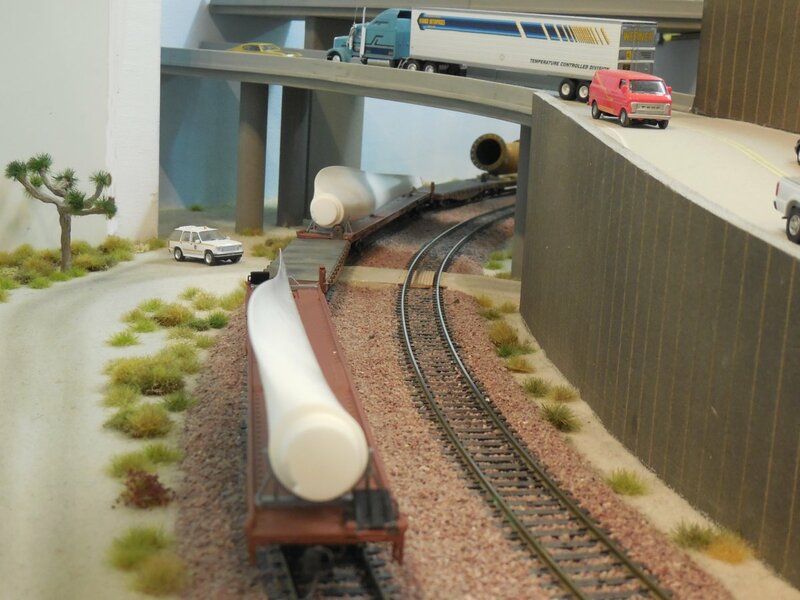 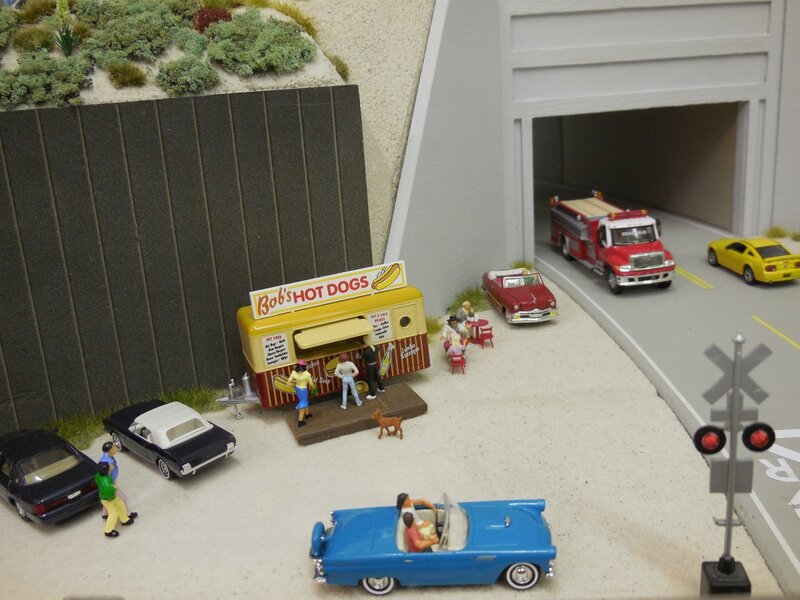 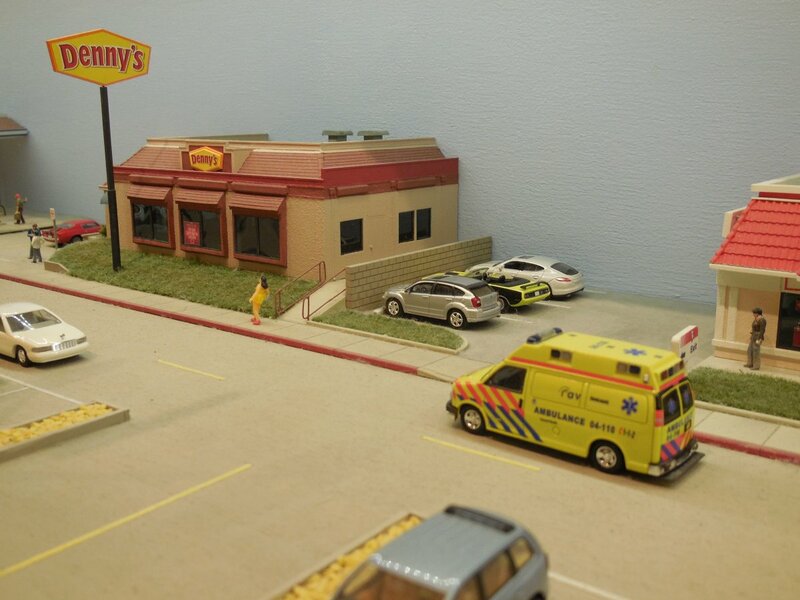 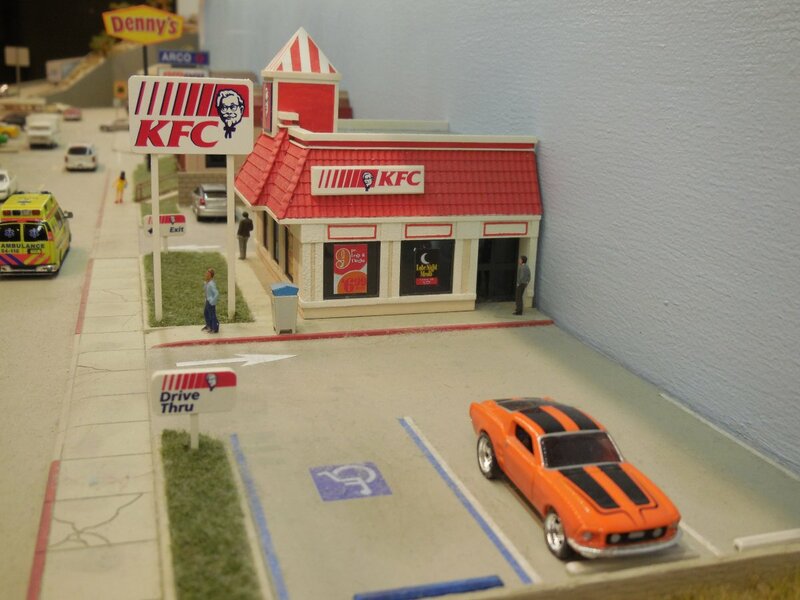 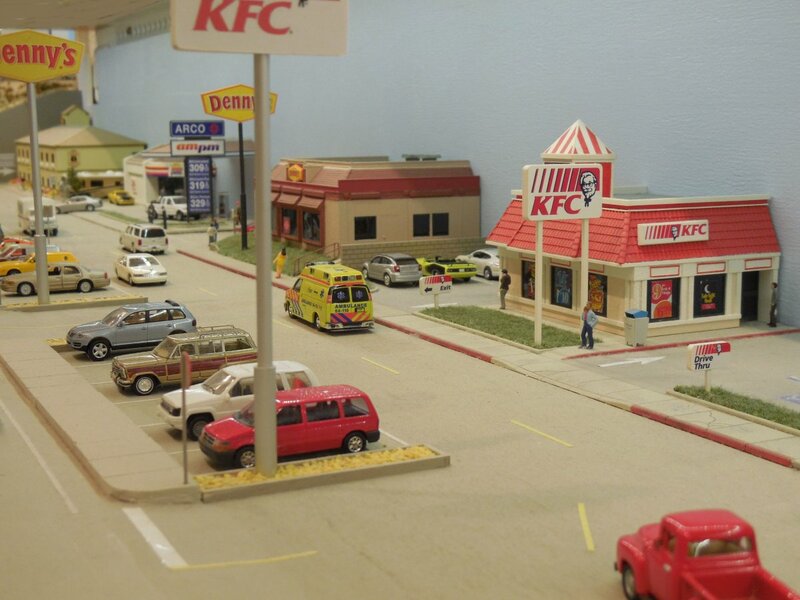 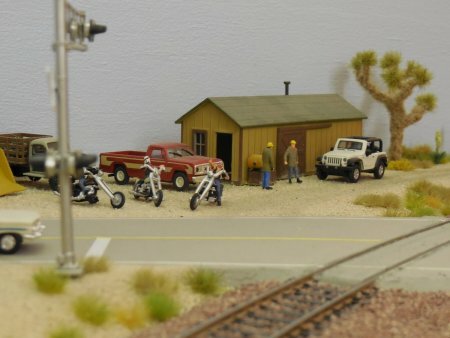 That way, we are going to show the power and cars in detail from different angles and we can also see the layout. 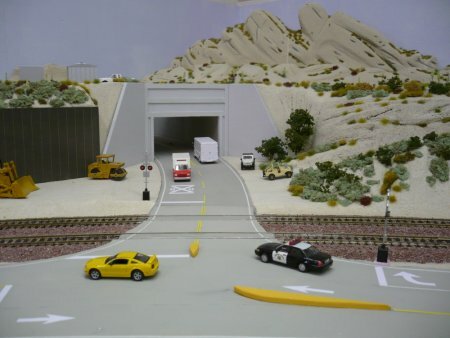 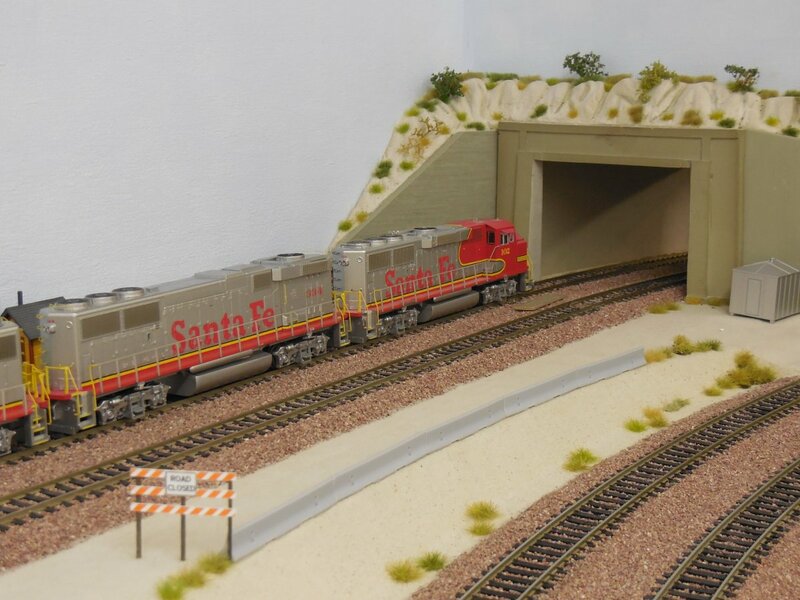 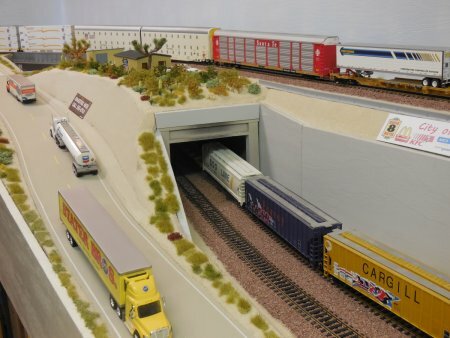 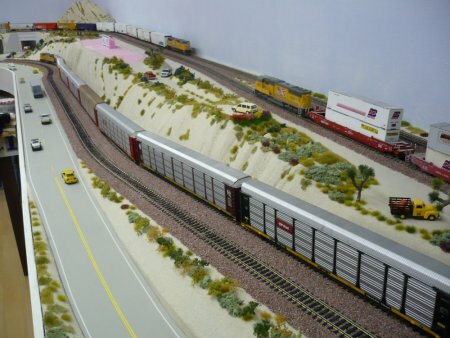 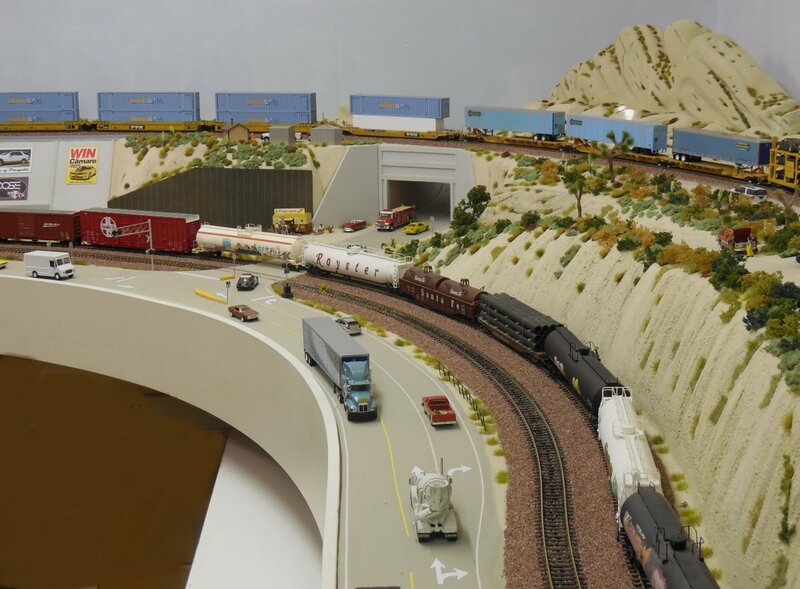 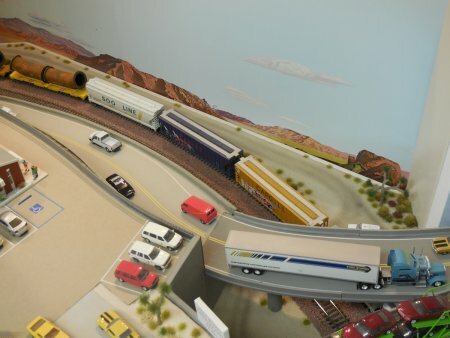 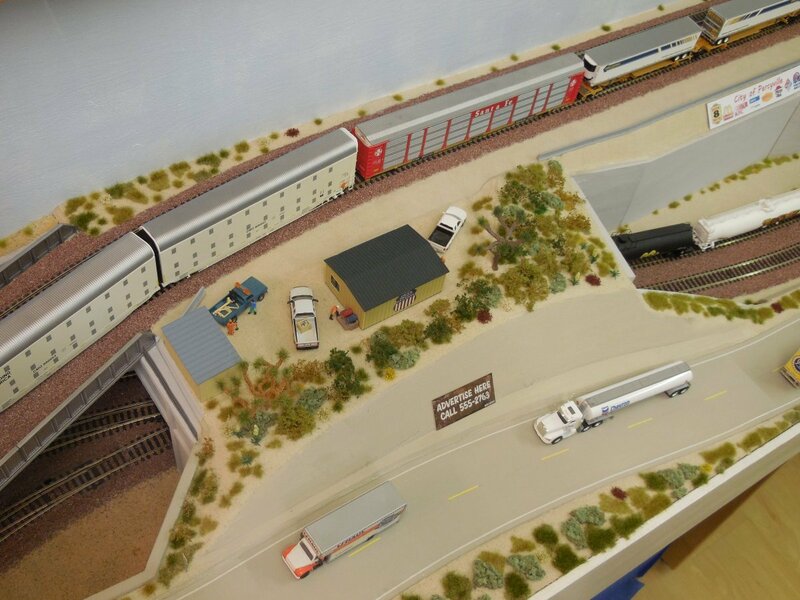 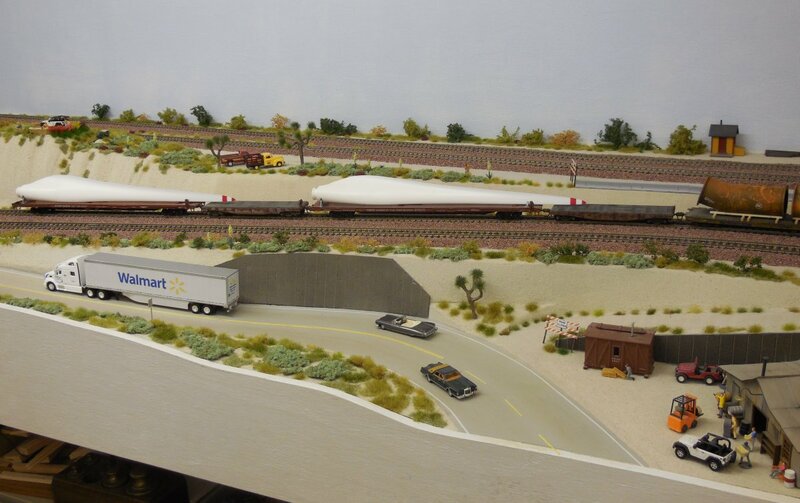 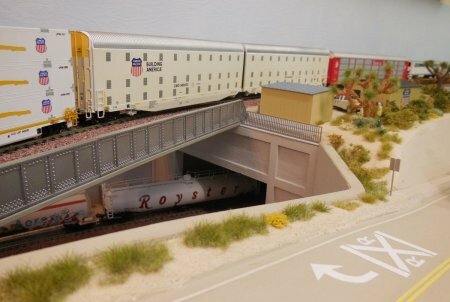 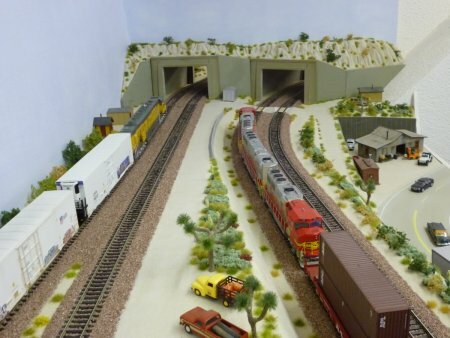 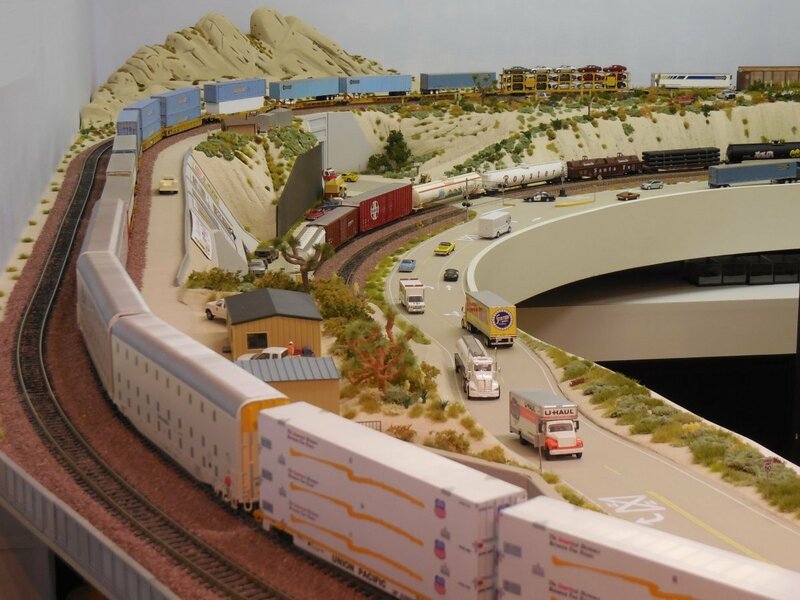 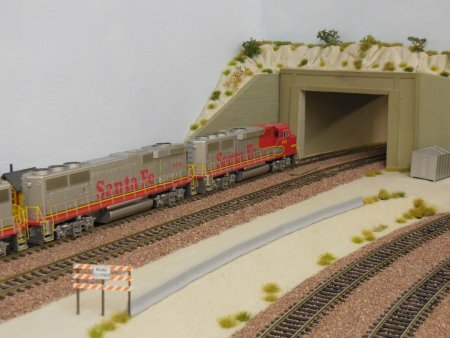 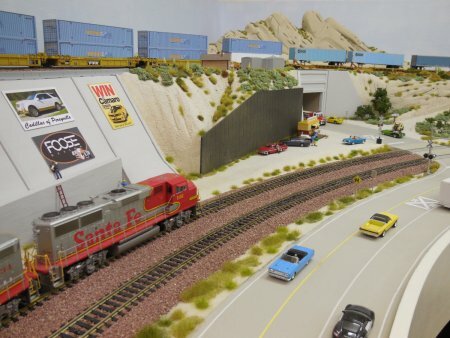 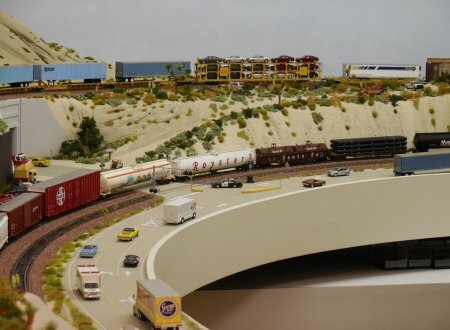 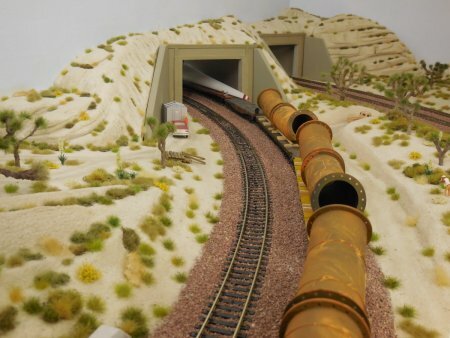 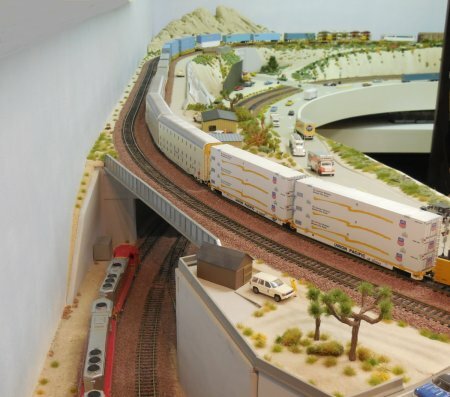 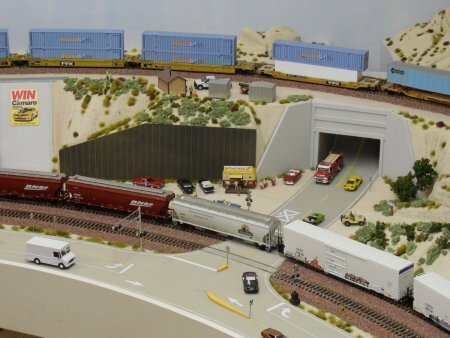 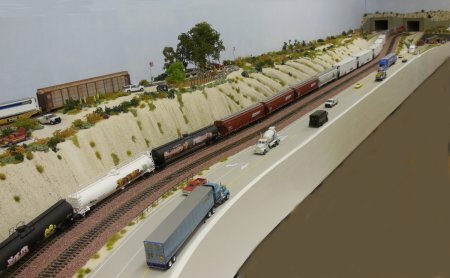 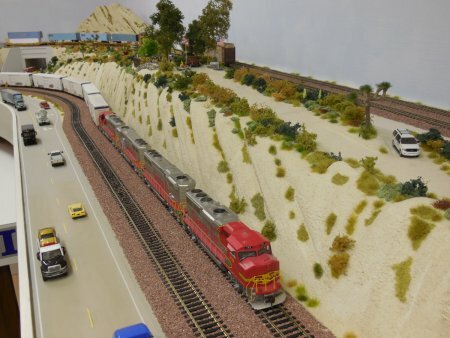 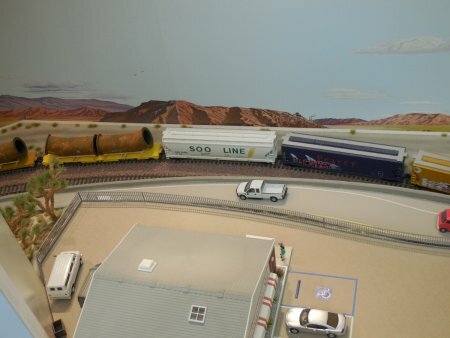 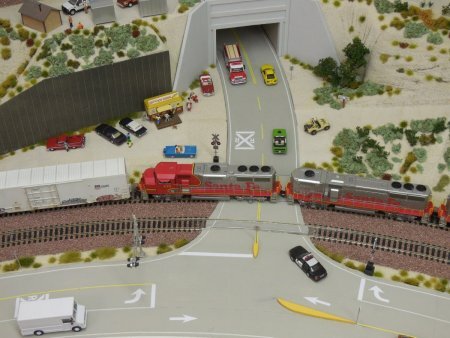 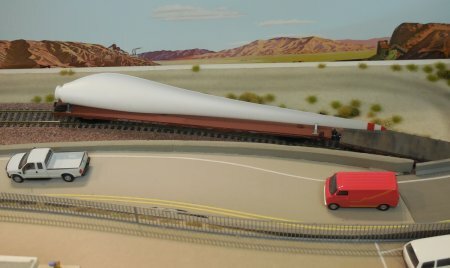 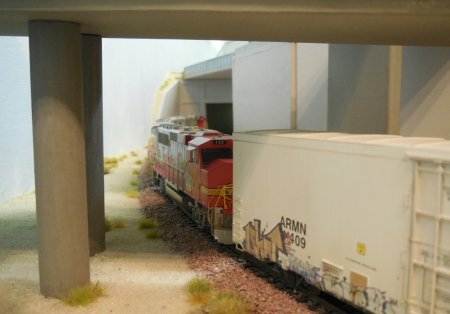 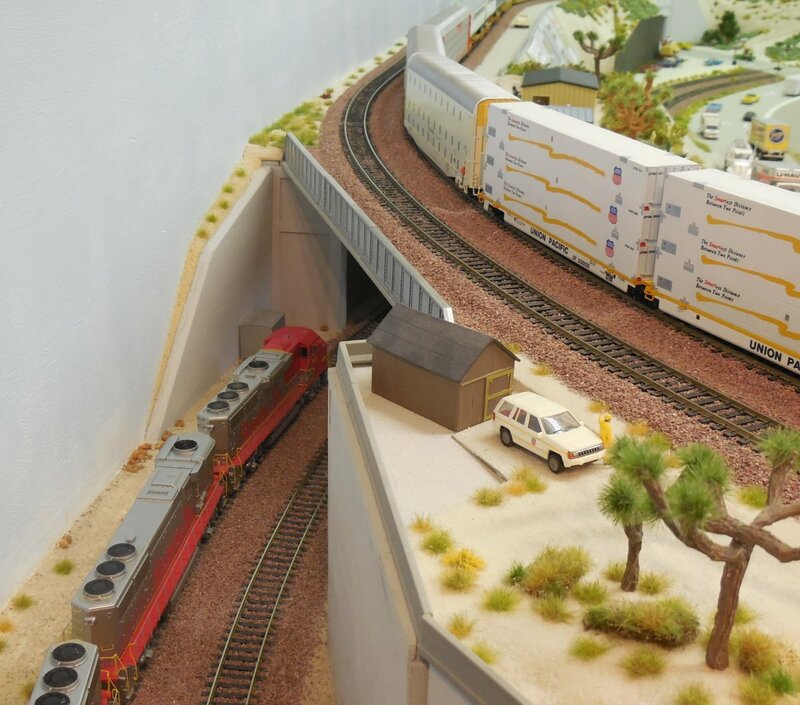 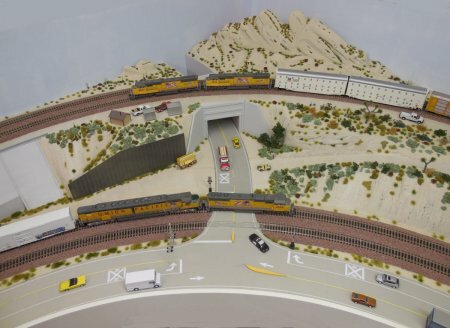 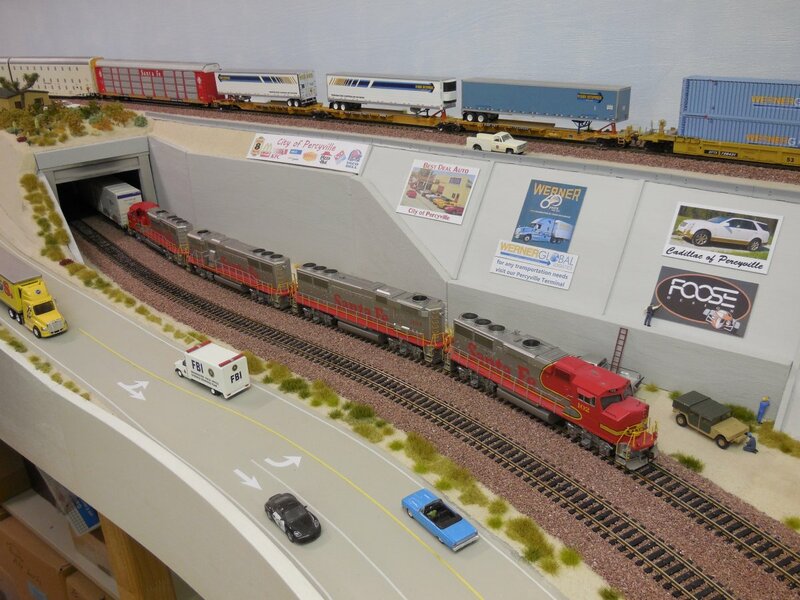 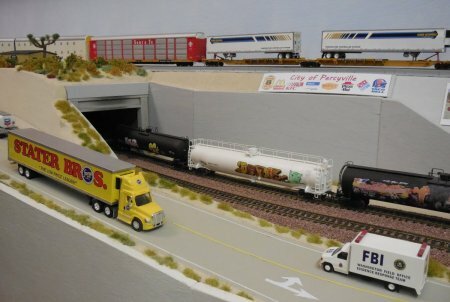 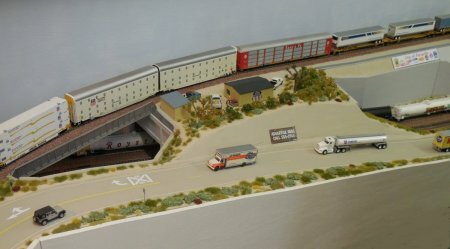 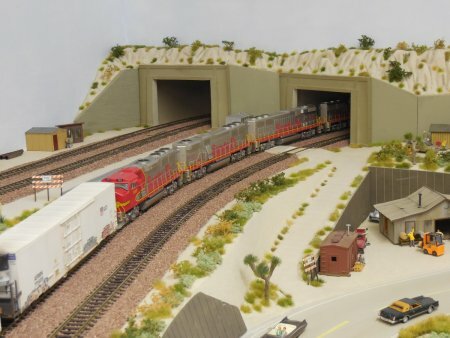 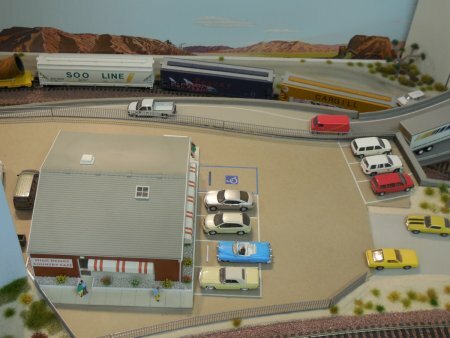 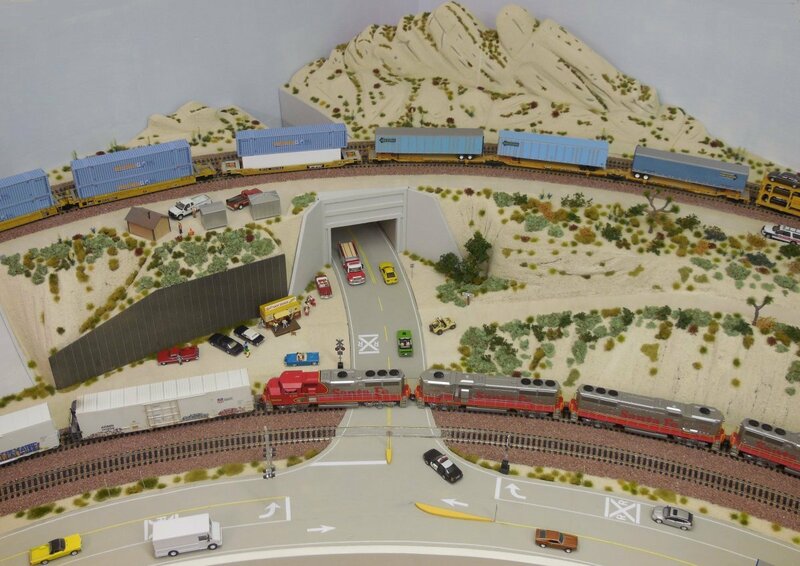 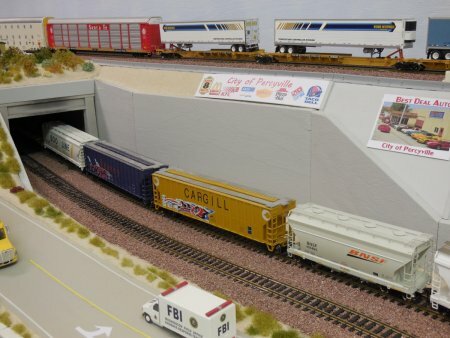 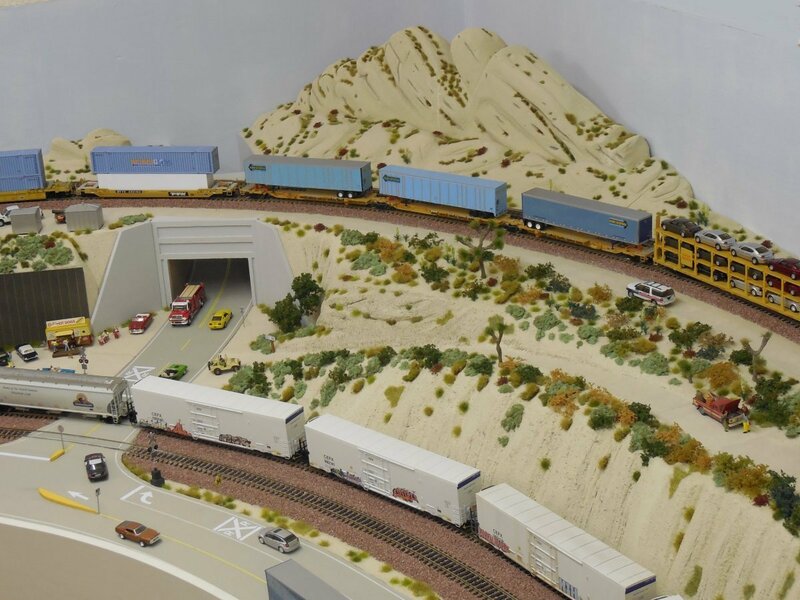 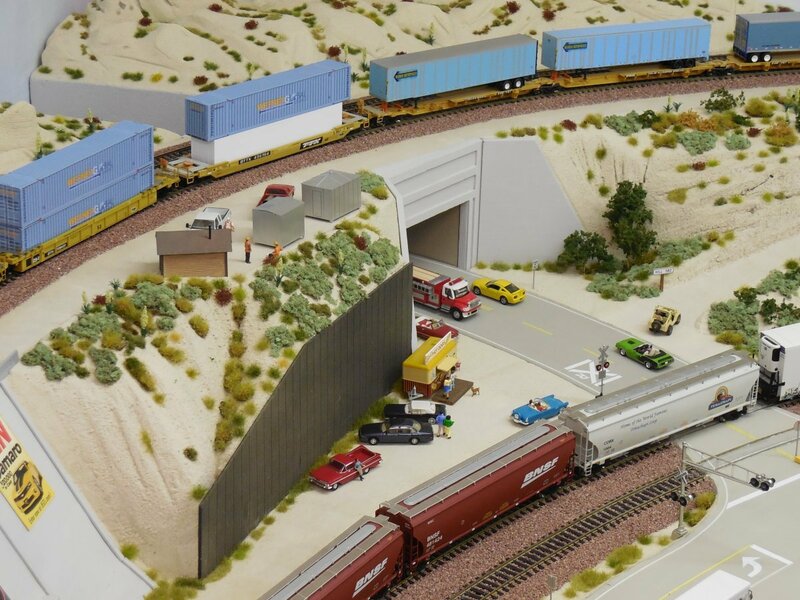 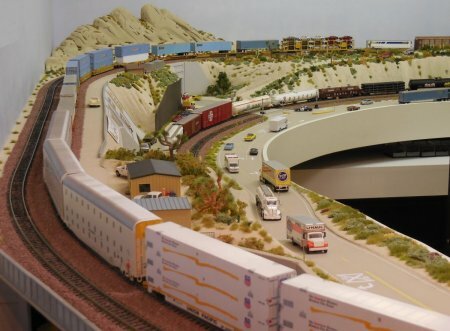 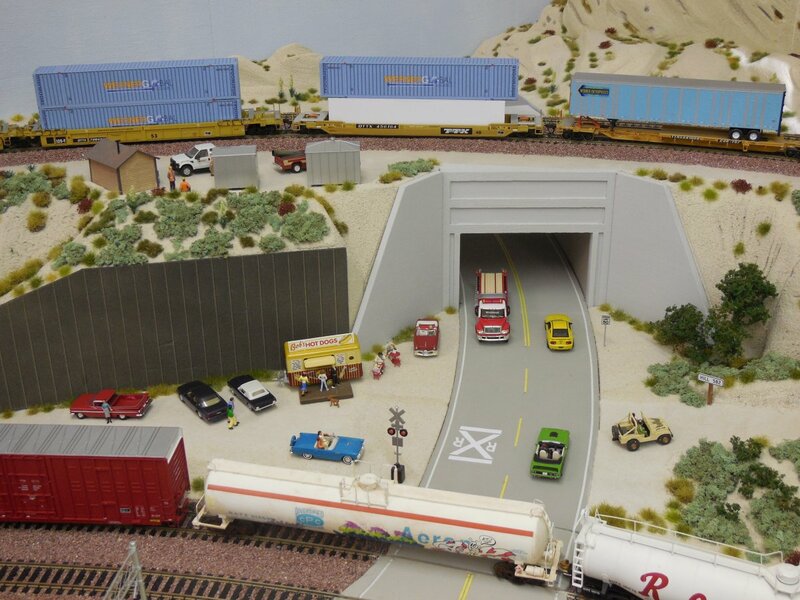 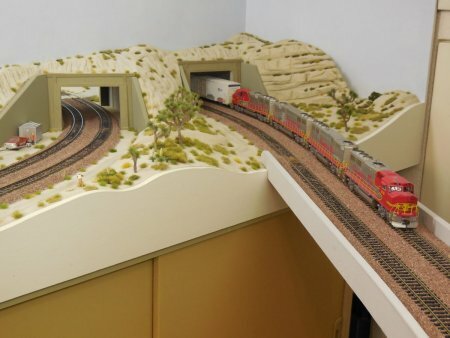 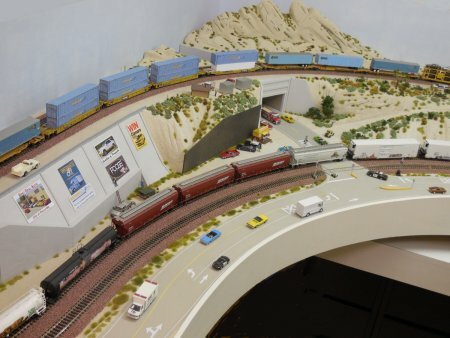 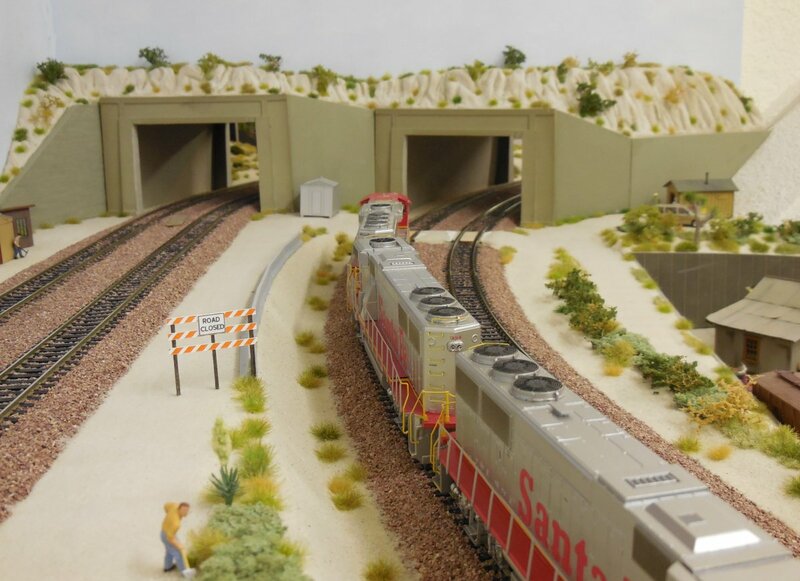 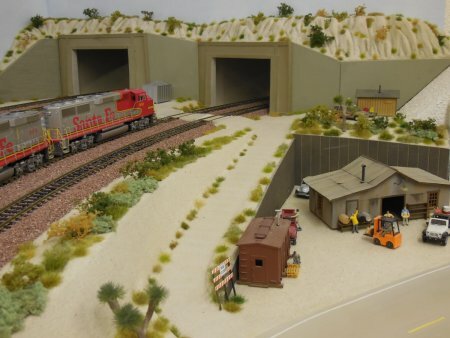 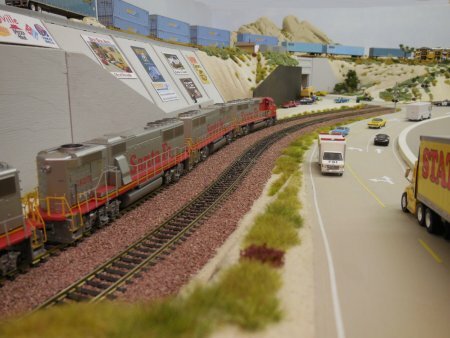 My Santa Fe Train is "parked" inside Office 2 below Hill 582 and WSI, just before the Tunnels. 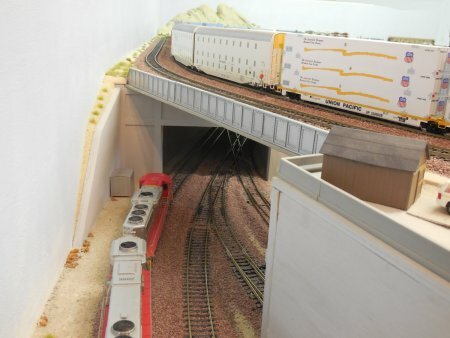 First, we took some photos from the standing train, afterwards, the train was moving thru Tunnel 1 into Office 1 and over the bridge back into Office 2 along the shelf (next to the UP train). 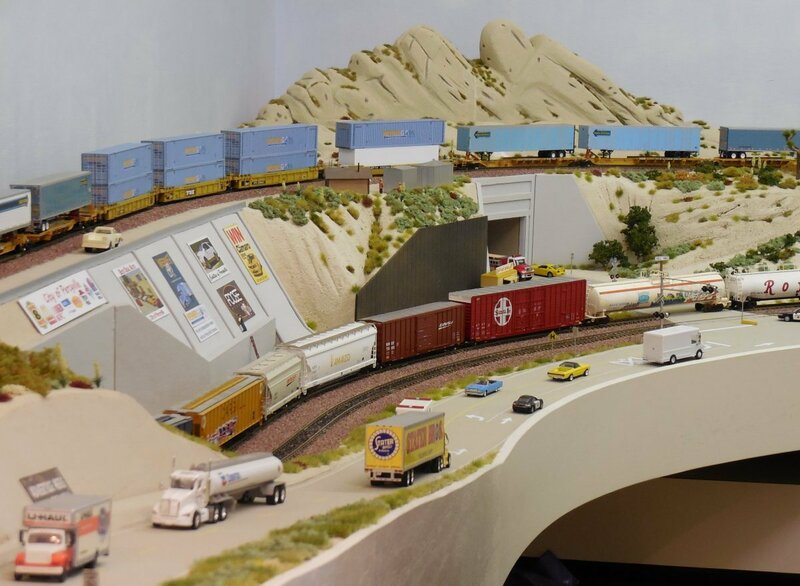 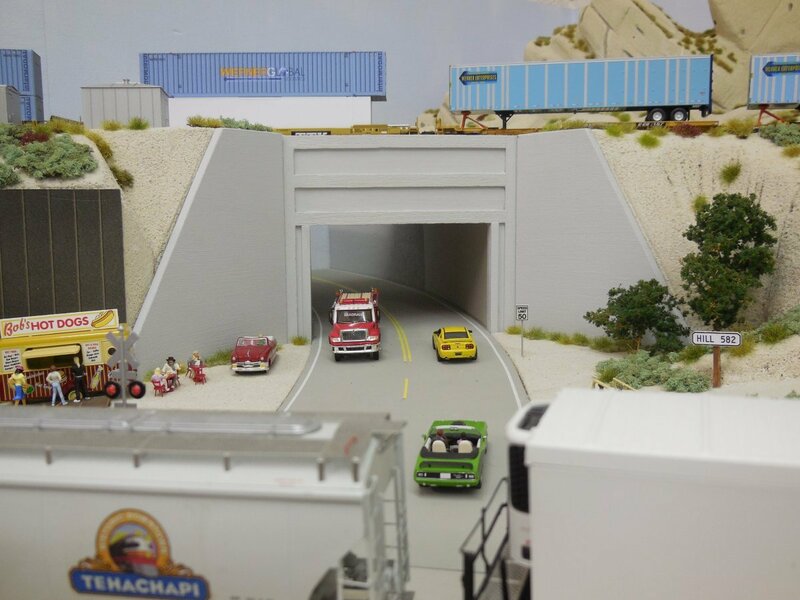 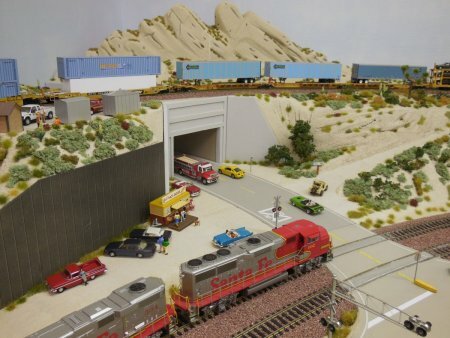 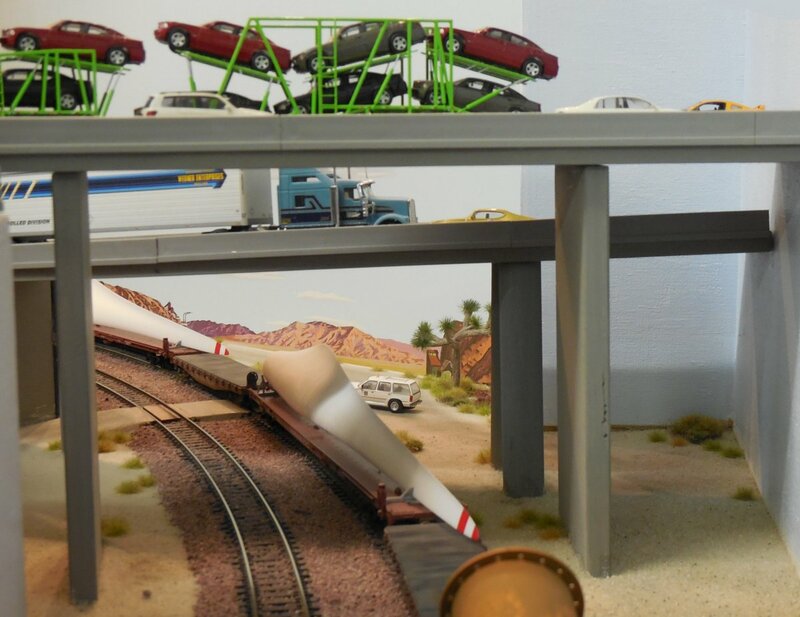 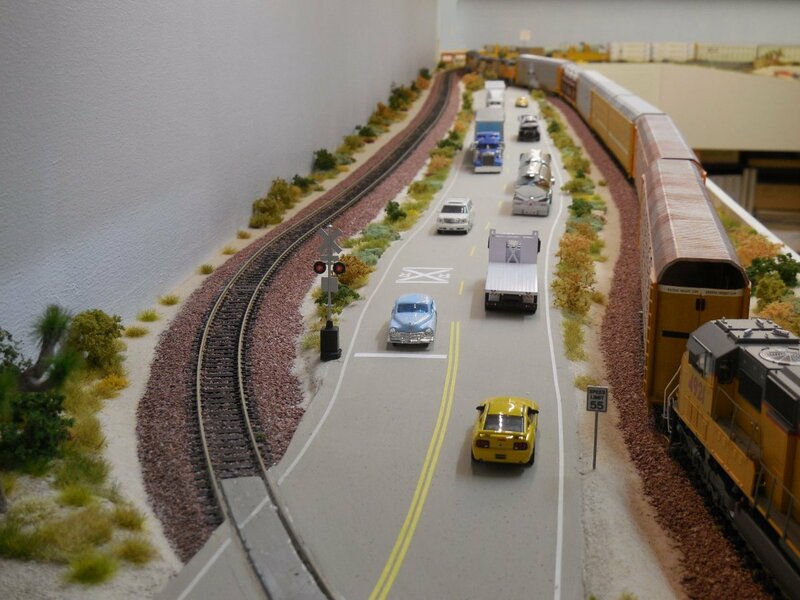 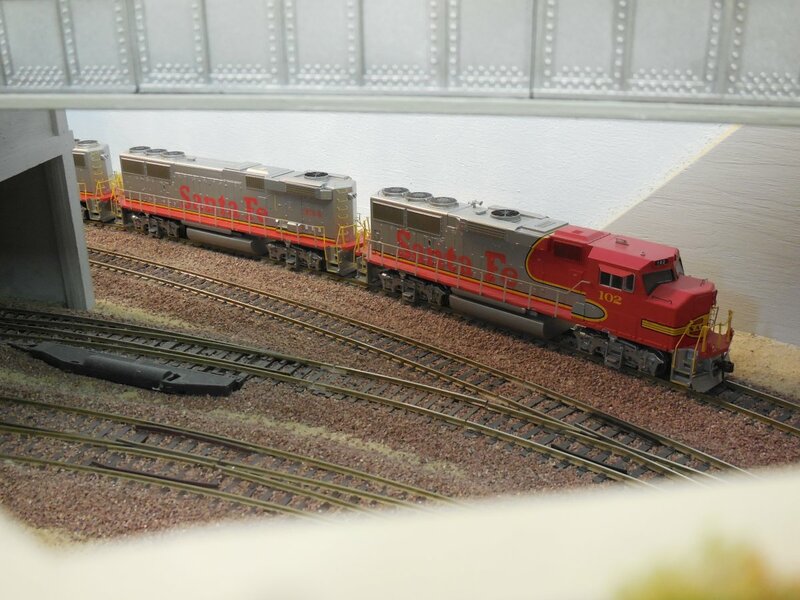 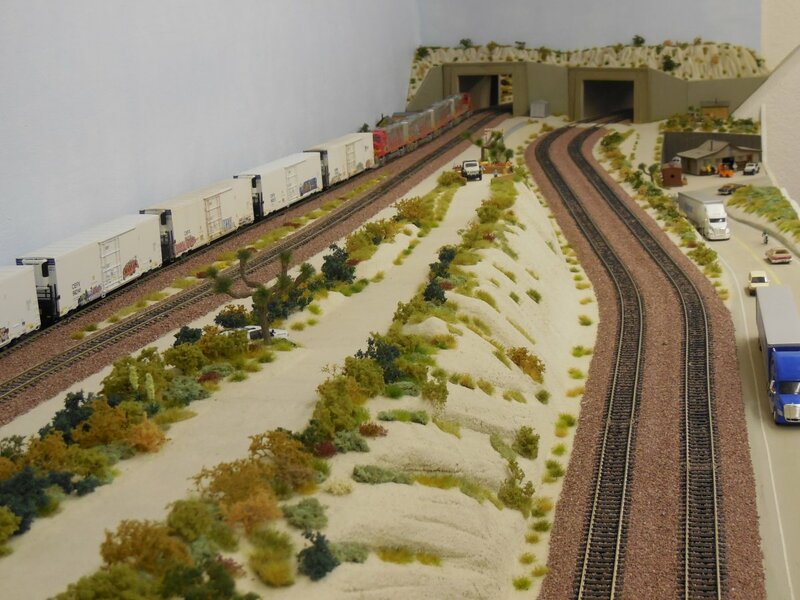 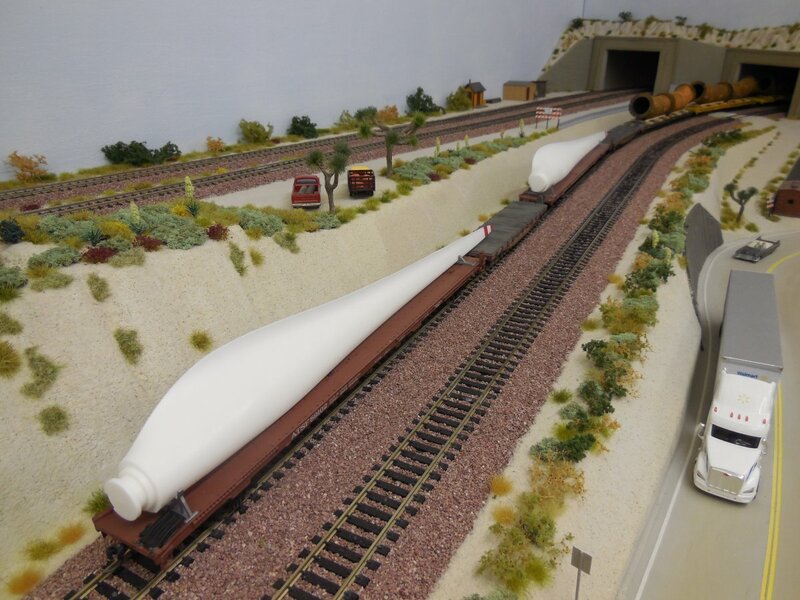 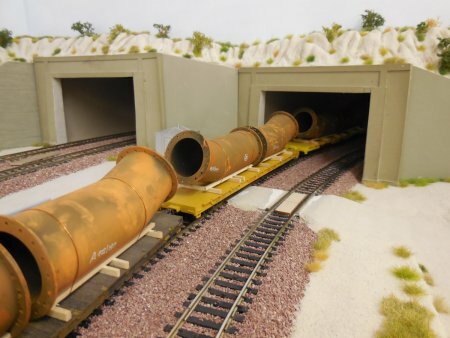 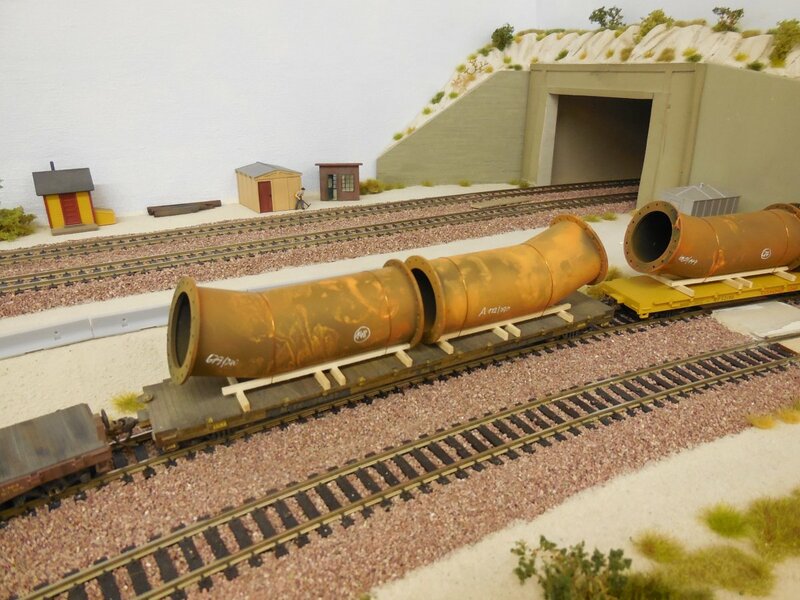 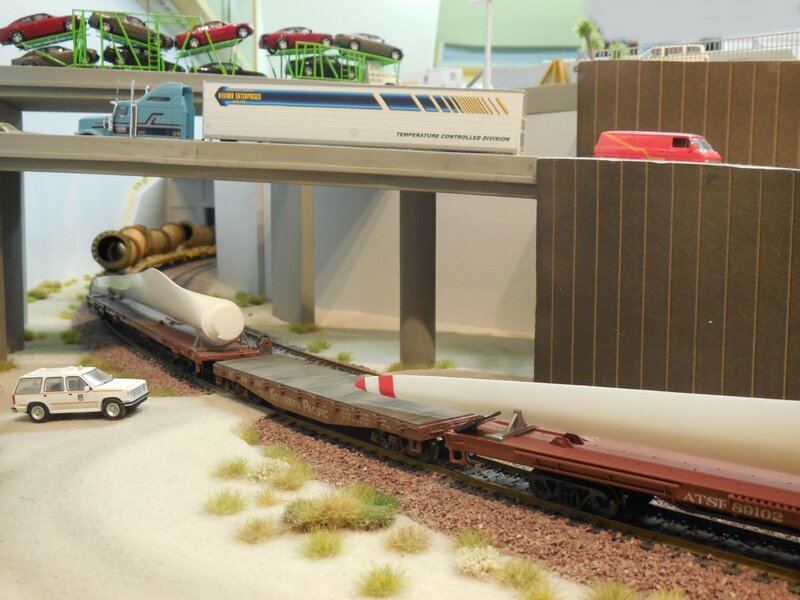 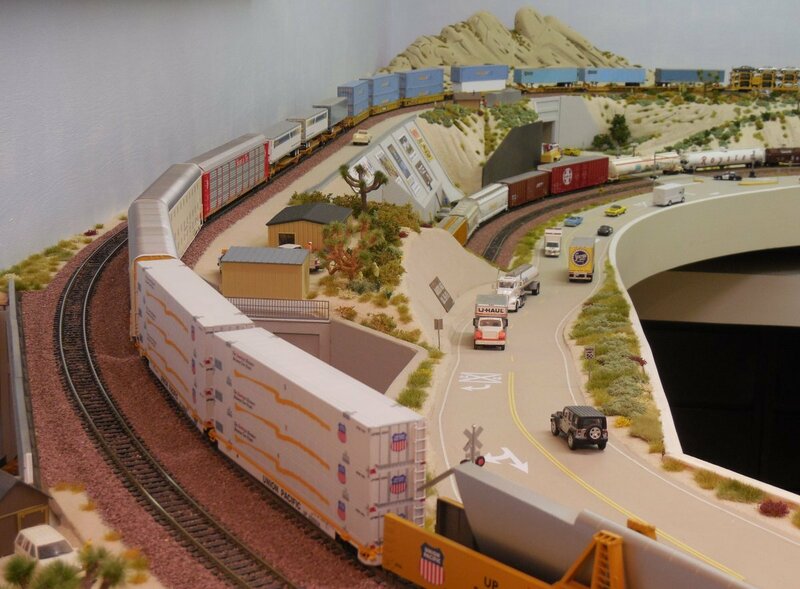 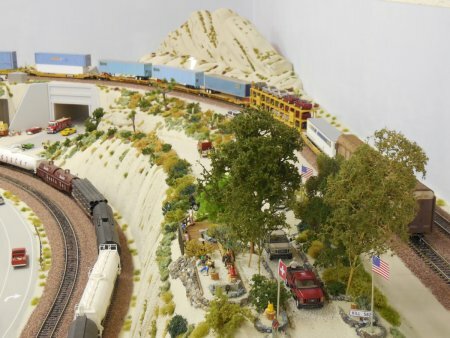 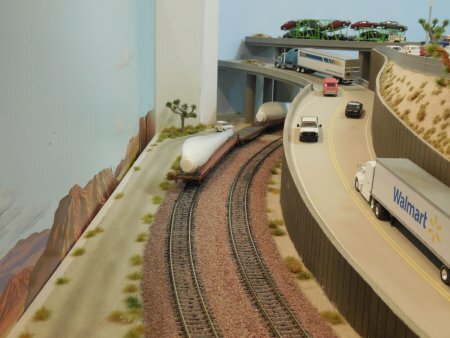 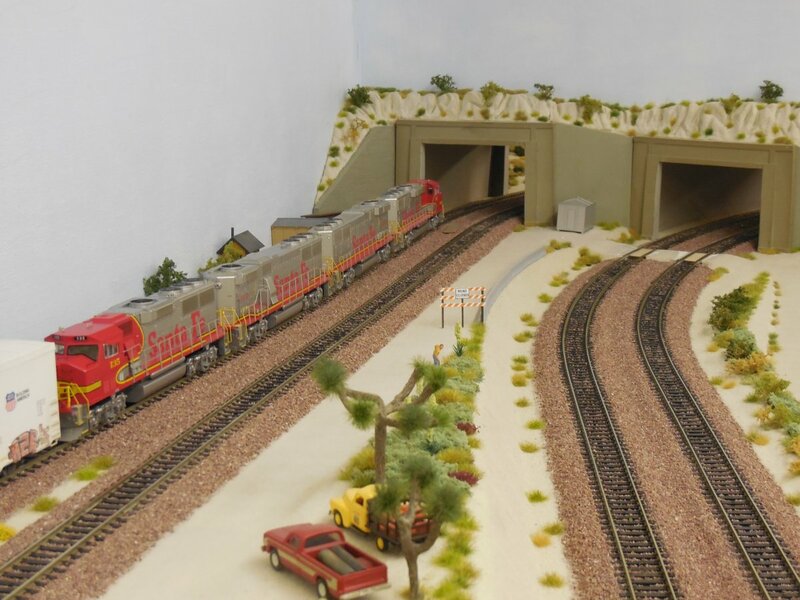 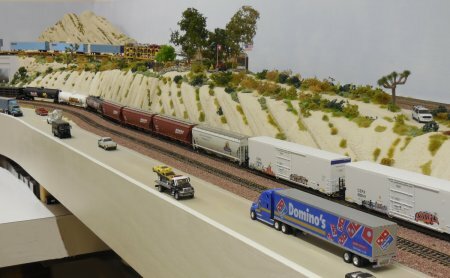 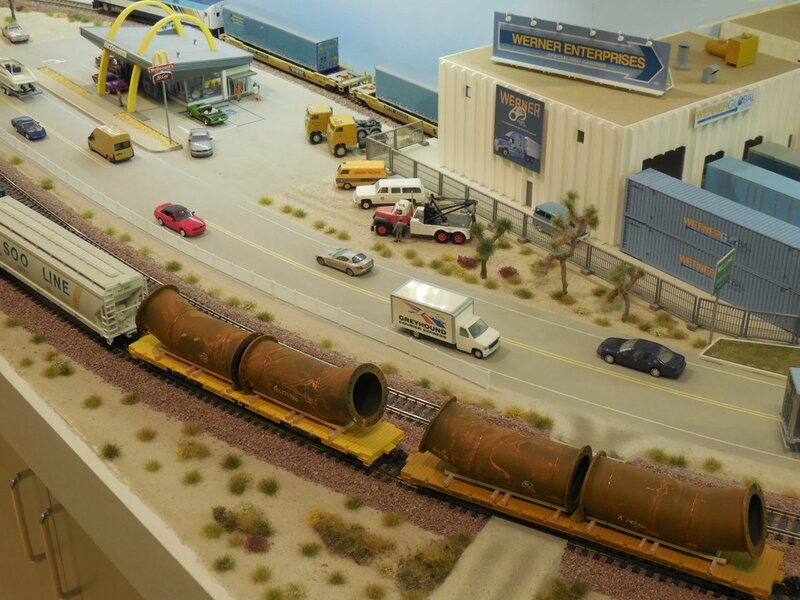 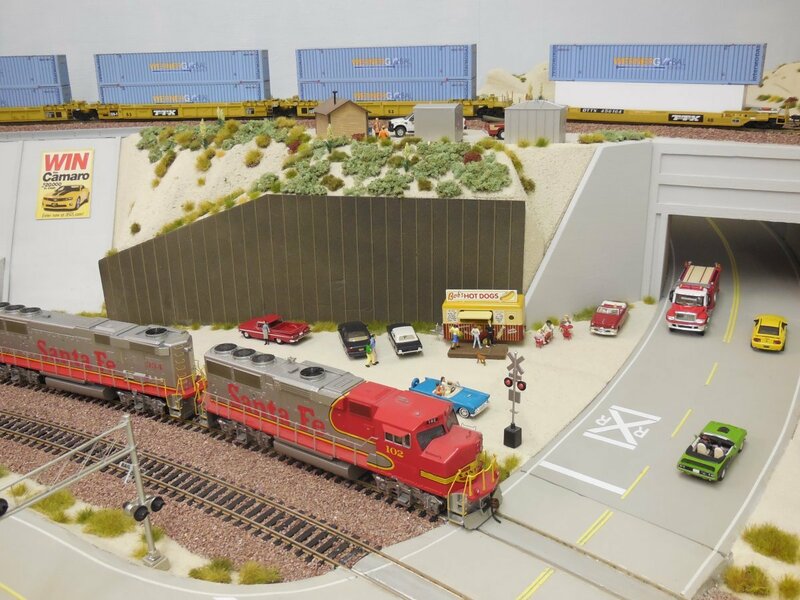 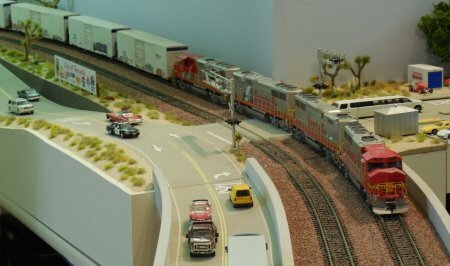 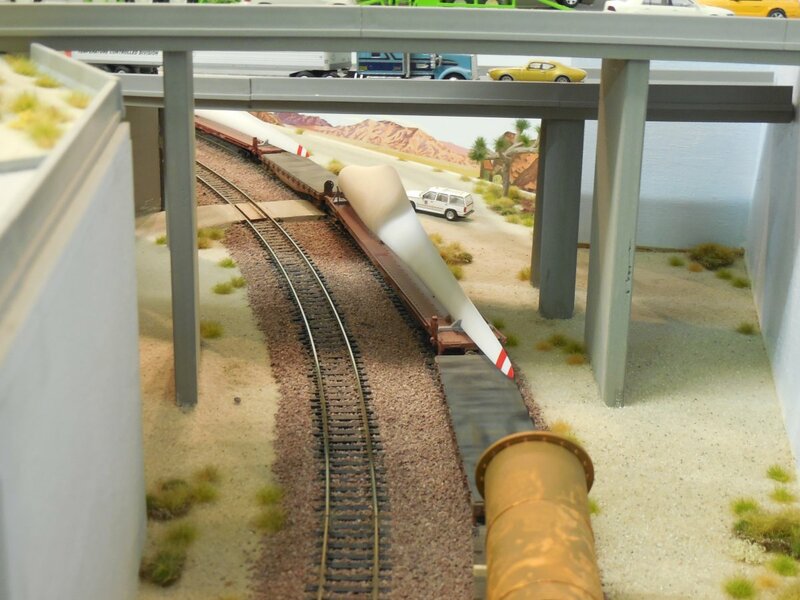 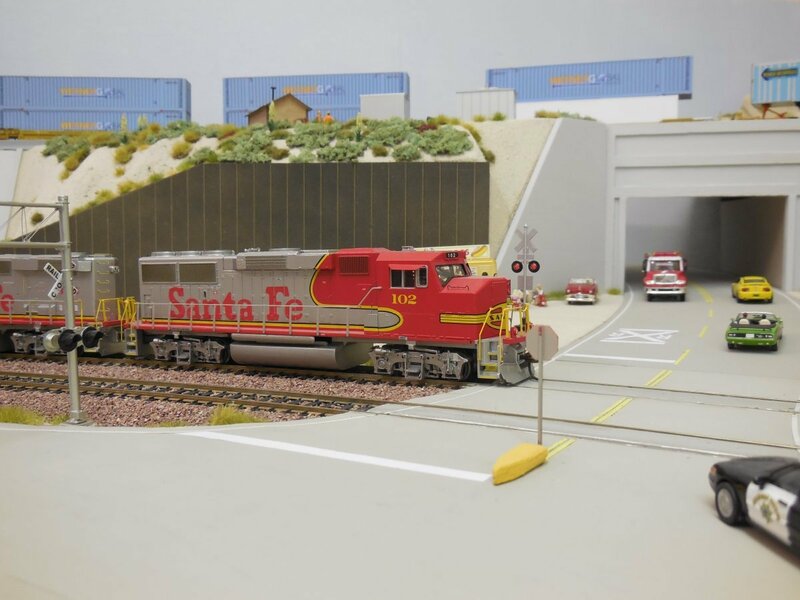 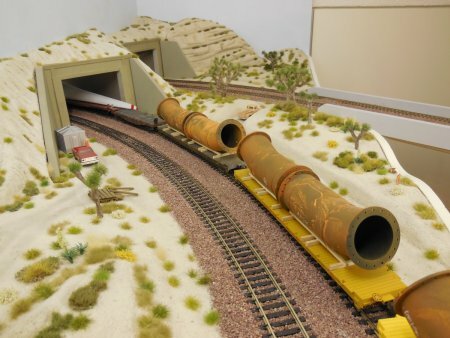 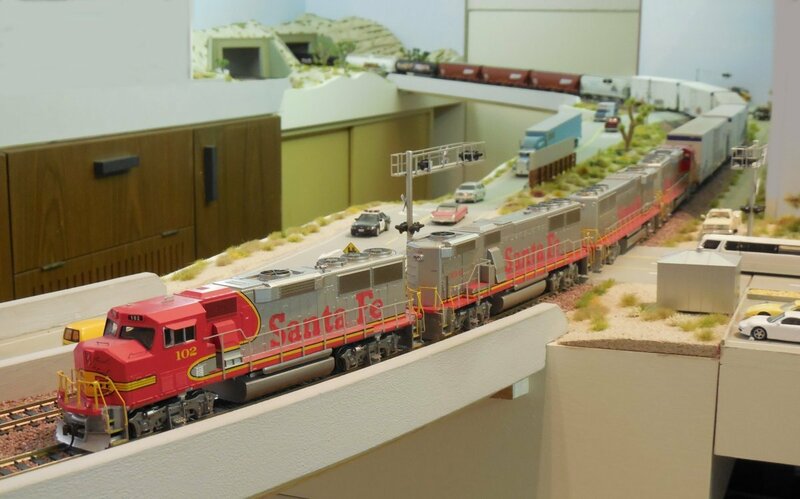 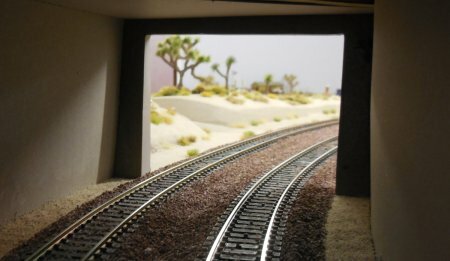 We are still inside Office 2 (West Side of Tunnels) and take a look at some special load on flat cars of the Santa Fe Train. 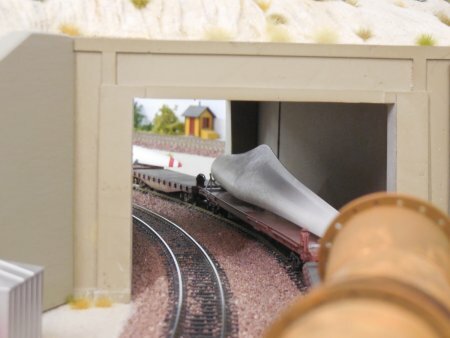 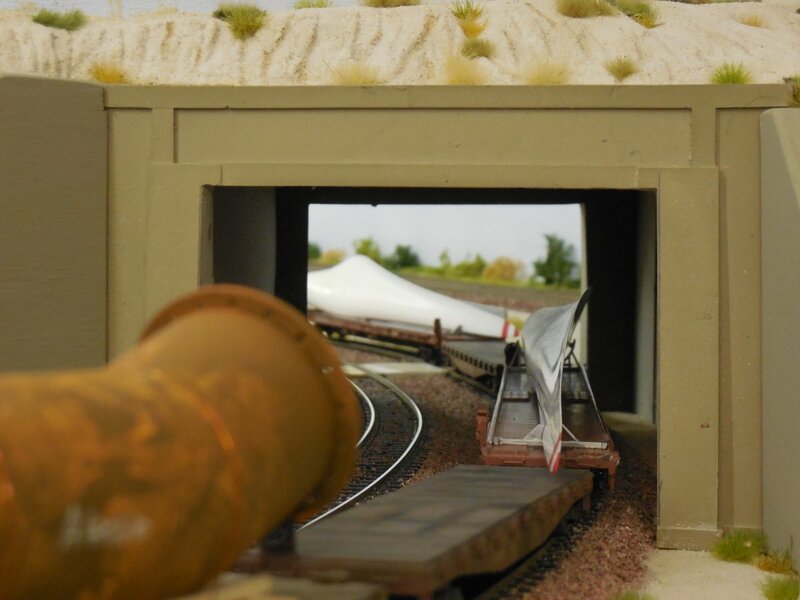 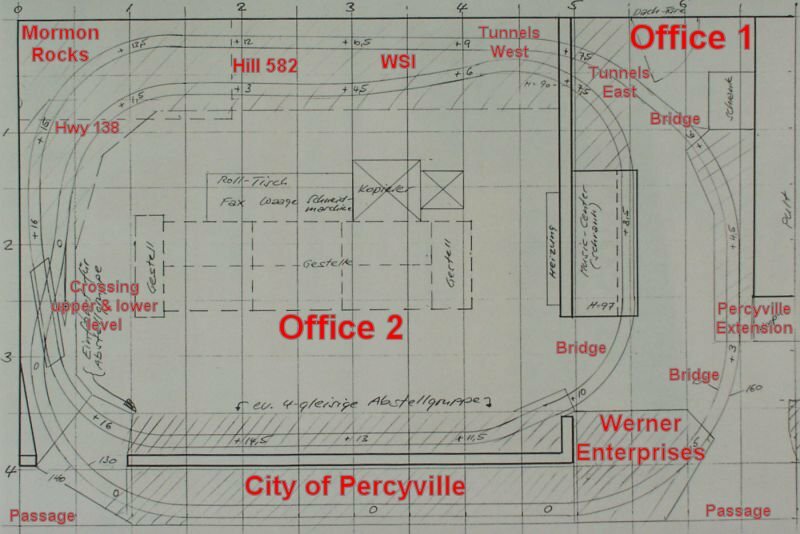 Now, we are on the East side of the tunnels and our special flat cars are moving thru Tunnel 1 (from Office 2 into Office 1). 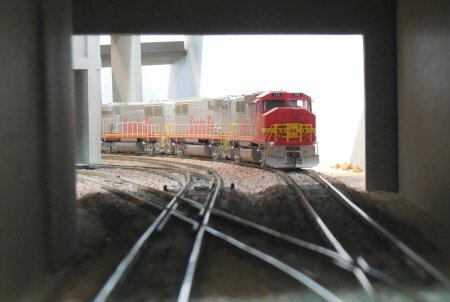 The engines are already back in Office 2 along the shelf and next to the UP train. 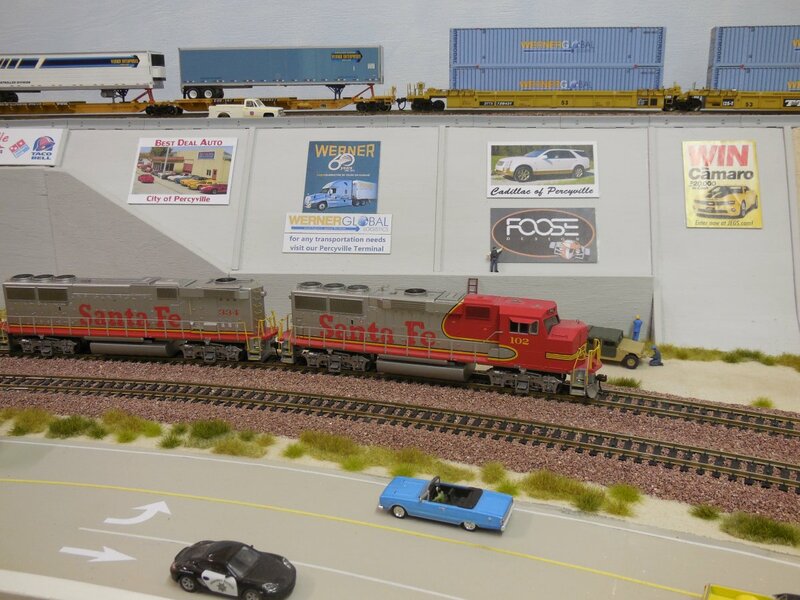 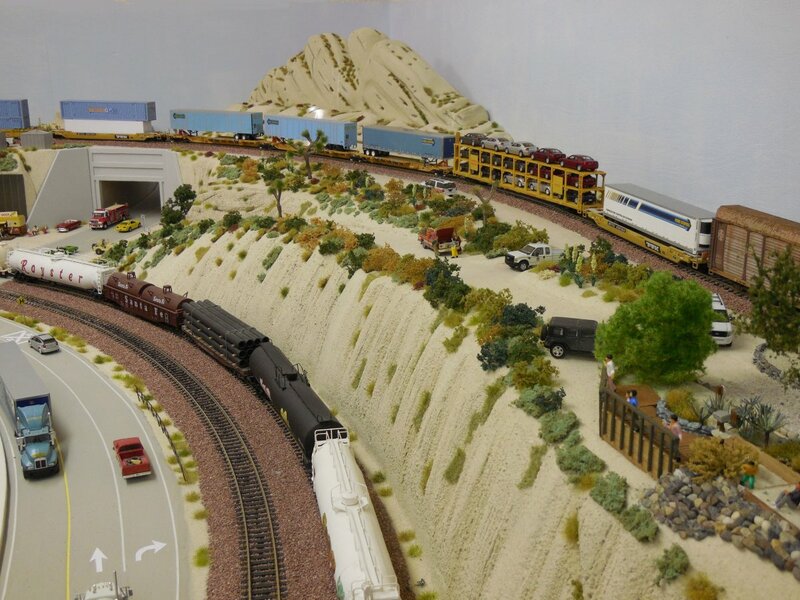 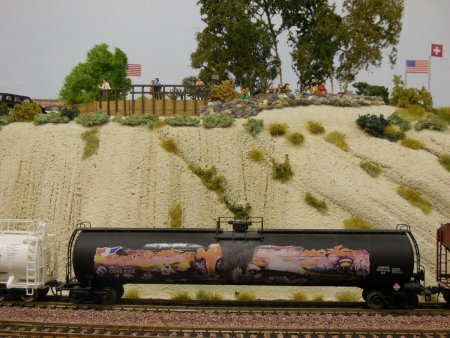 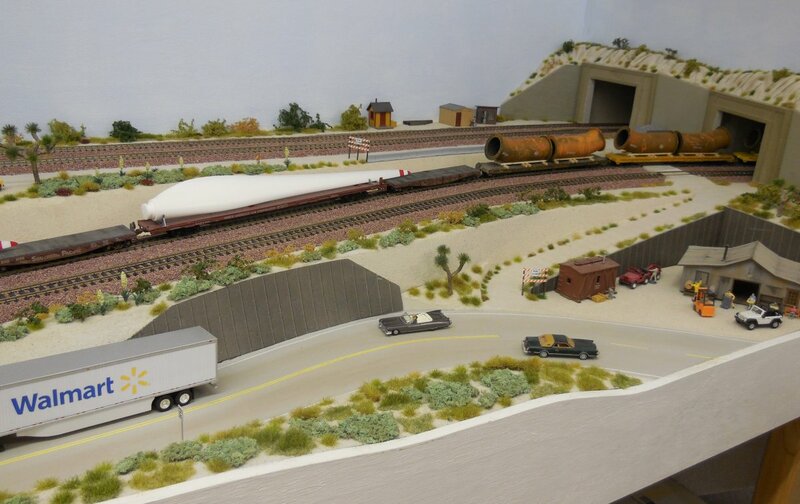 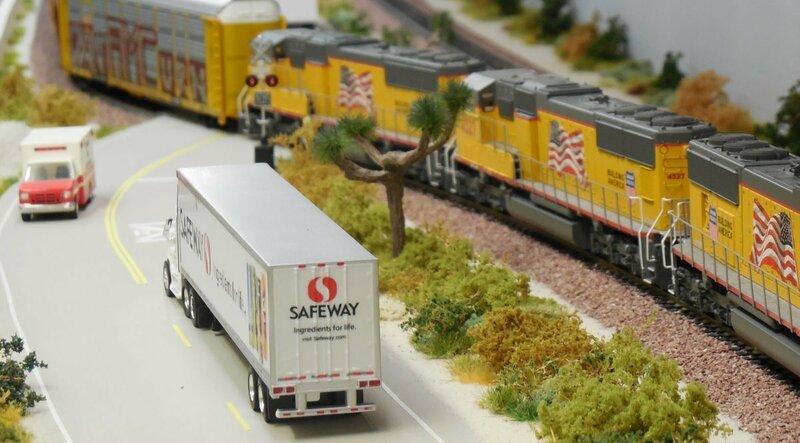 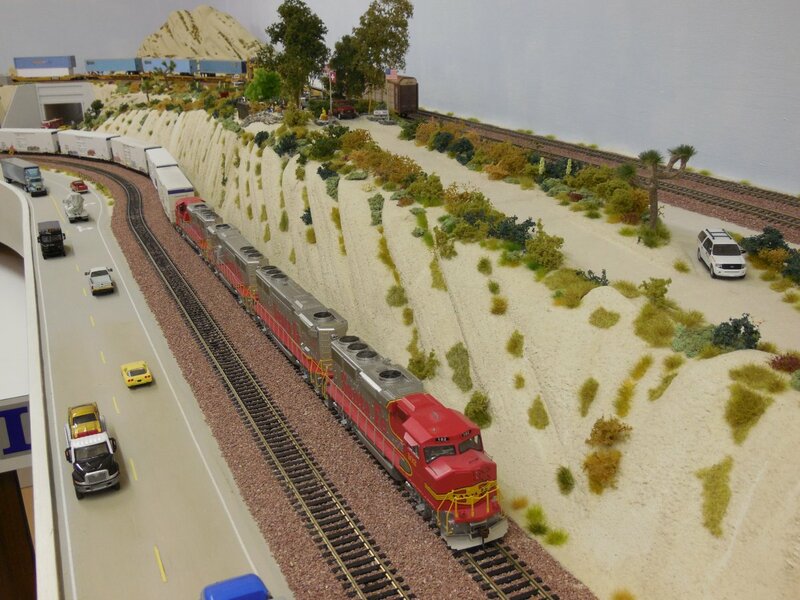 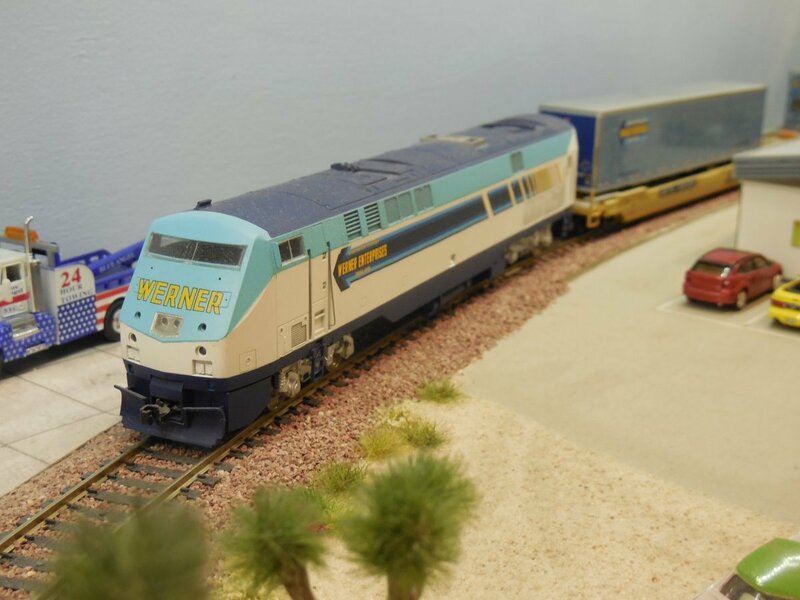 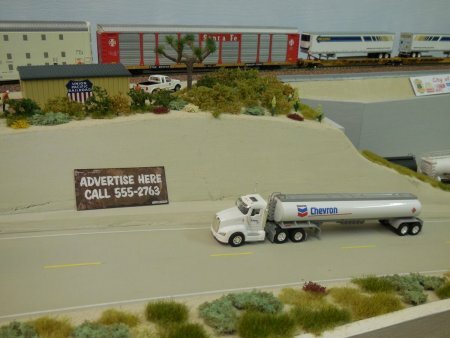 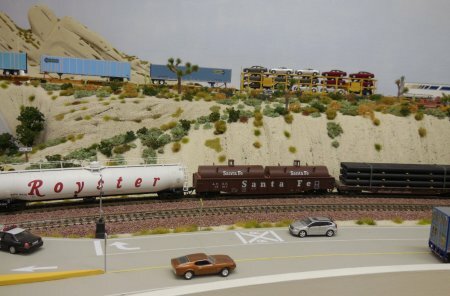 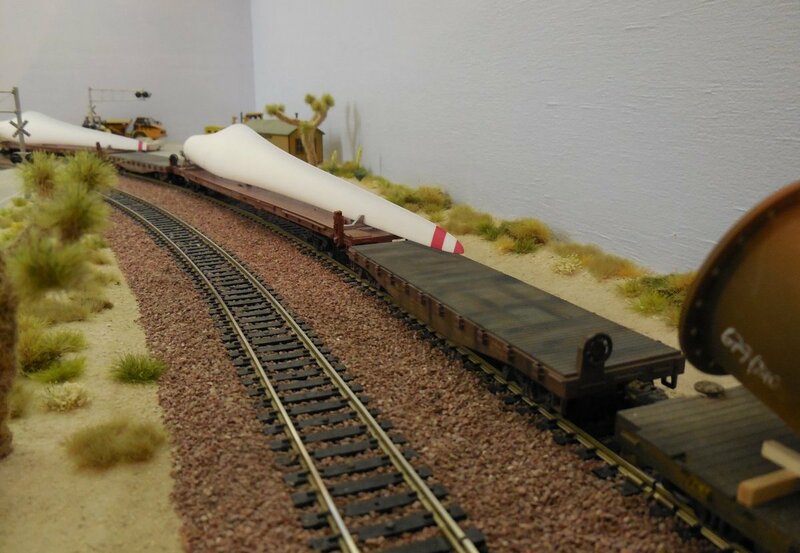 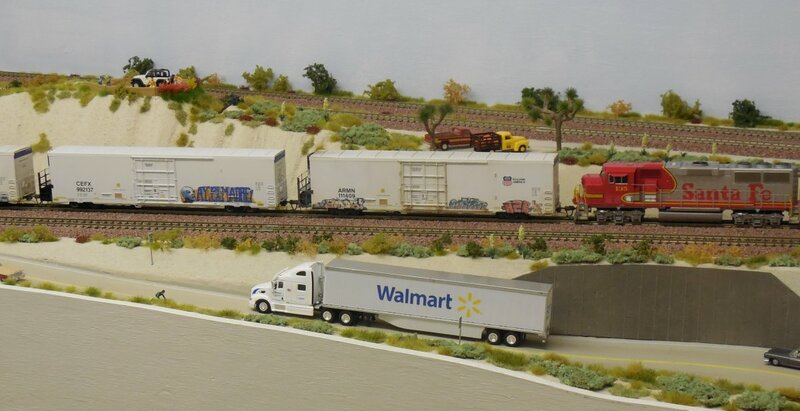 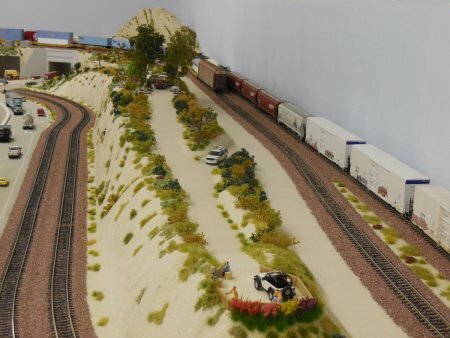 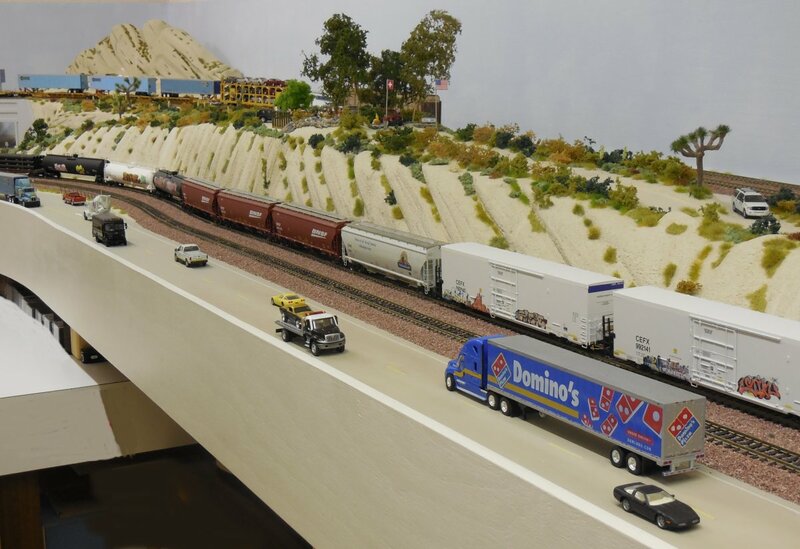 The SF train left the shelf and was rolling behind the UP train passing Hill 582 and WSI on the upper track. 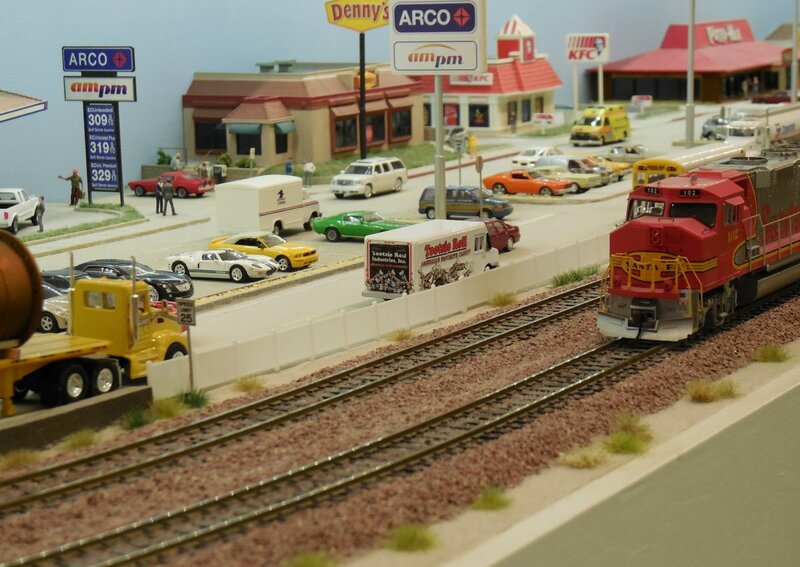 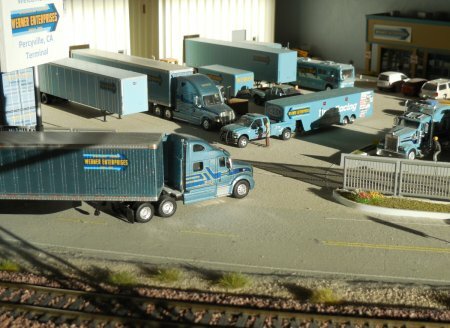 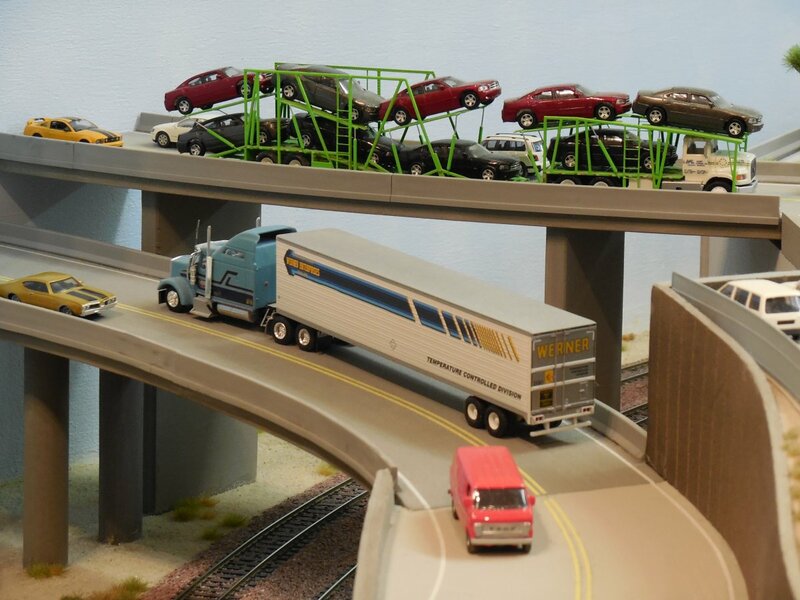 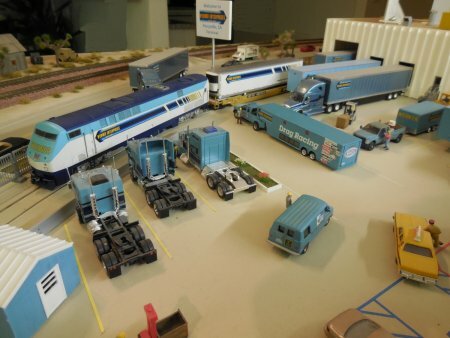 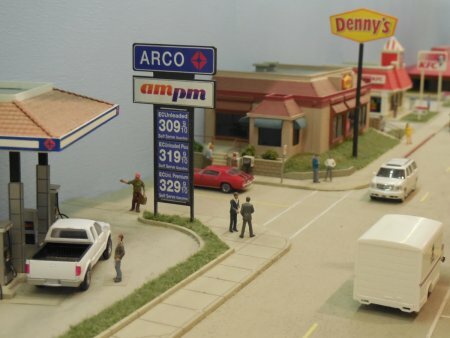 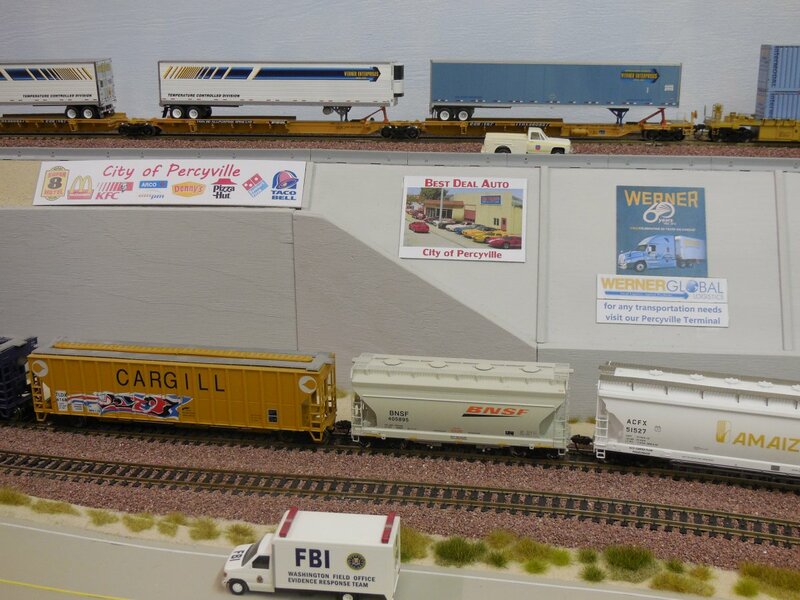 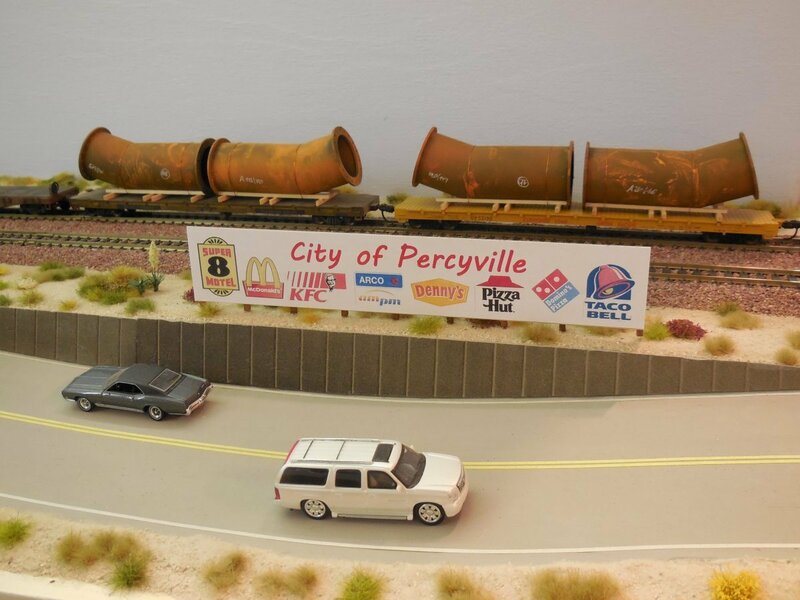 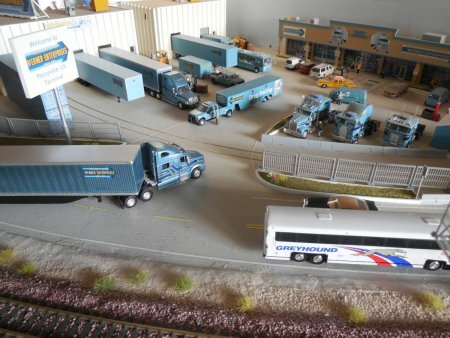 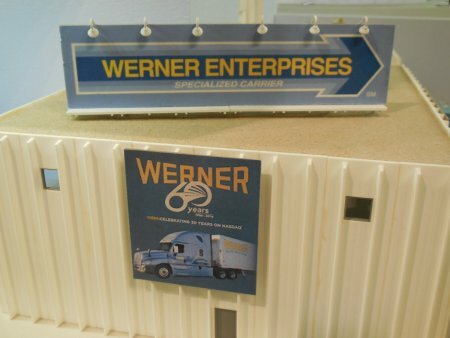 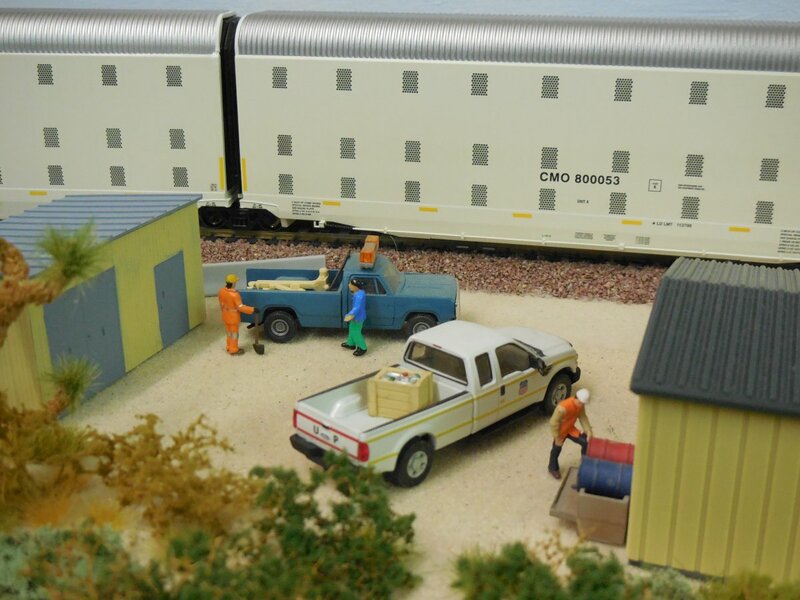 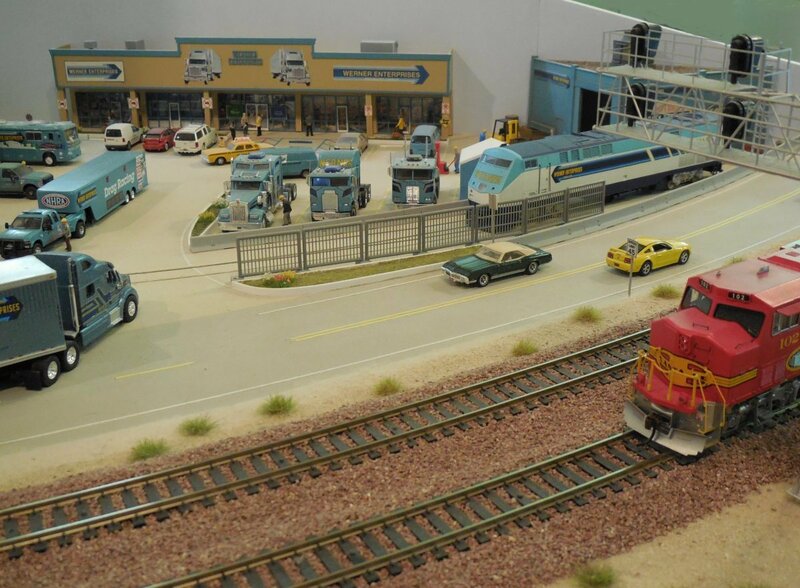 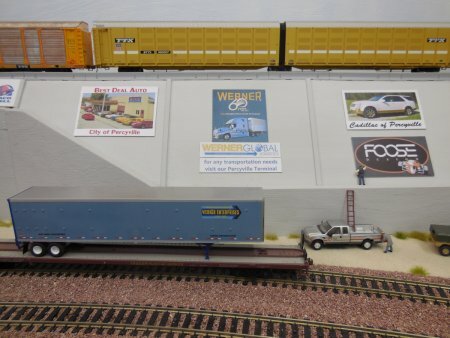 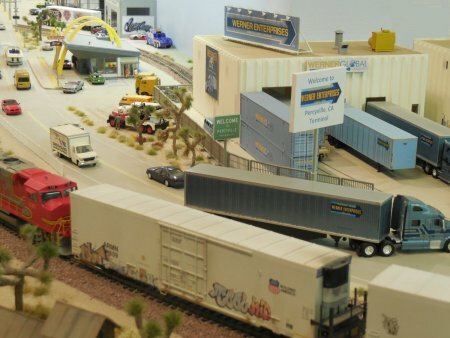 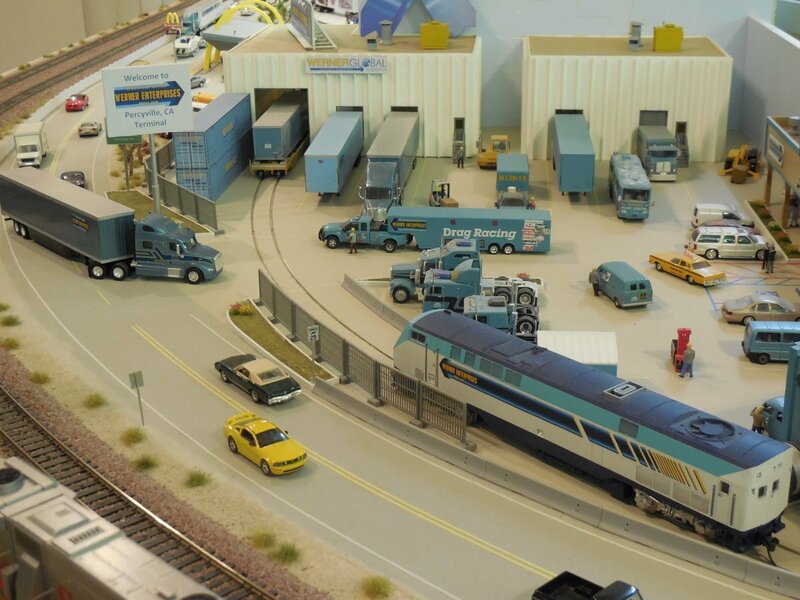 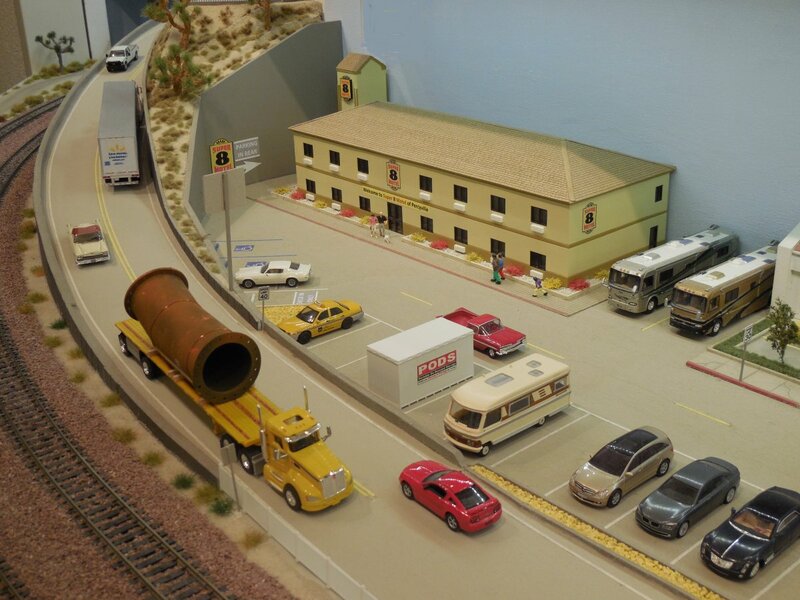 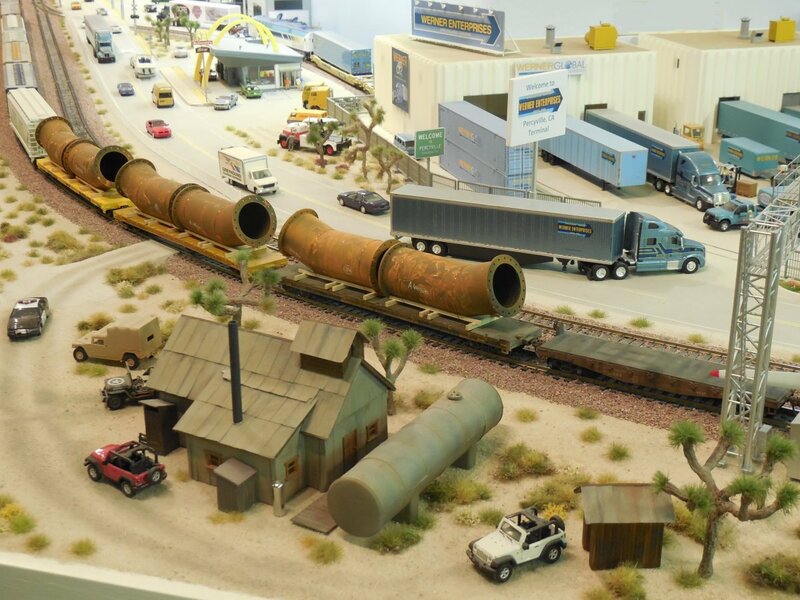 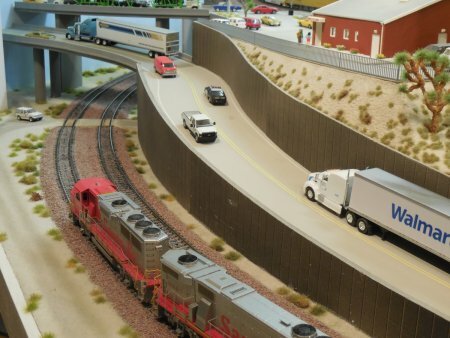 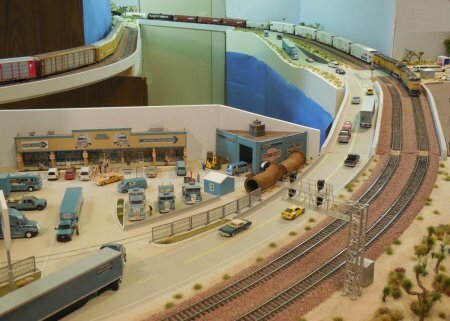 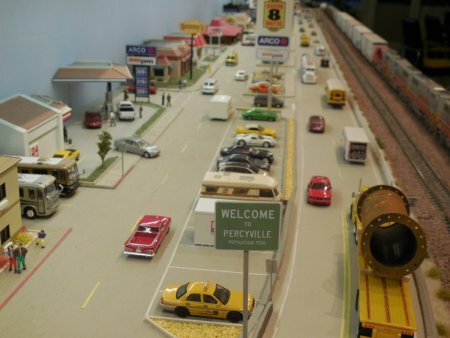 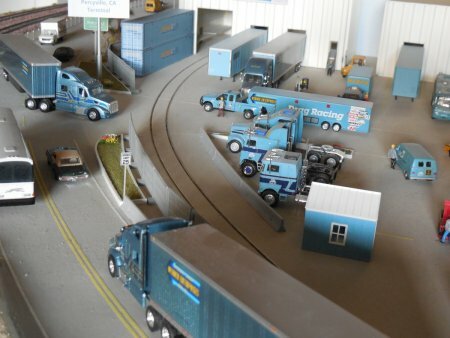 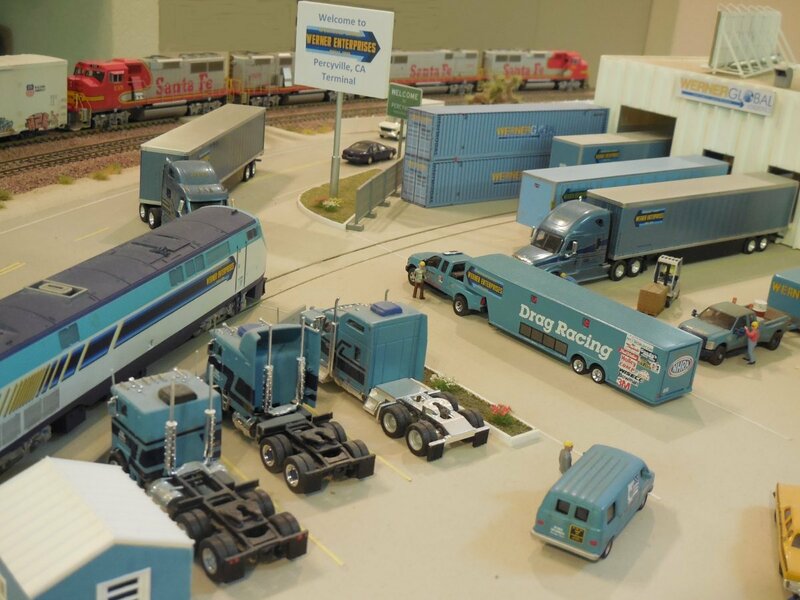 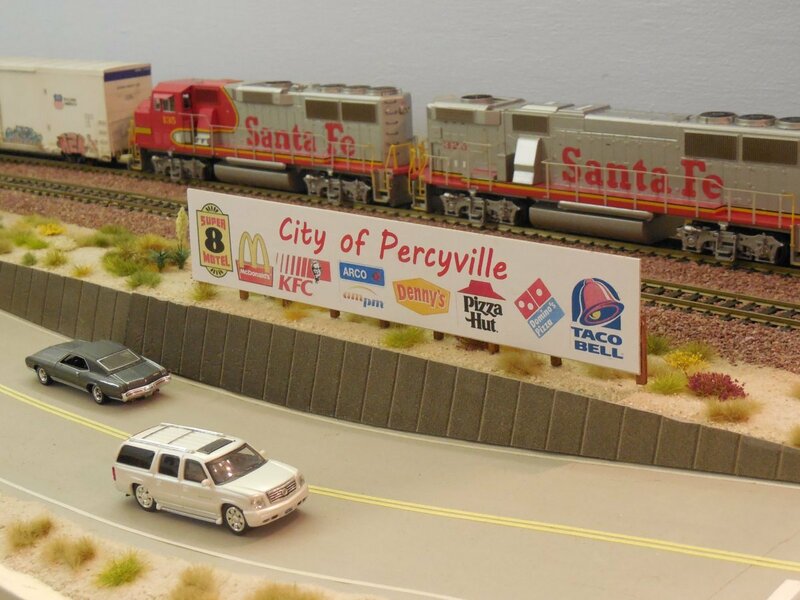 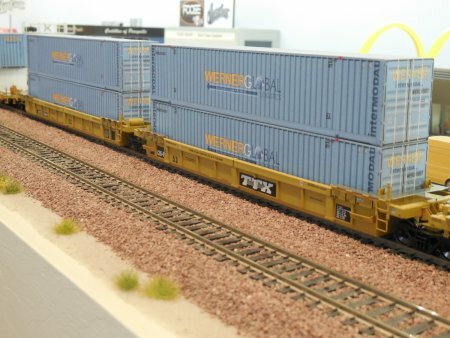 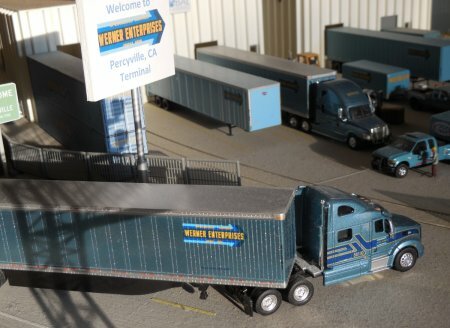 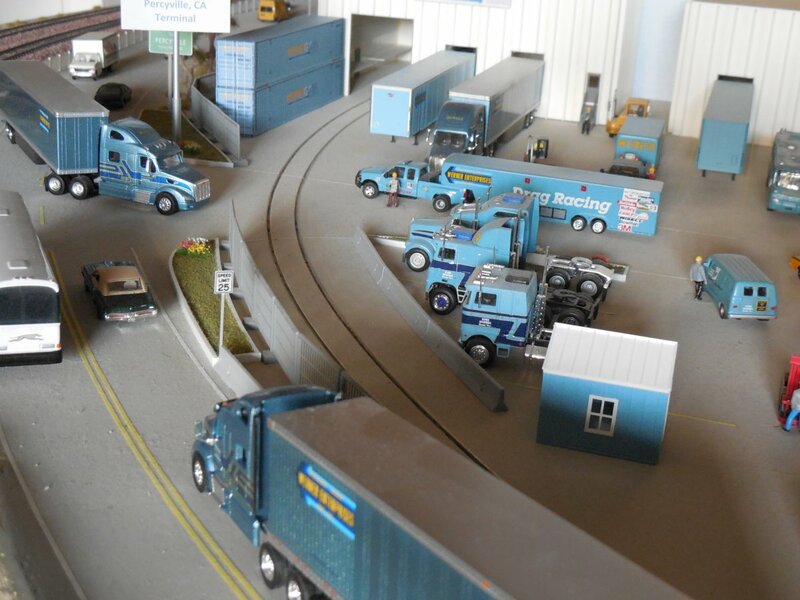 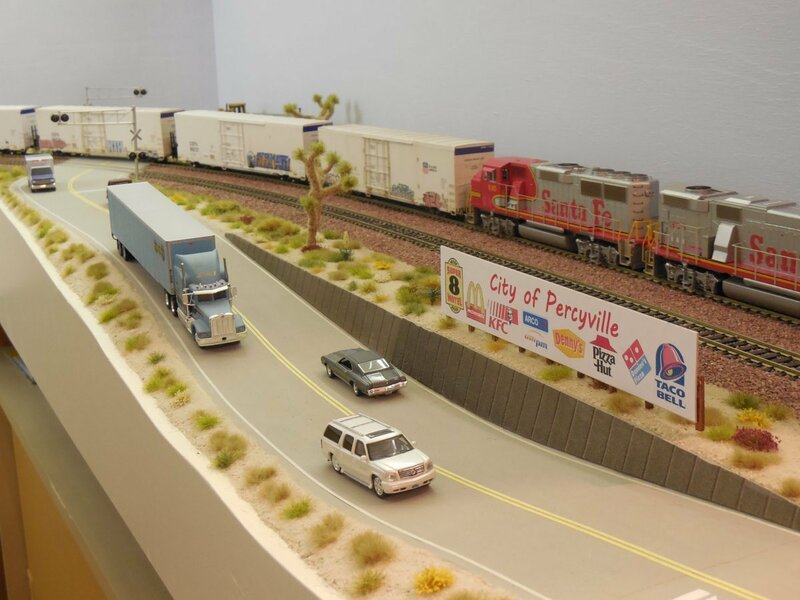 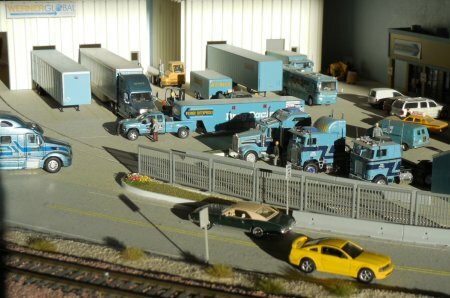 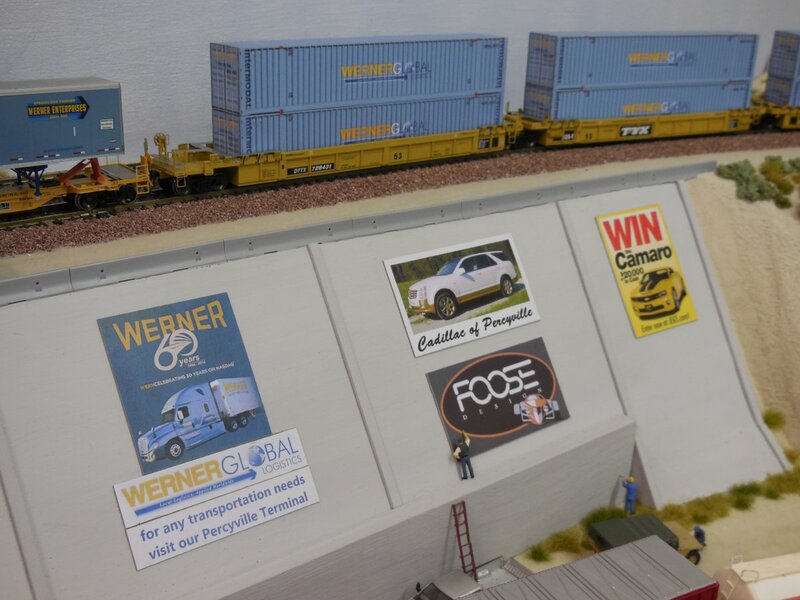 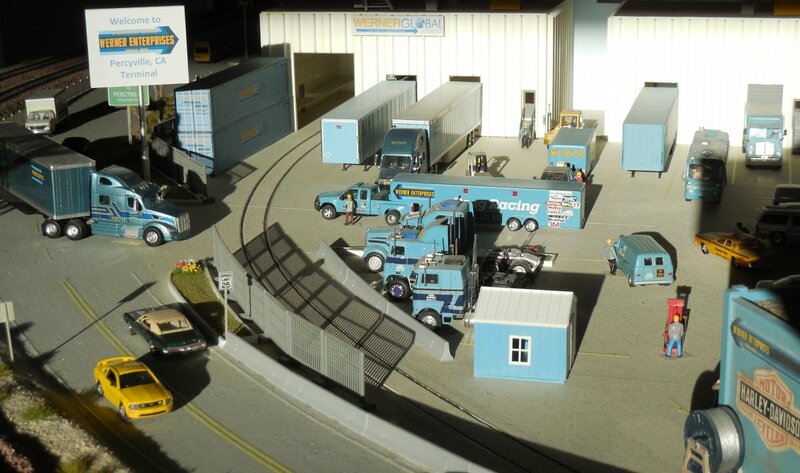 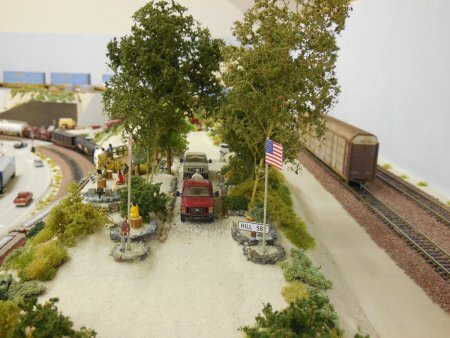 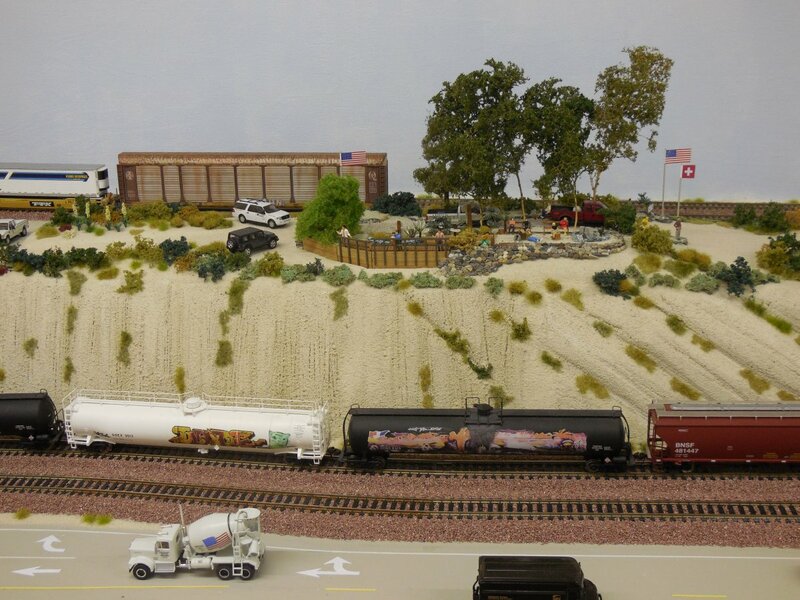 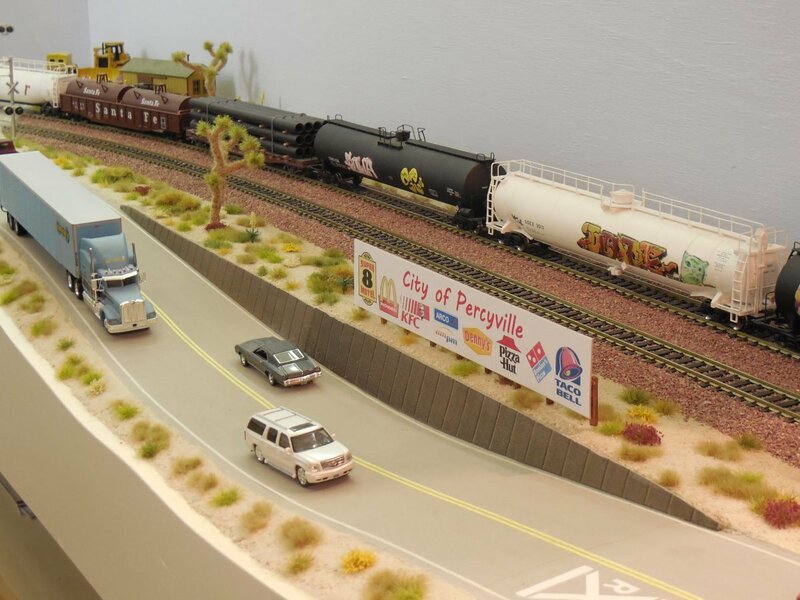 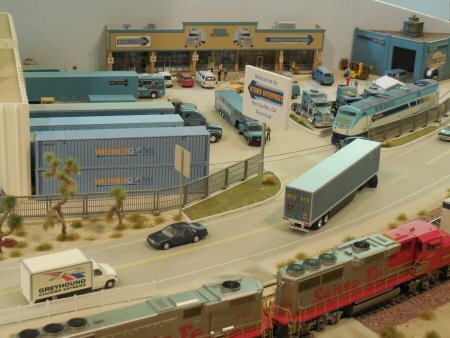 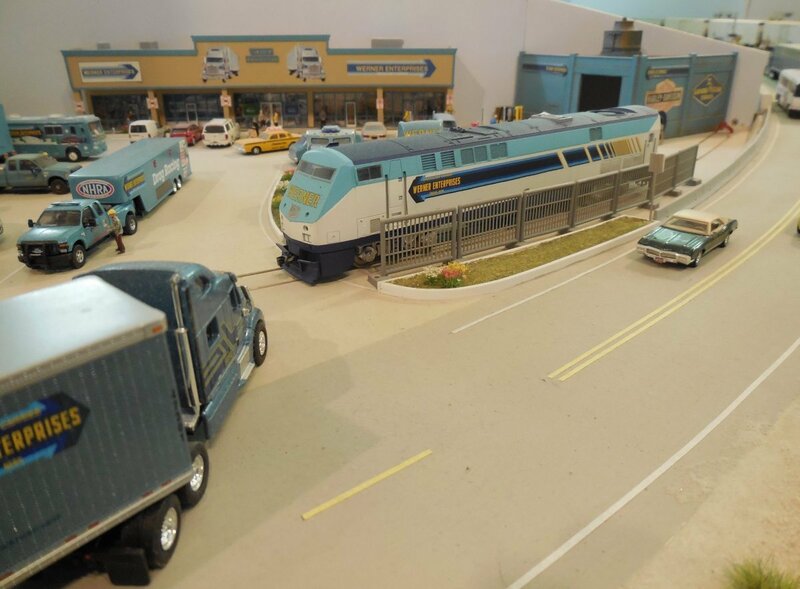 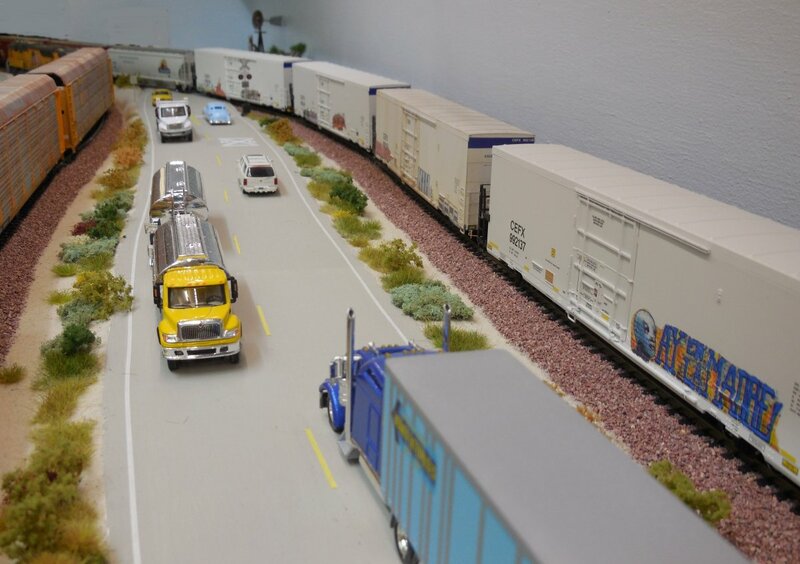 Werner Enterprises with their Terminal is the main business in Percyville. 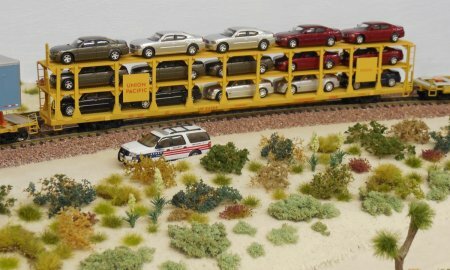 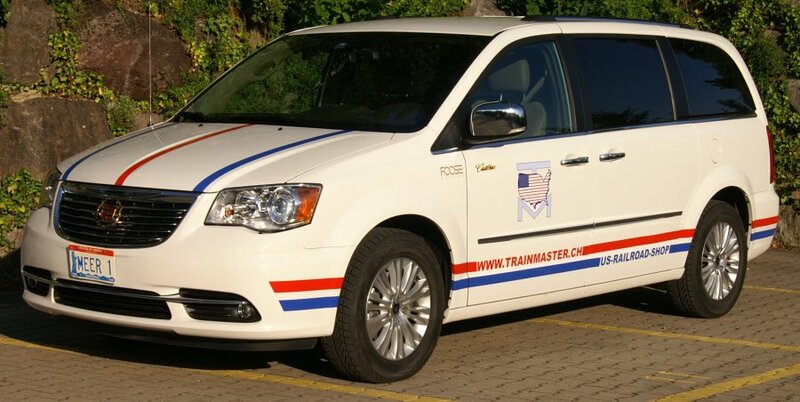 They are the only company with a rail connection to the main line for TOFC cars. 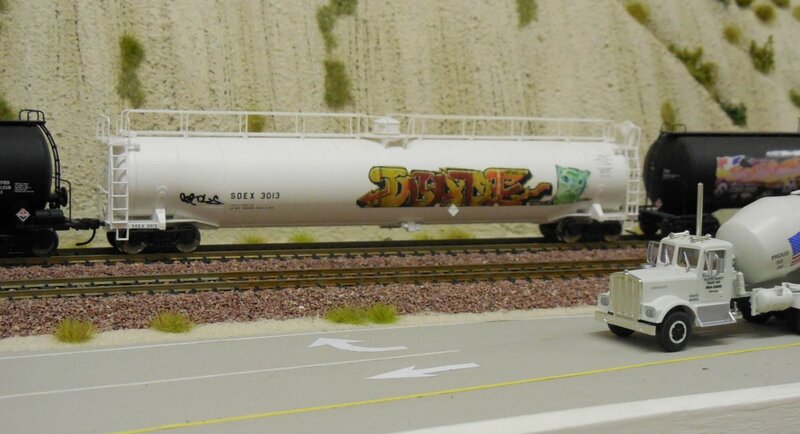 They even have their own Diesel Loco to move the cars. 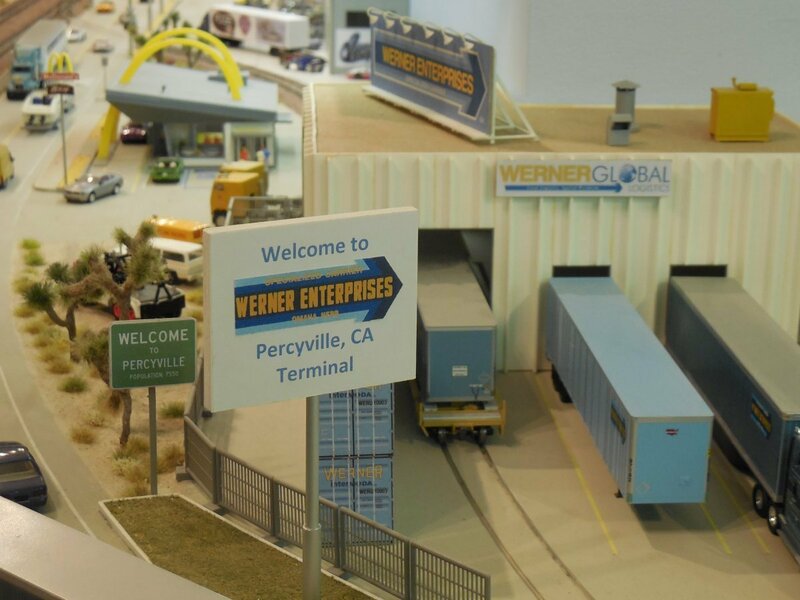 After the Werner Terminal which is at the East end of Percyville, we slowly proceed toward the West end (from right to left). 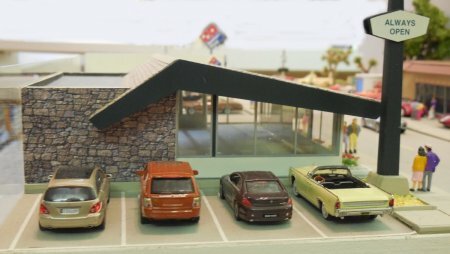 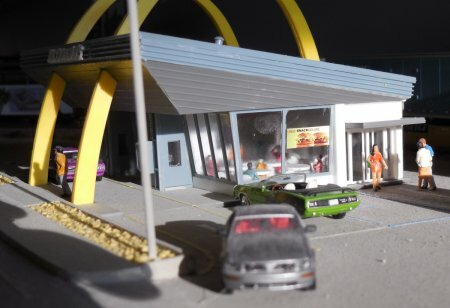 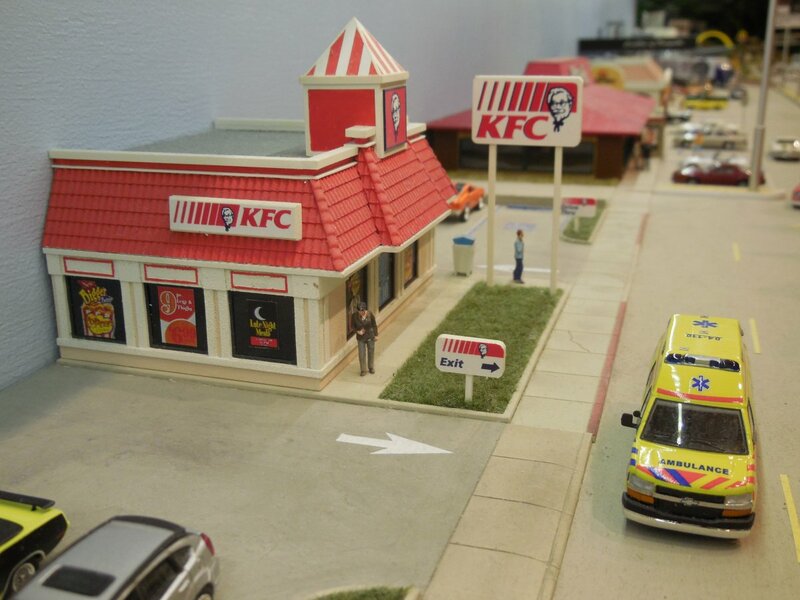 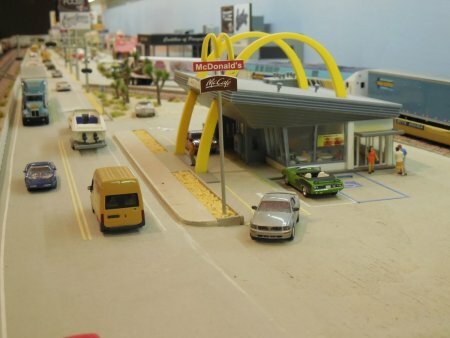 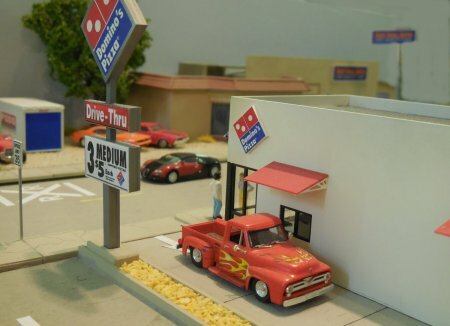 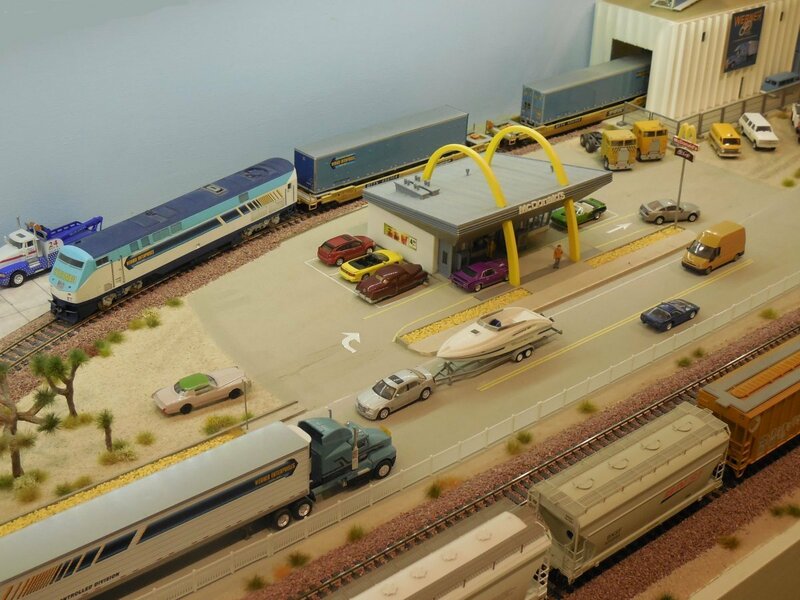 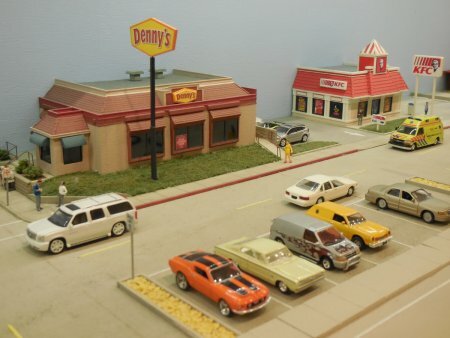 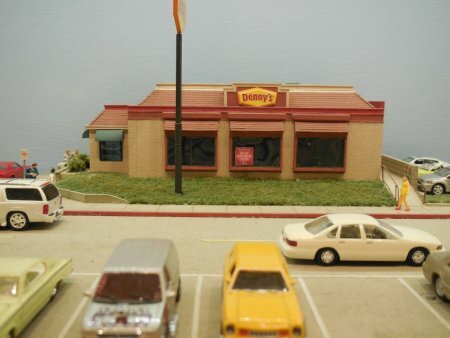 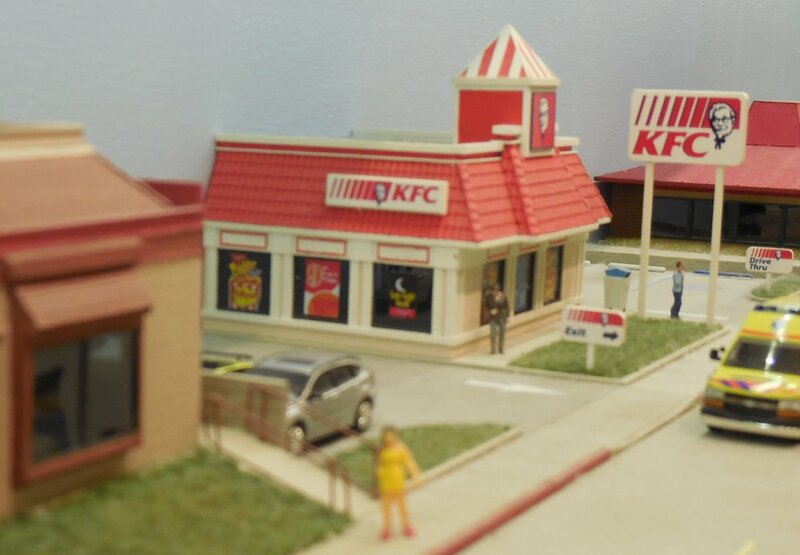 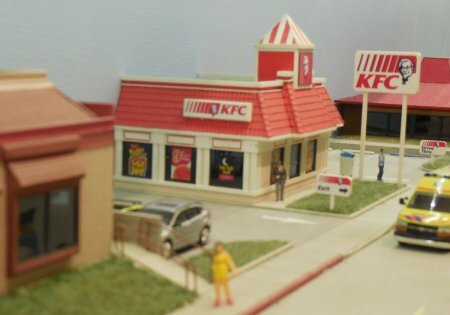 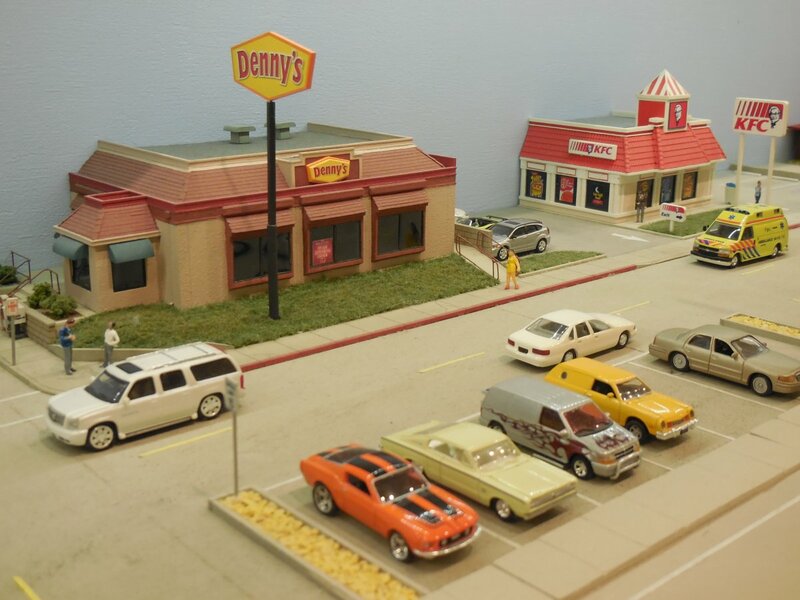 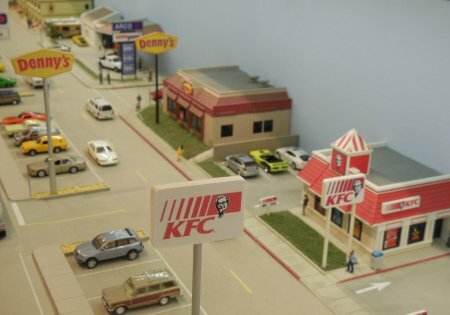 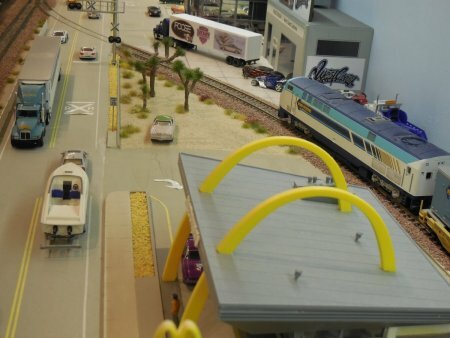 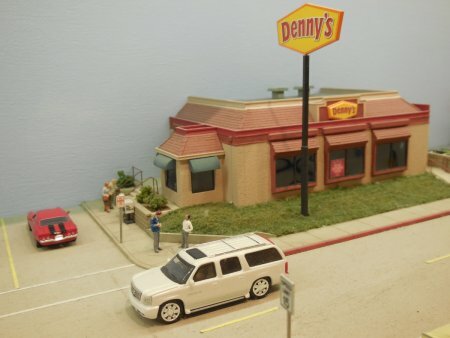 The first business just after the Werner Curve is a Mc Donald's Restaurant. 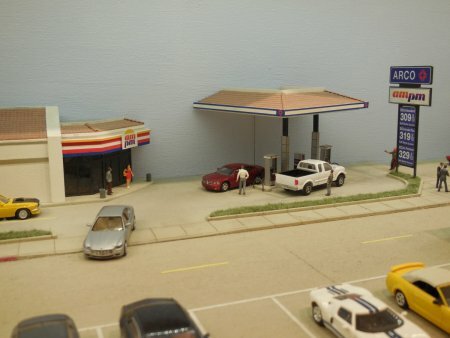 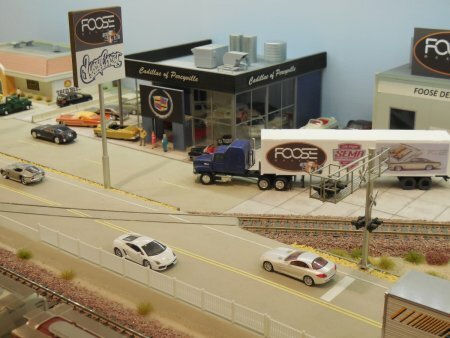 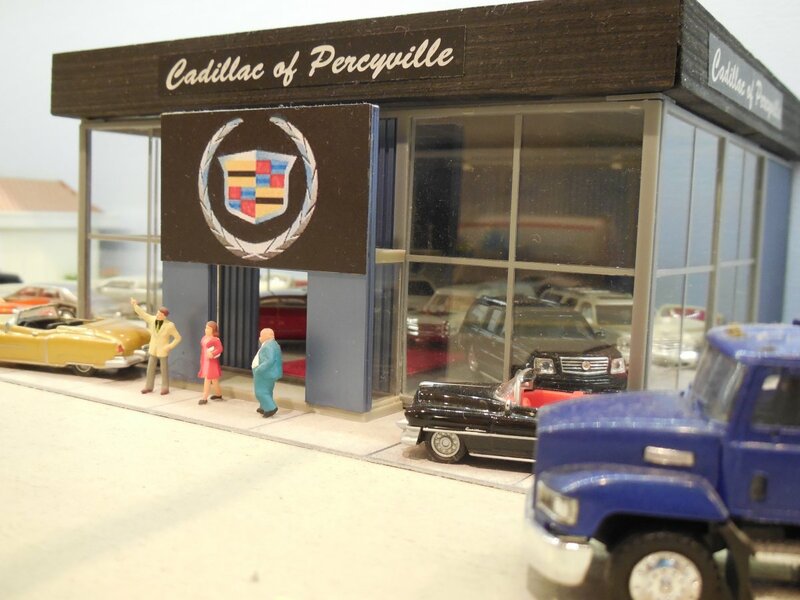 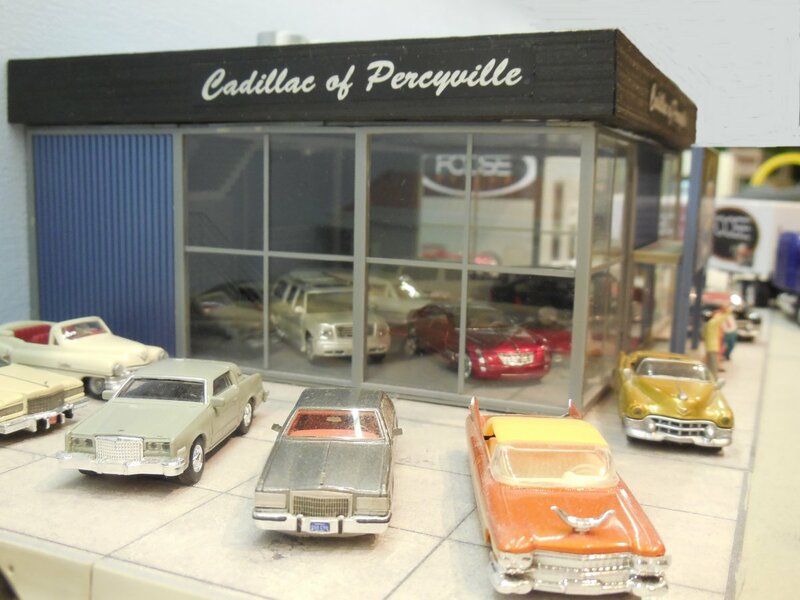 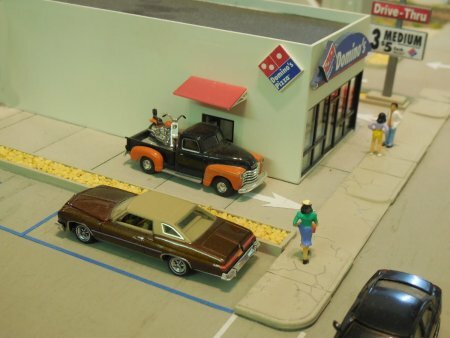 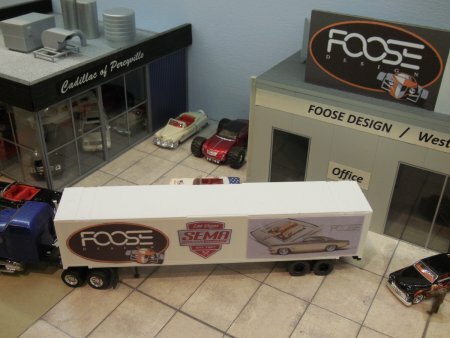 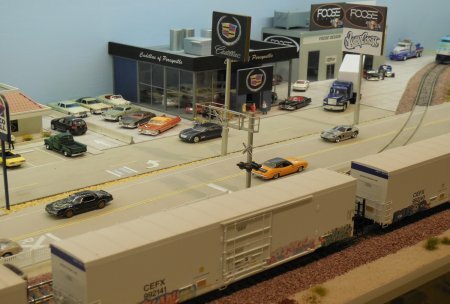 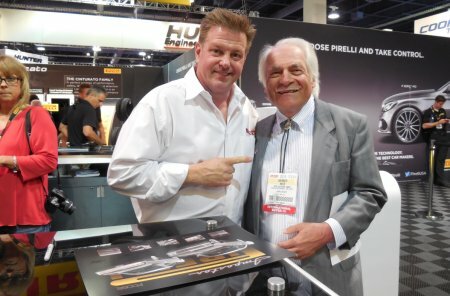 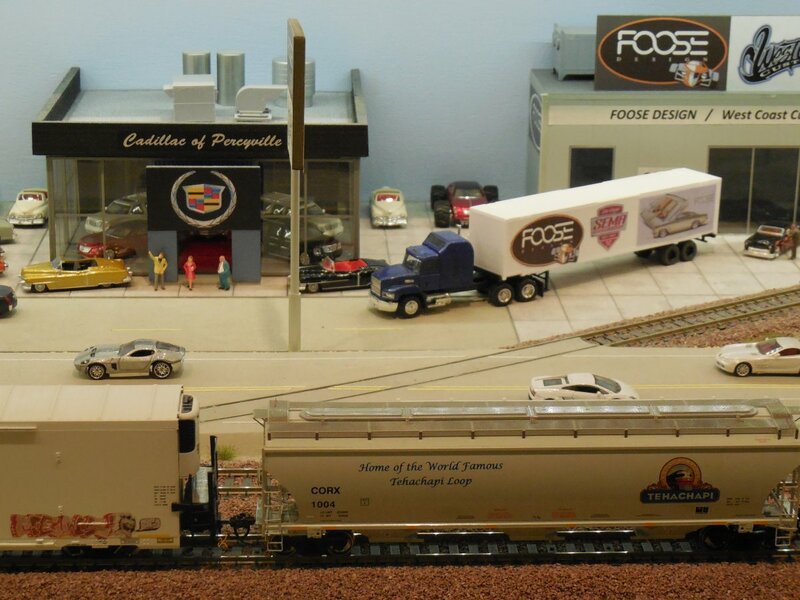 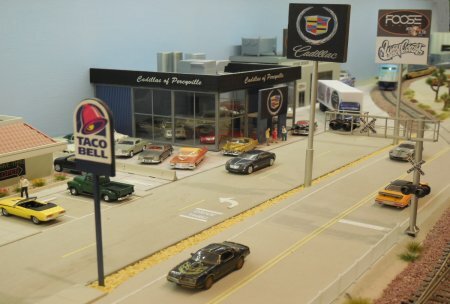 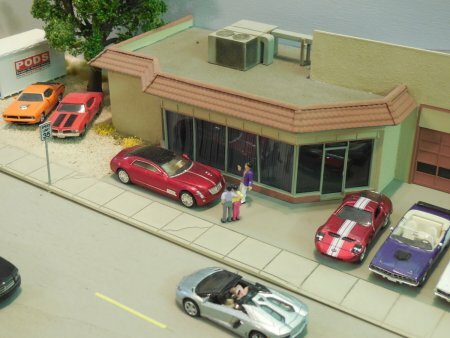 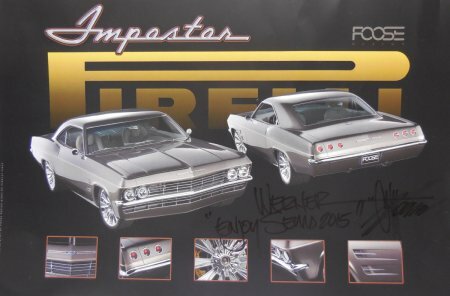 Percyville Layout Tour continued below - after Foose Design, there is Cadillac of Percyville. 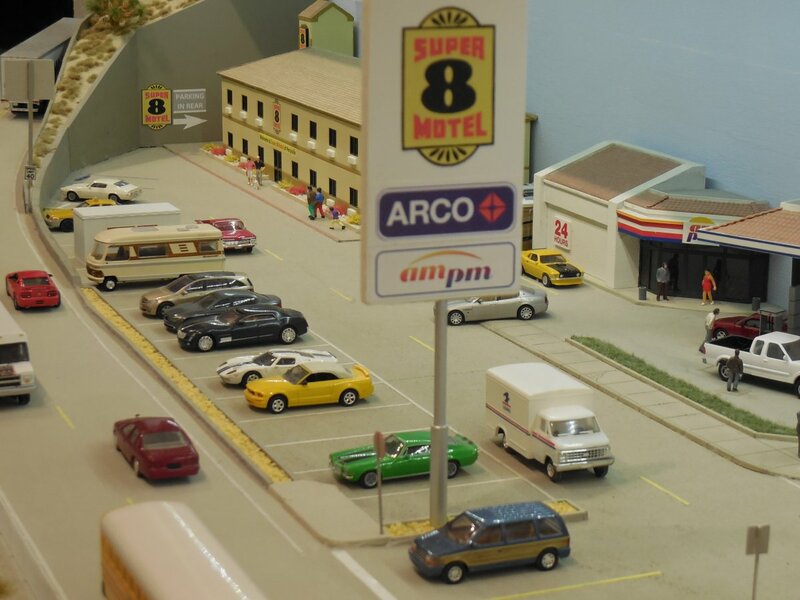 The Super 8 Motel is the last building of Percyville. Here starts the curve from the passage to Office 2 on the lower level. 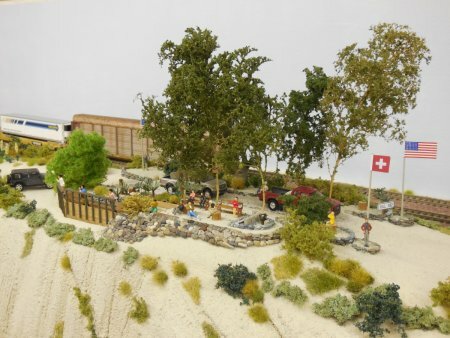 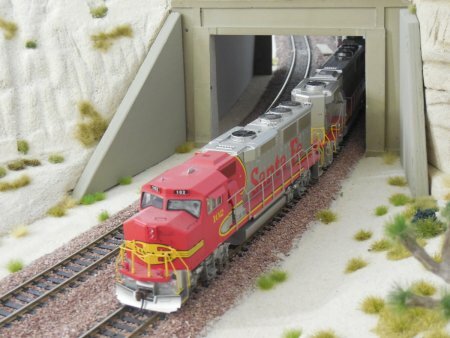 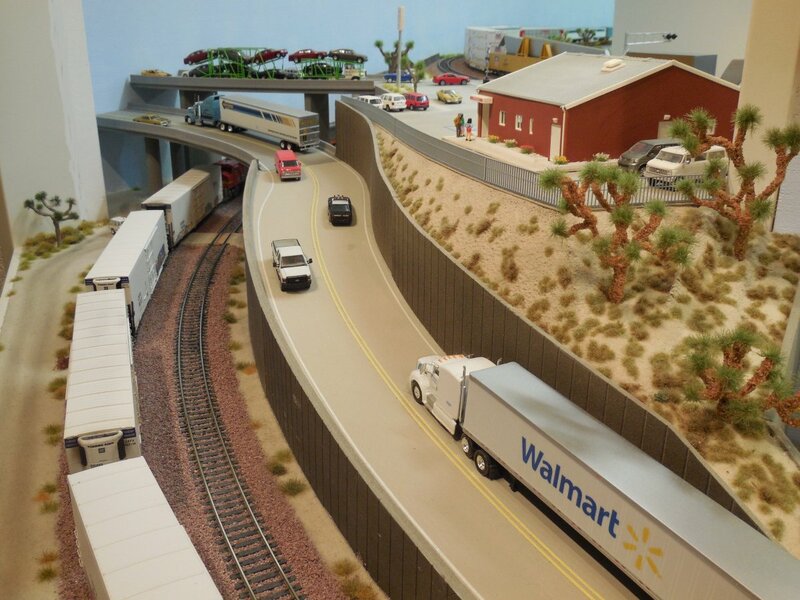 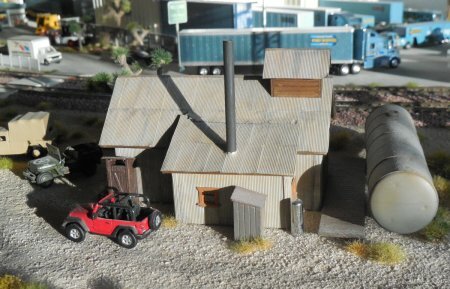 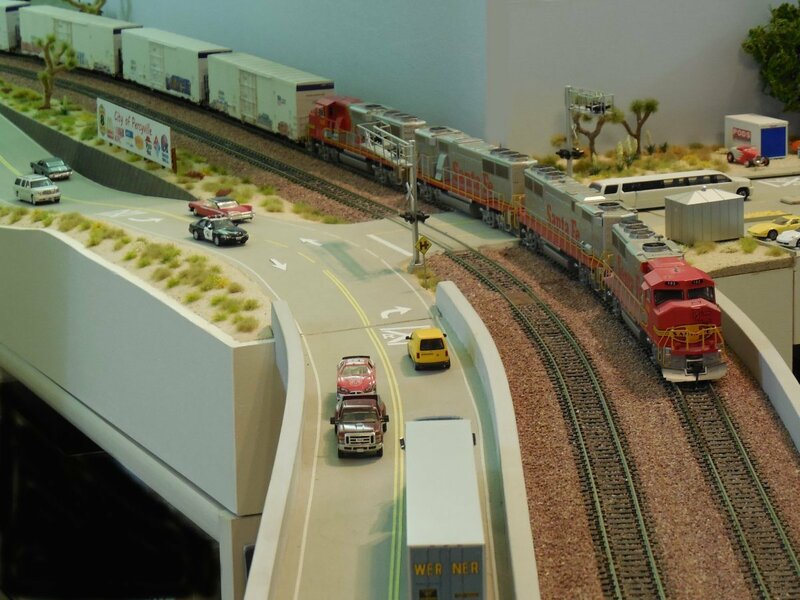 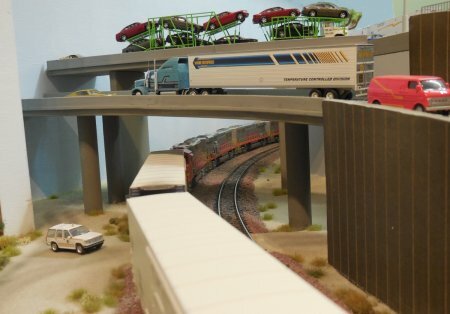 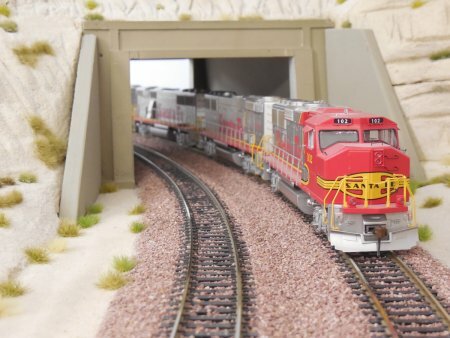 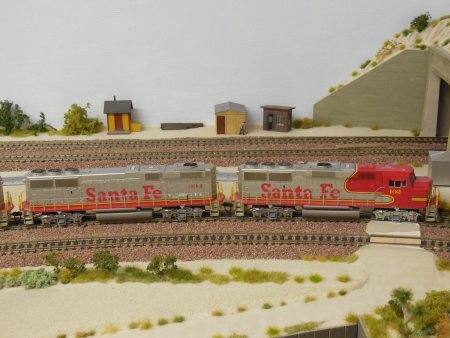 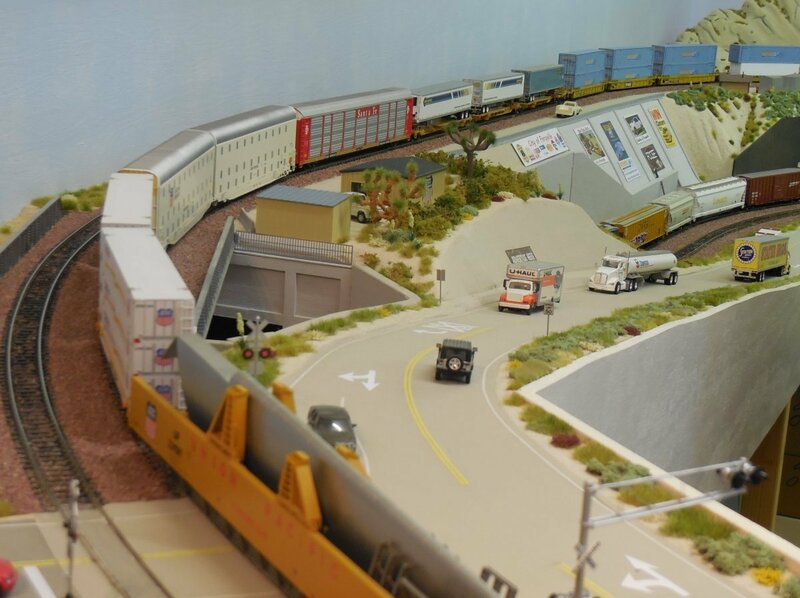 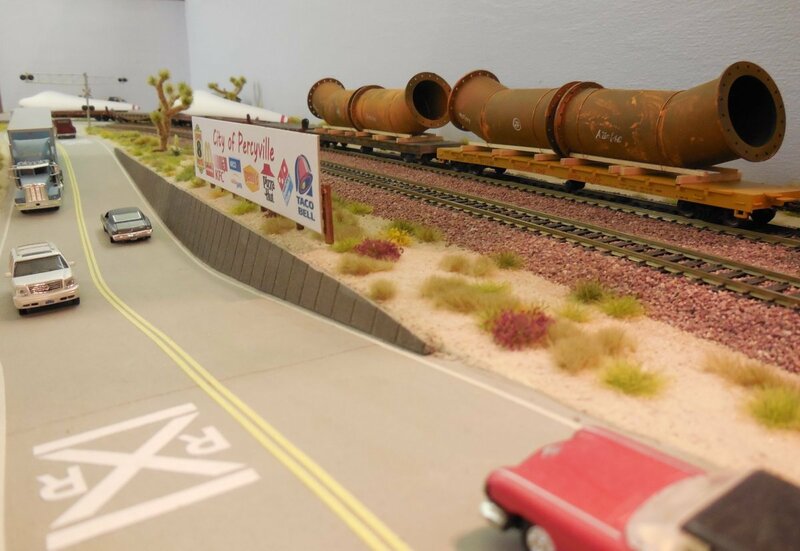 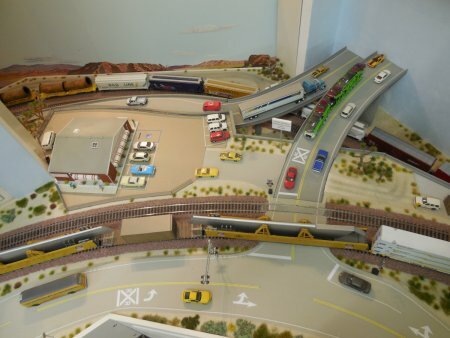 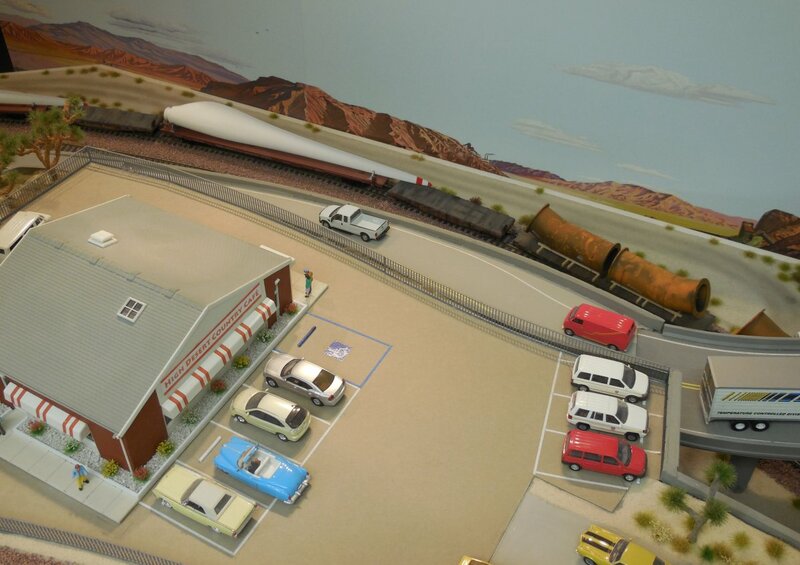 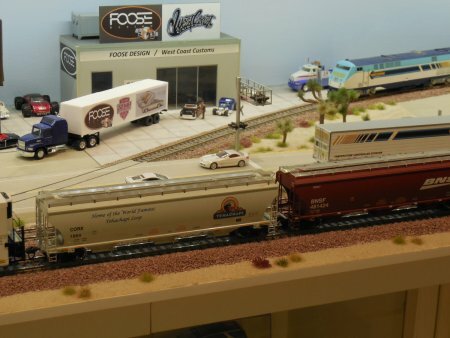 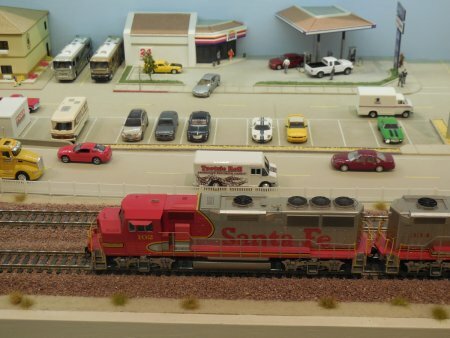 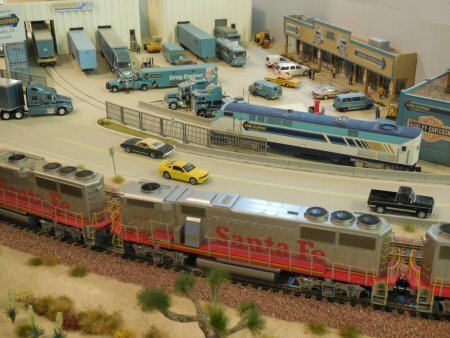 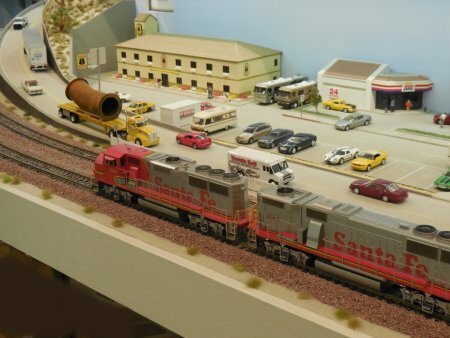 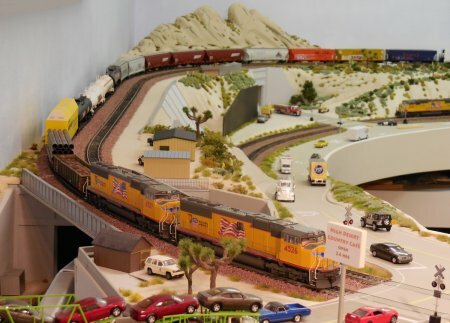 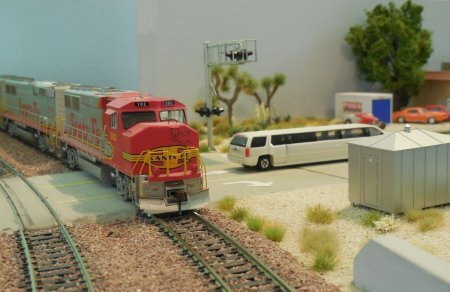 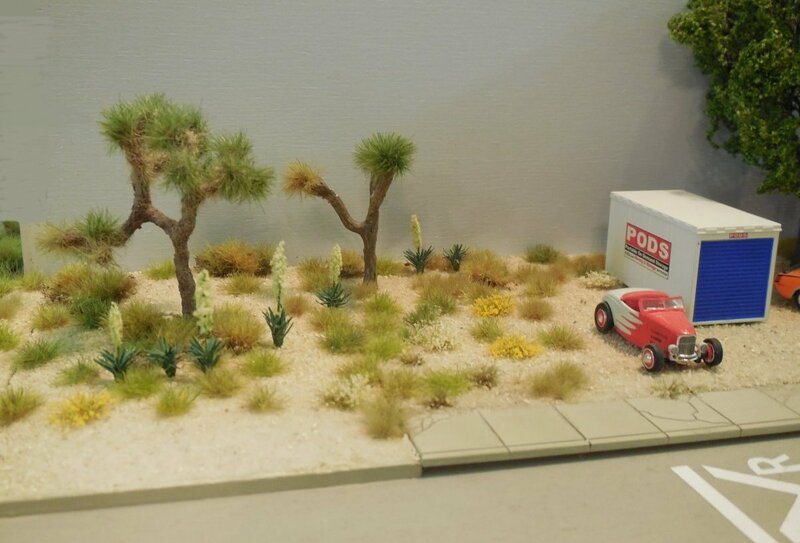 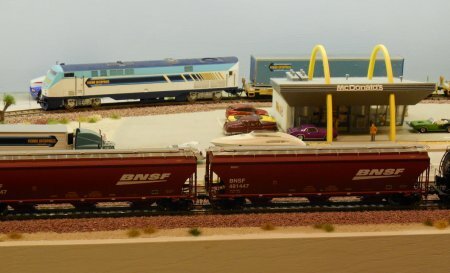 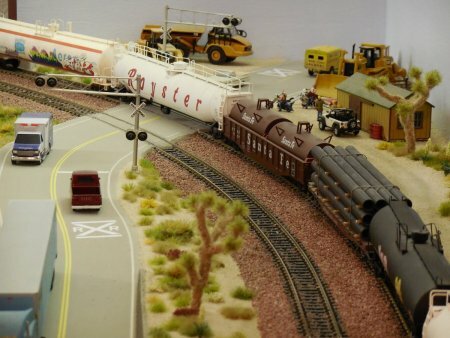 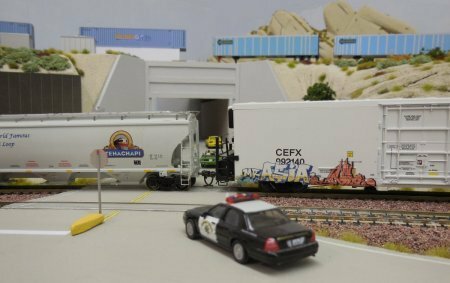 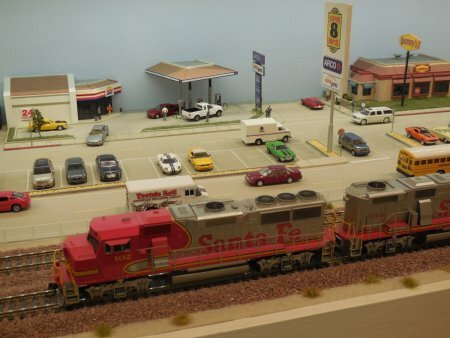 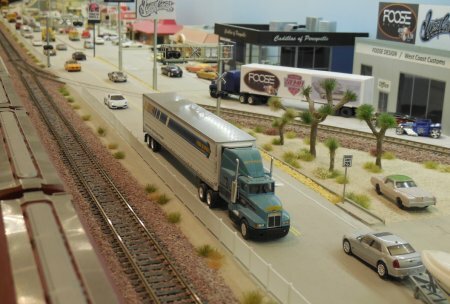 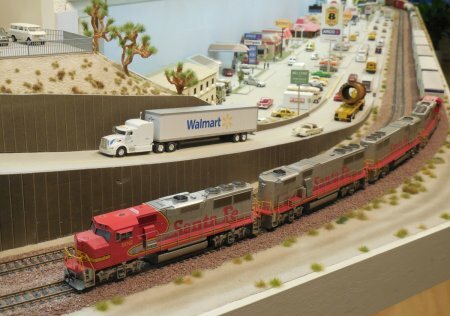 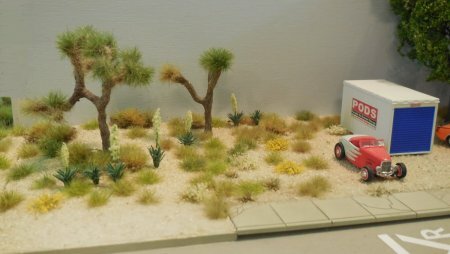 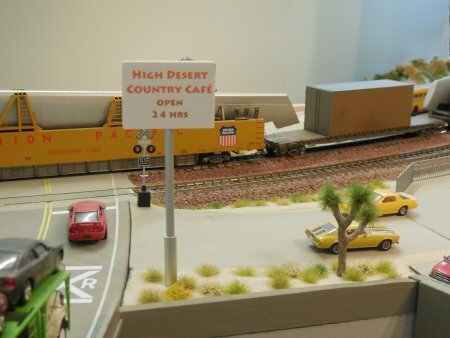 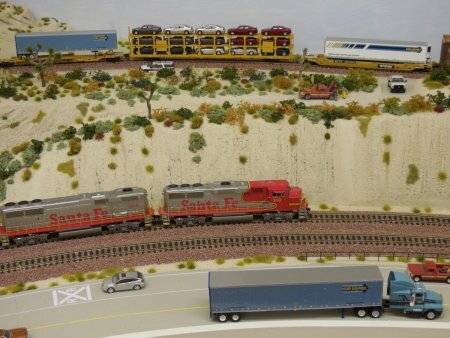 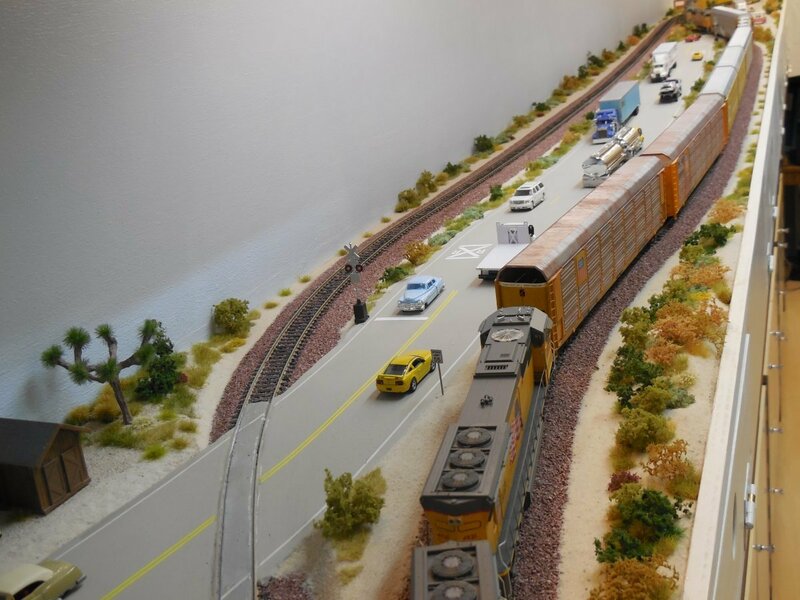 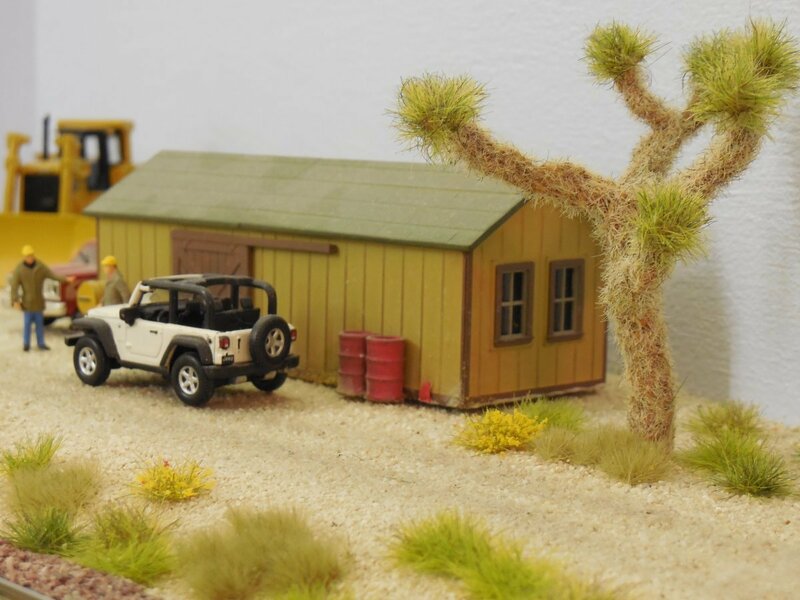 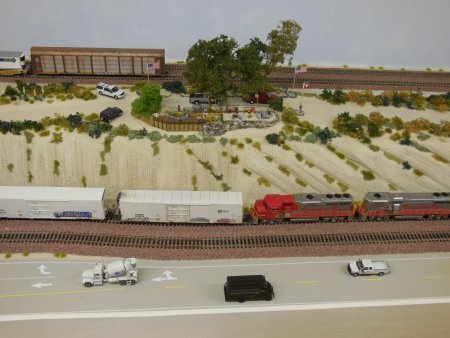 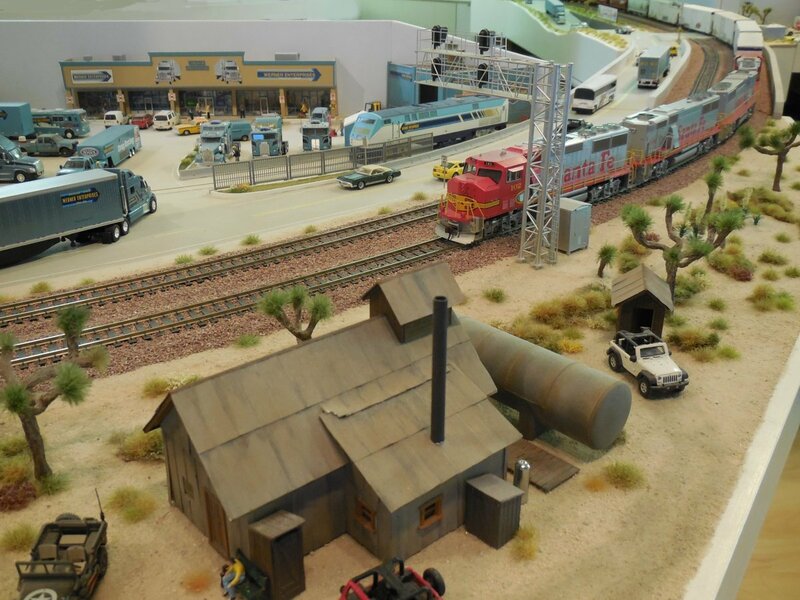 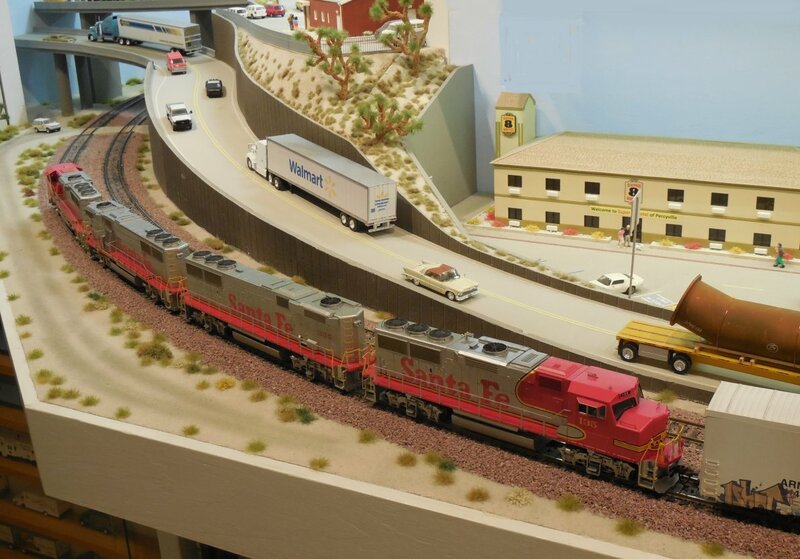 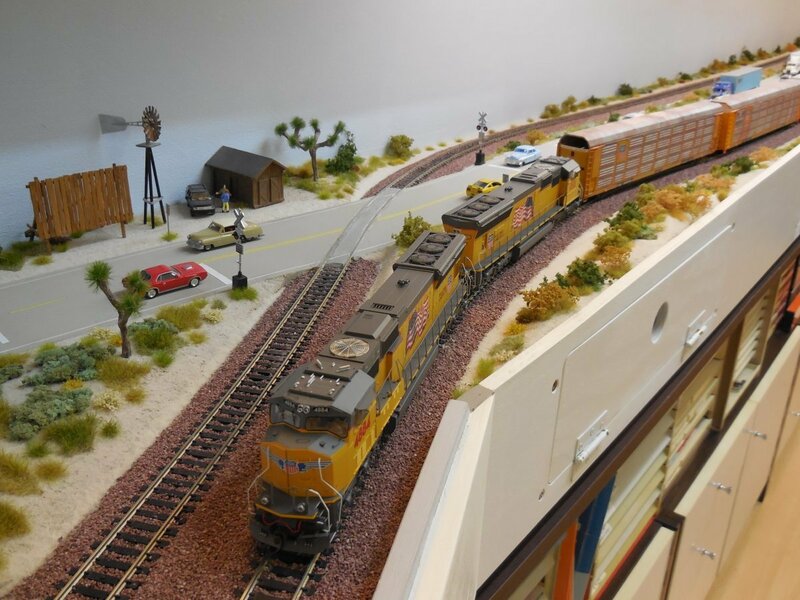 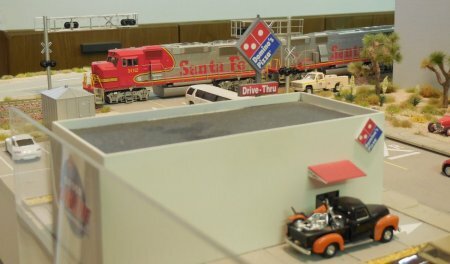 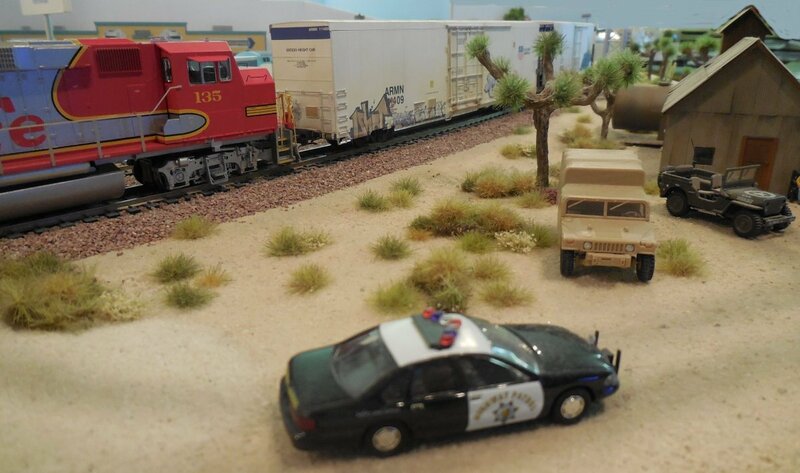 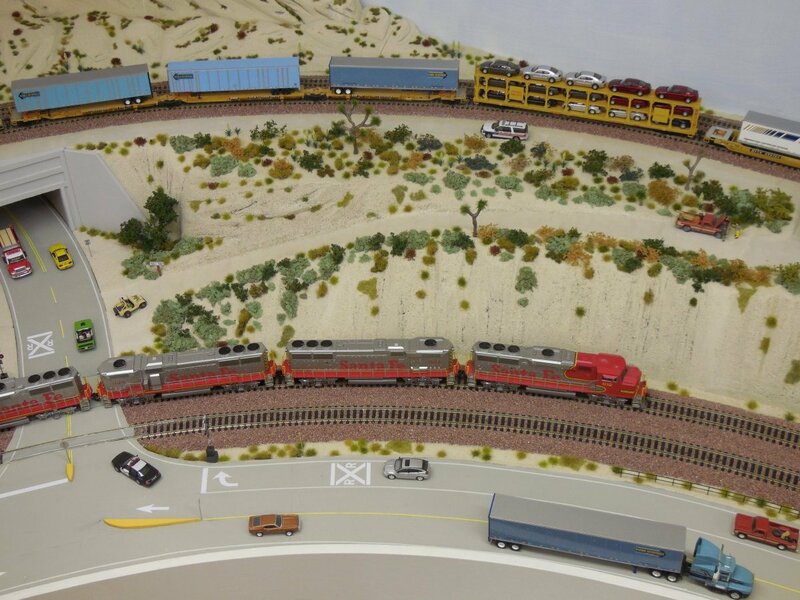 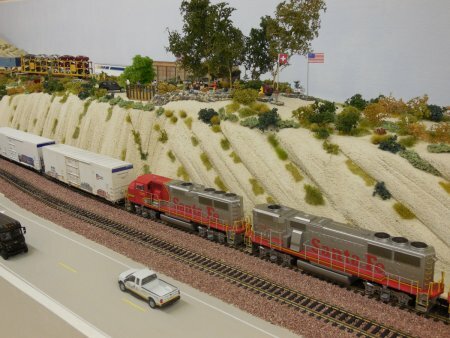 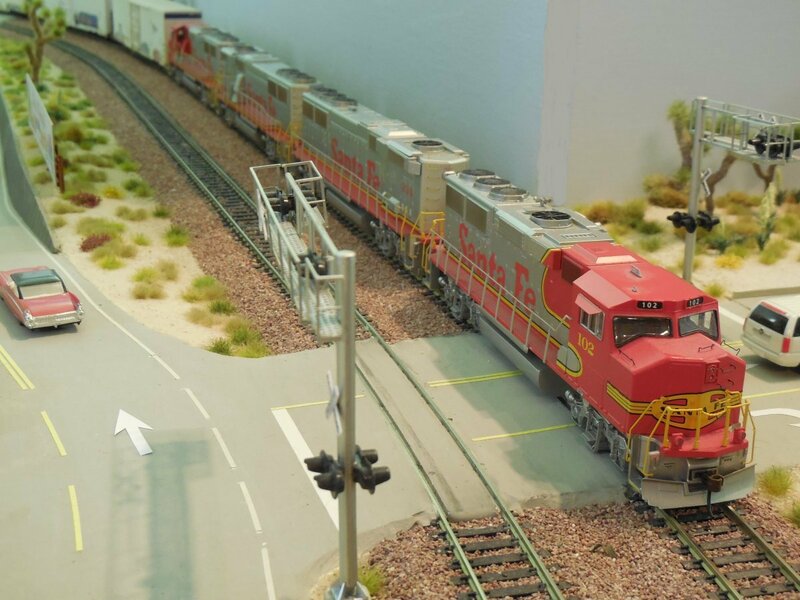 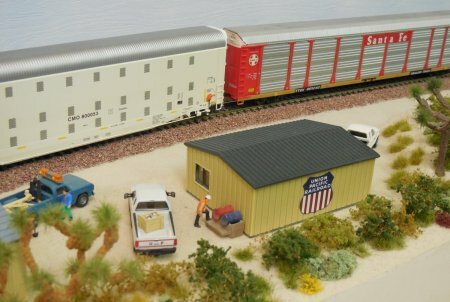 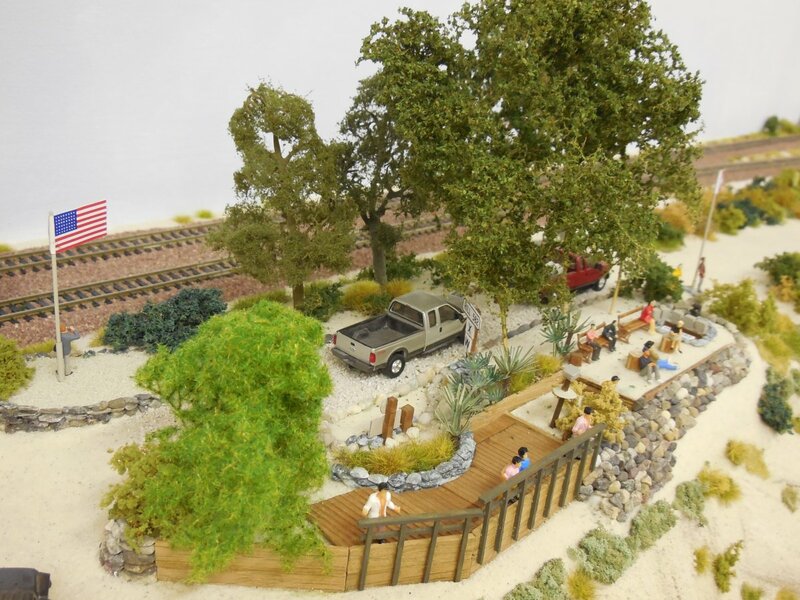 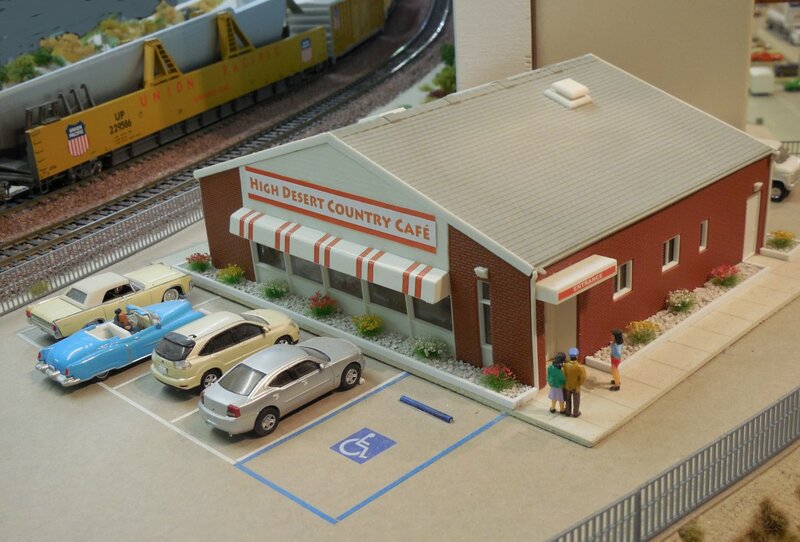 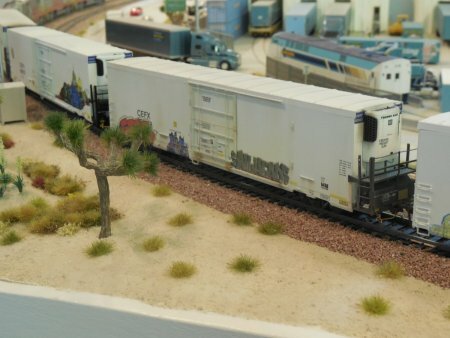 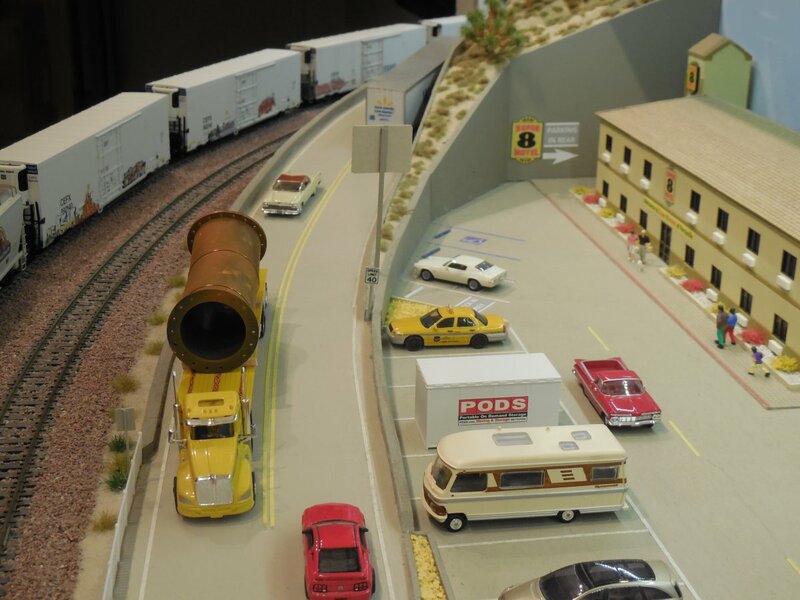 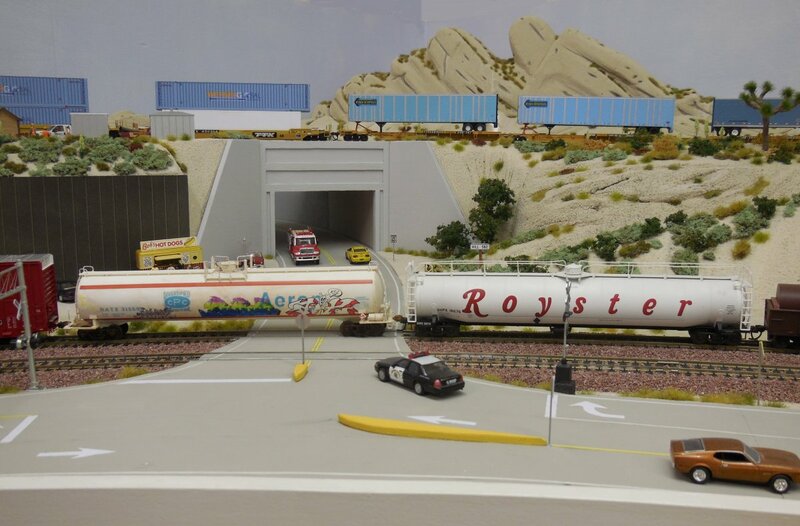 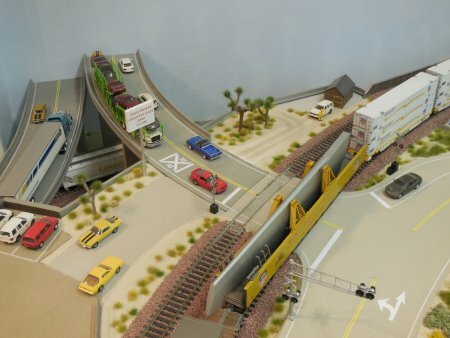 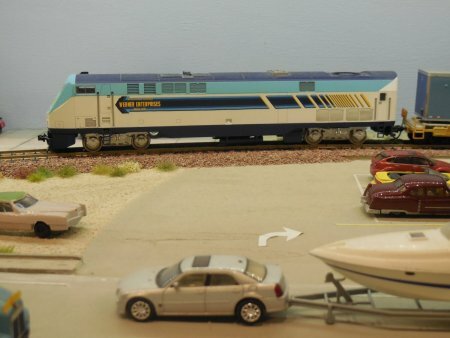 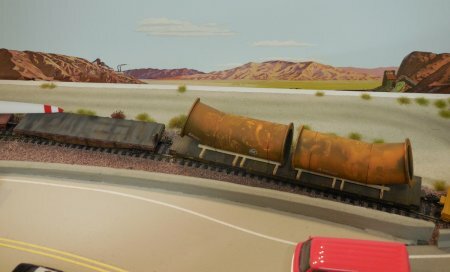 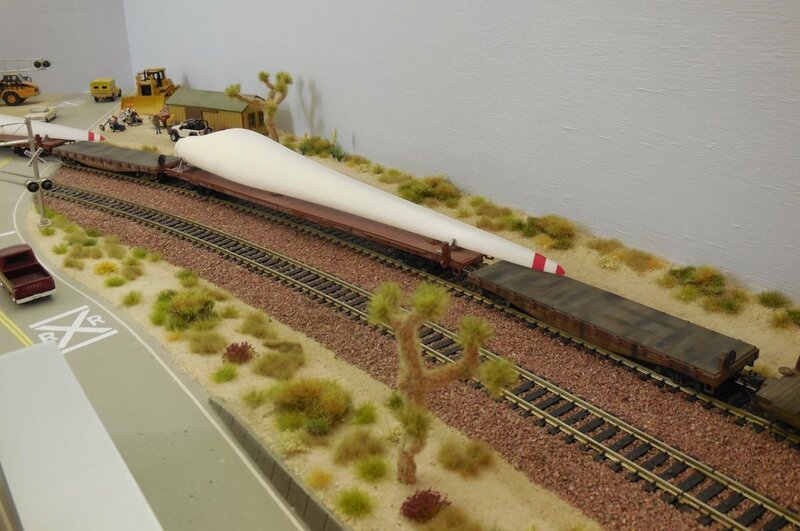 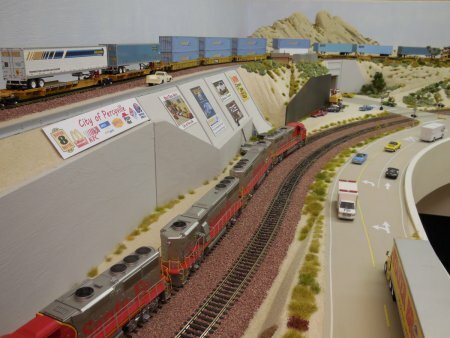 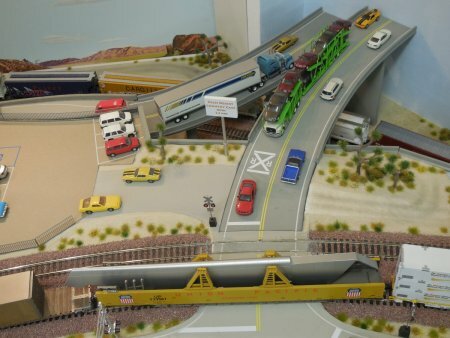 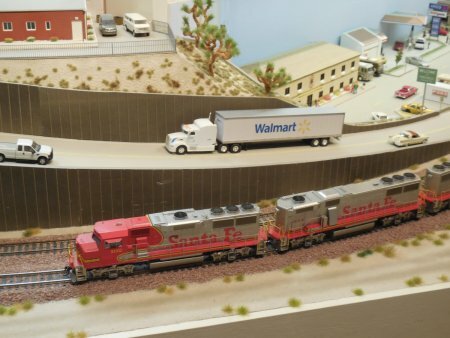 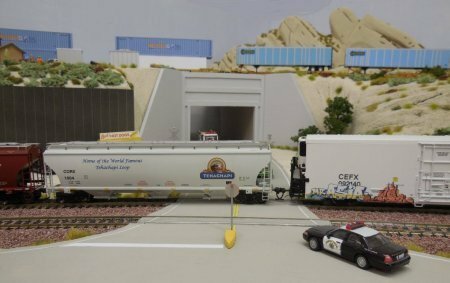 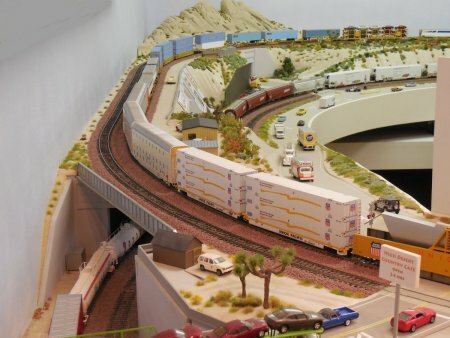 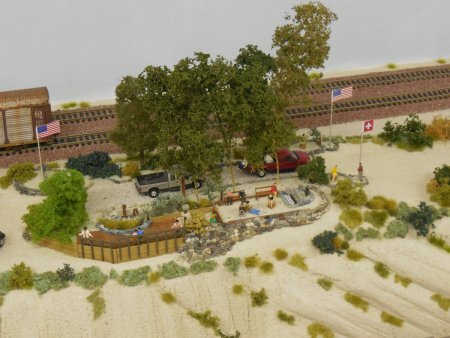 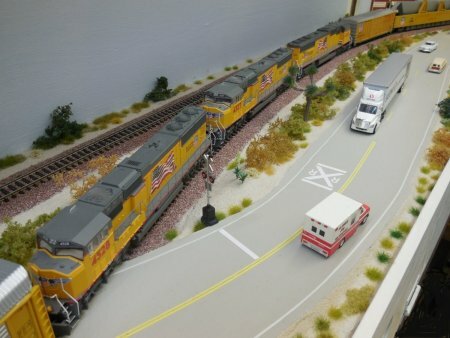 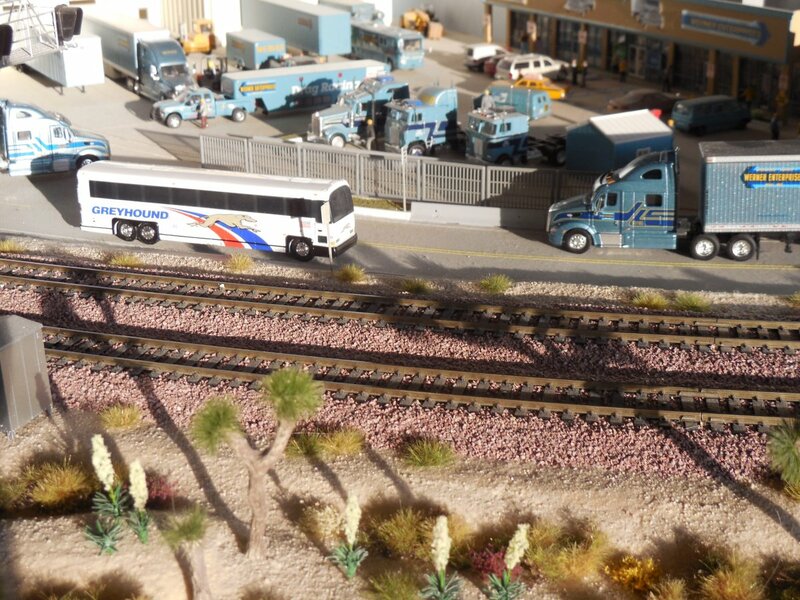 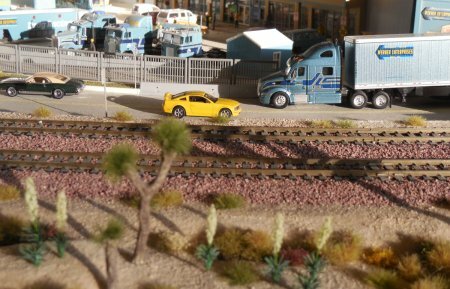 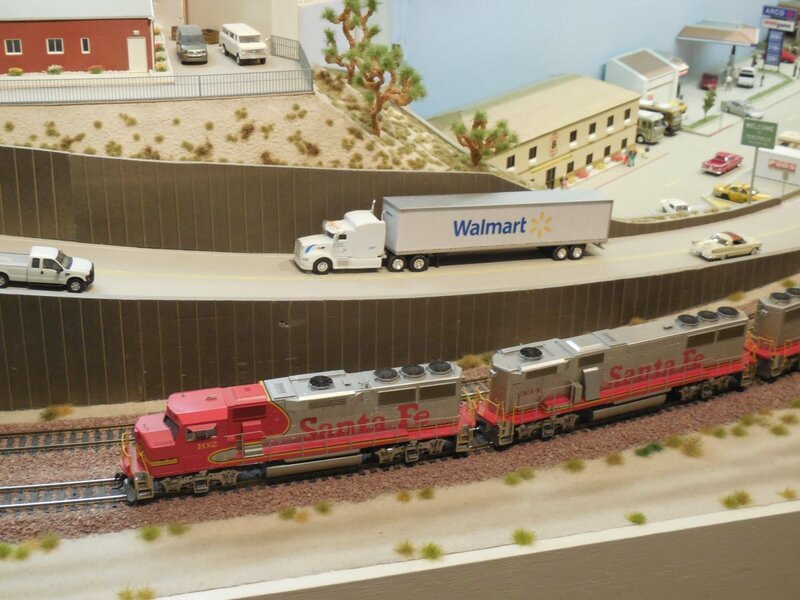 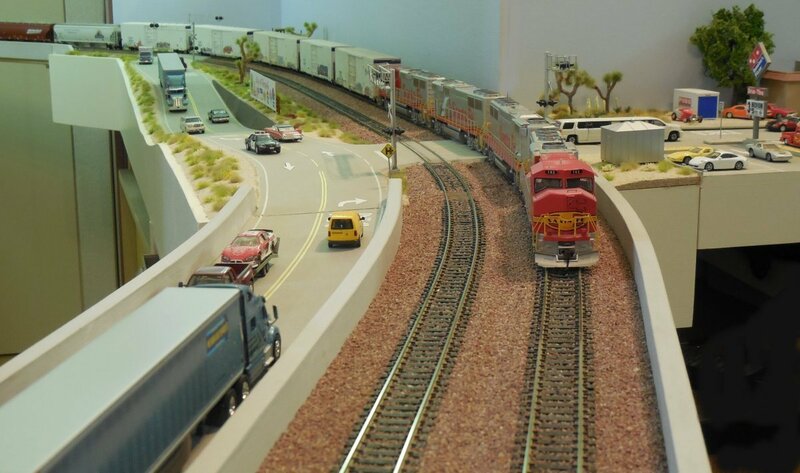 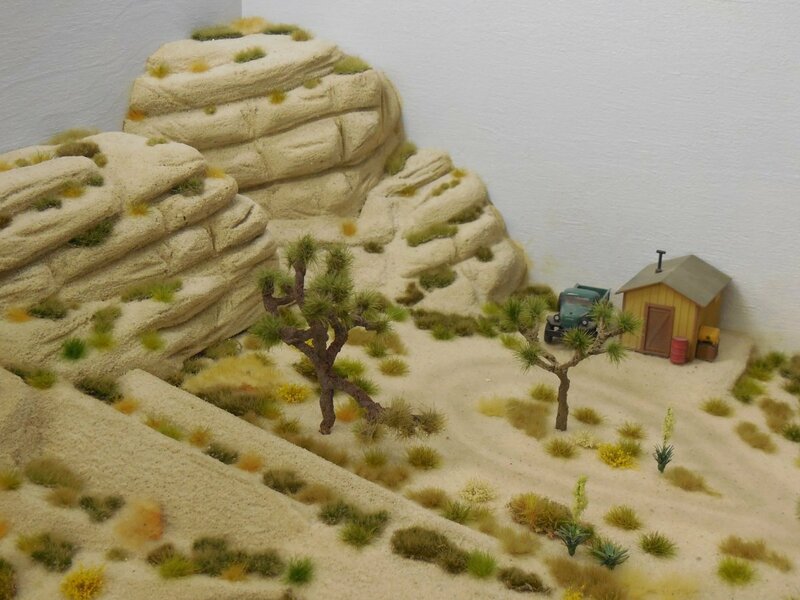 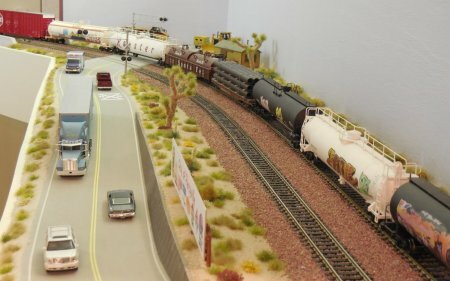 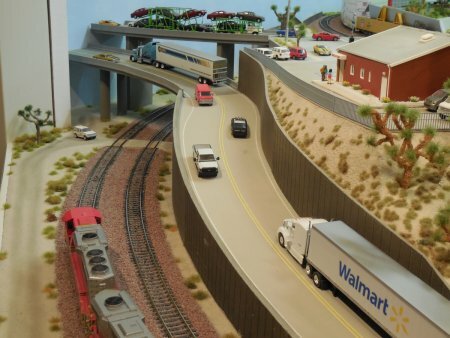 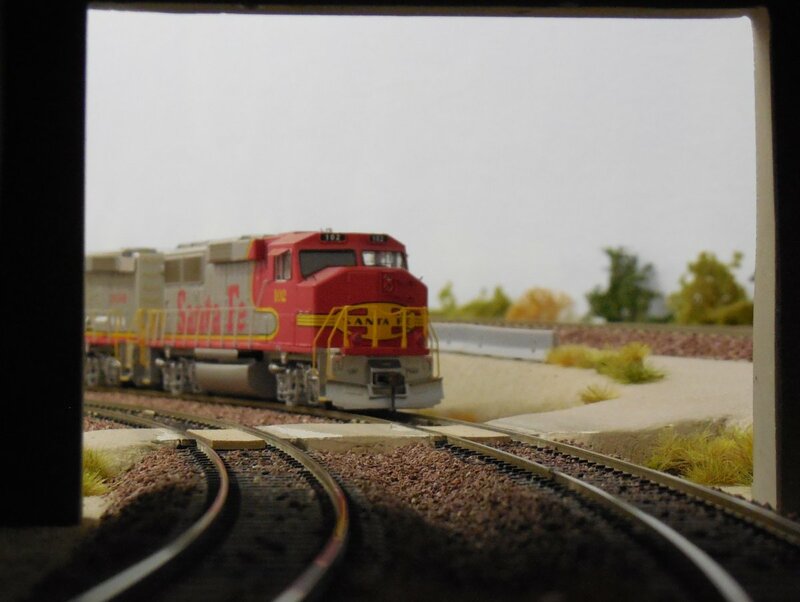 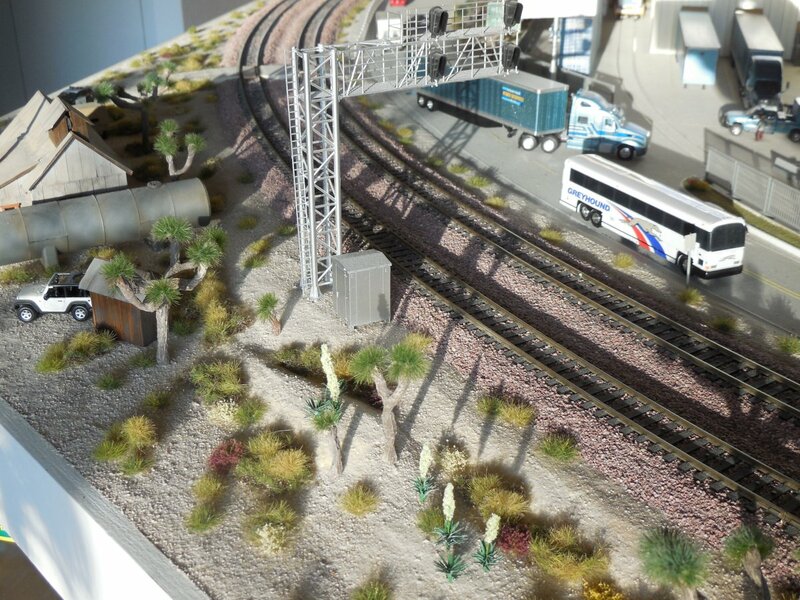 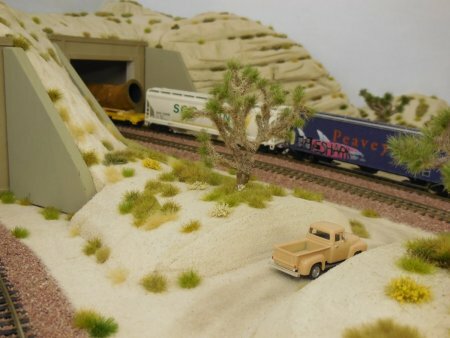 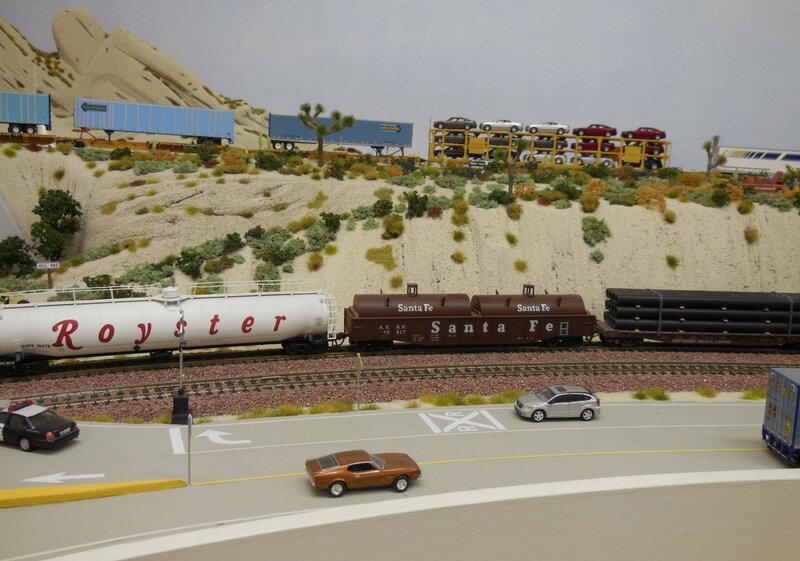 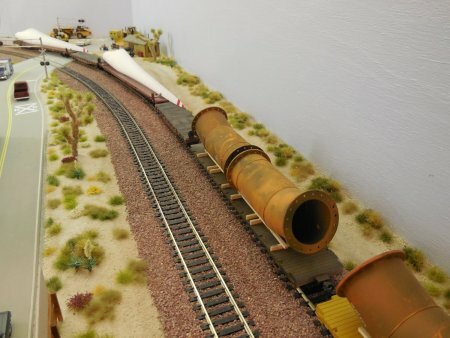 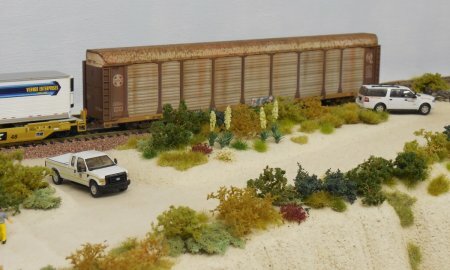 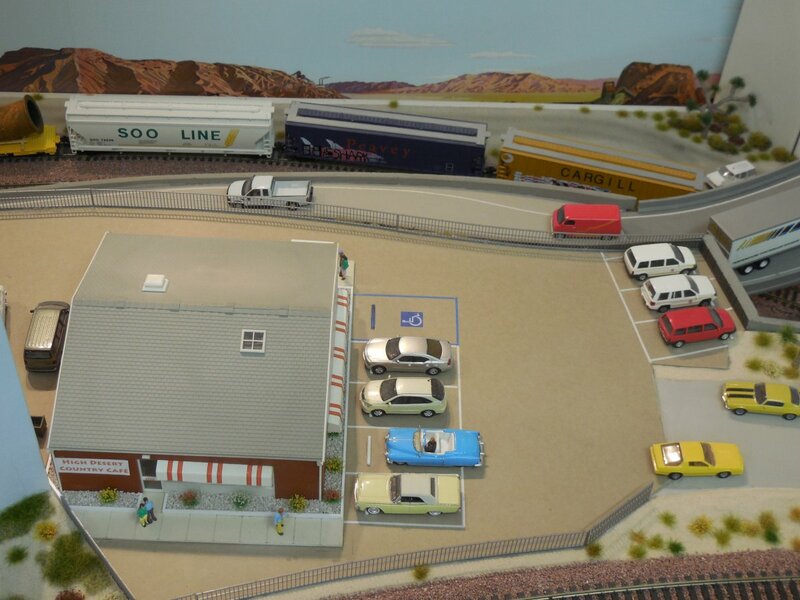 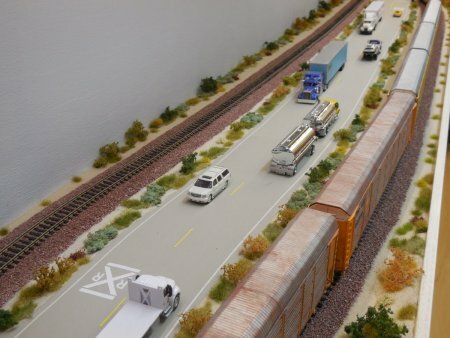 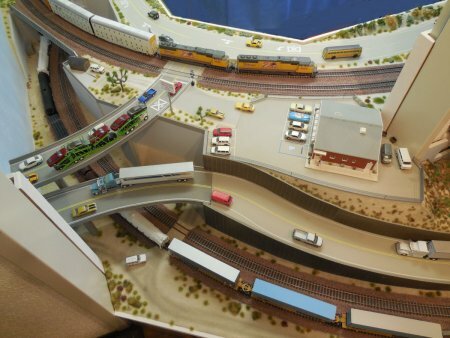 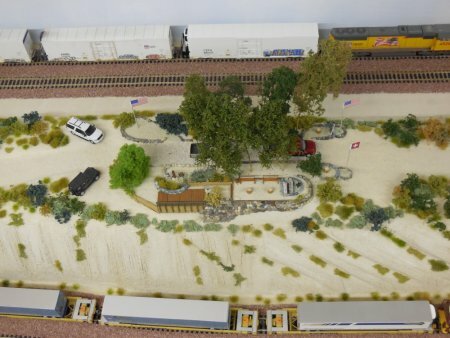 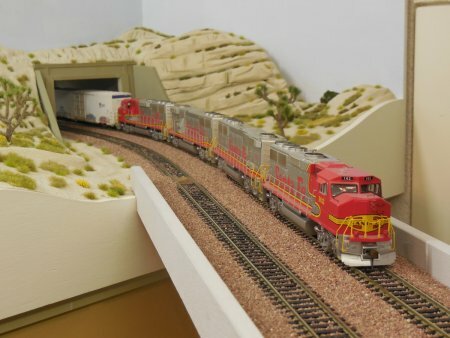 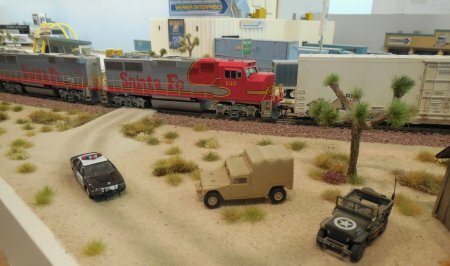 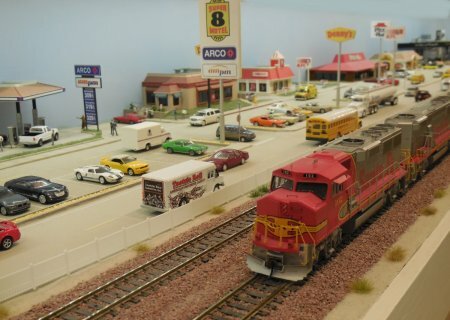 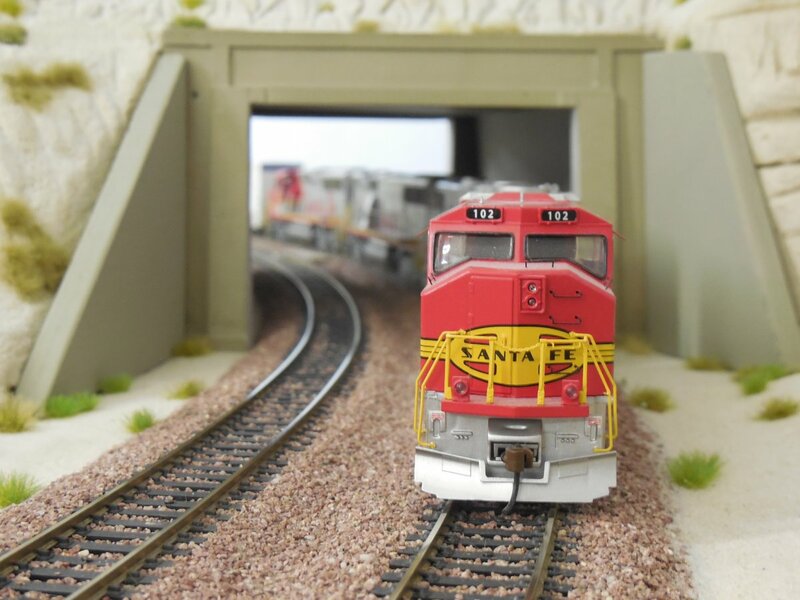 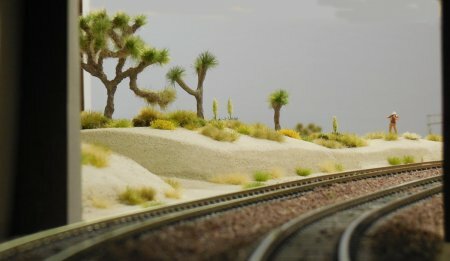 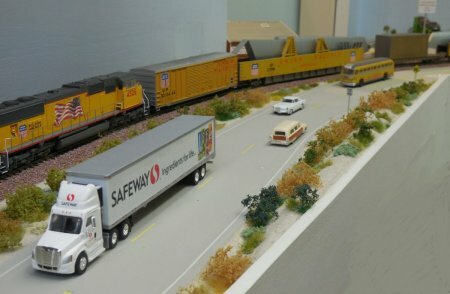 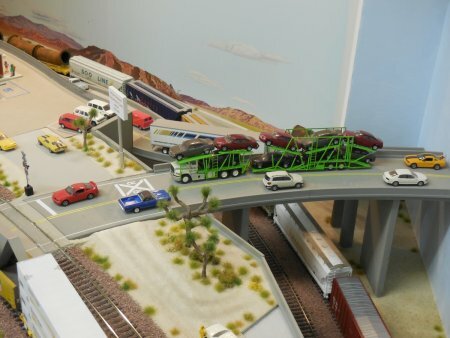 Our journey with the Santa Fe train around the layout is over. 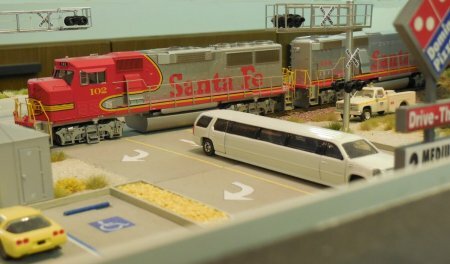 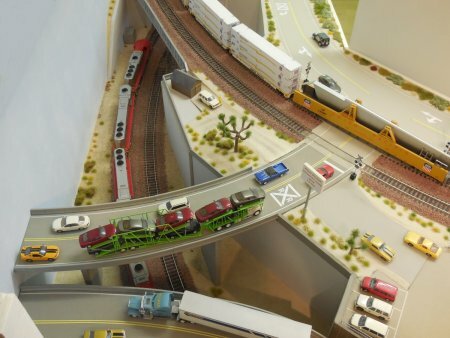 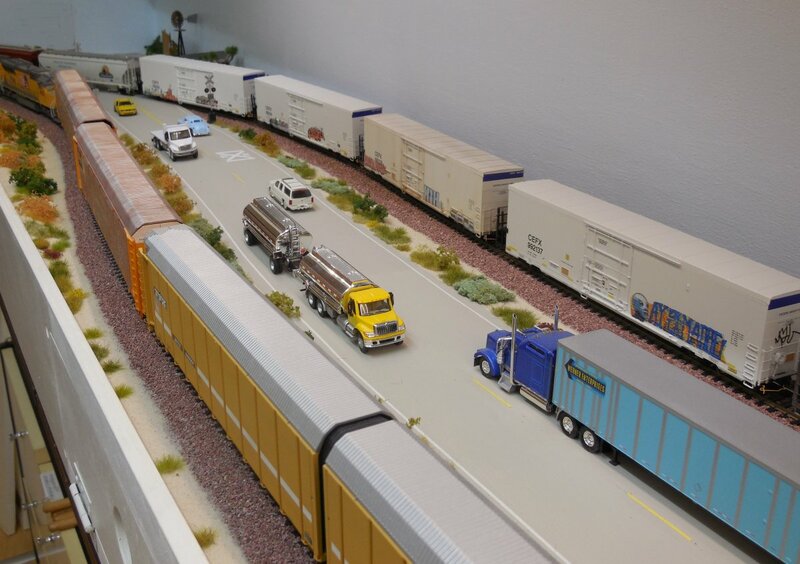 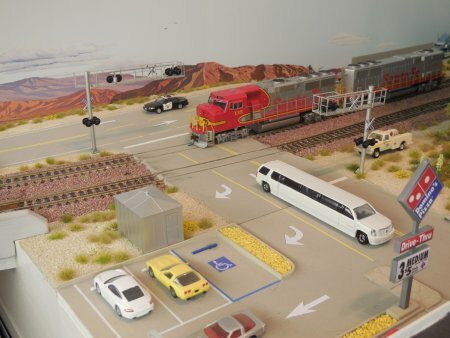 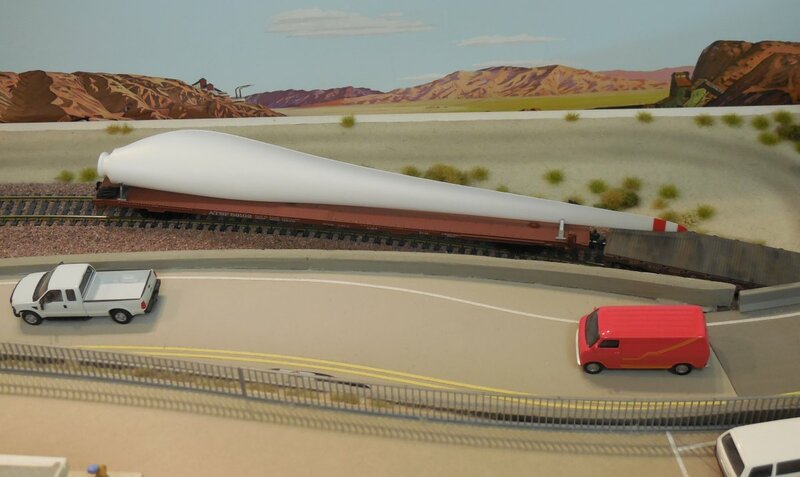 But we are not at the end of the show, because we went back to the Flyover and the Mormon Rocks to show all the diffierent freight cars of this Santa Fe manifest. 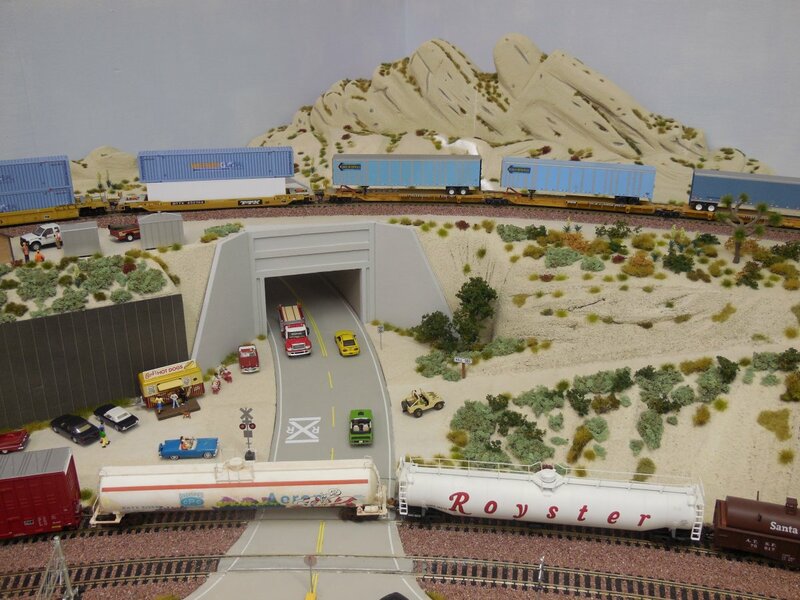 We go back to the Flyover with the 2 road bridges, Highway 138 and the Mormon Rocks. 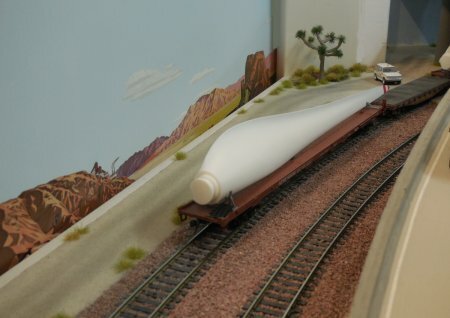 The curve got even a backdrop at the outside. 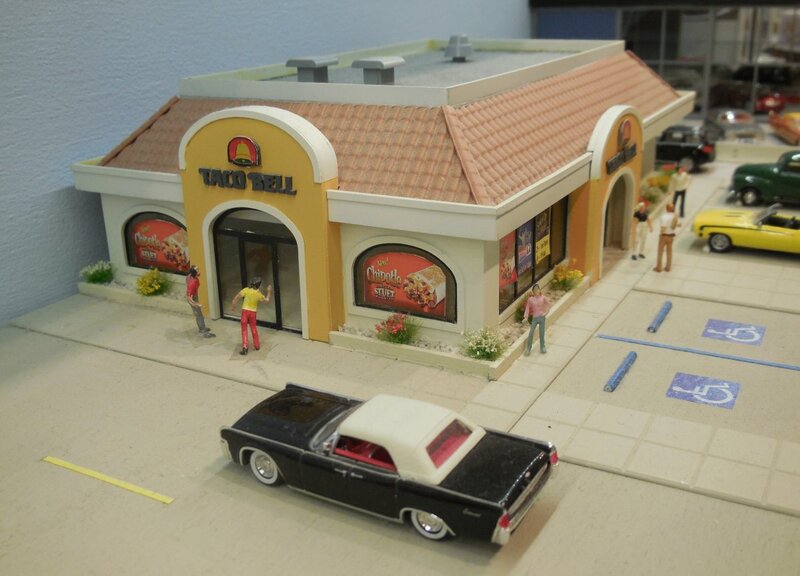 Most photos are aerial shots. 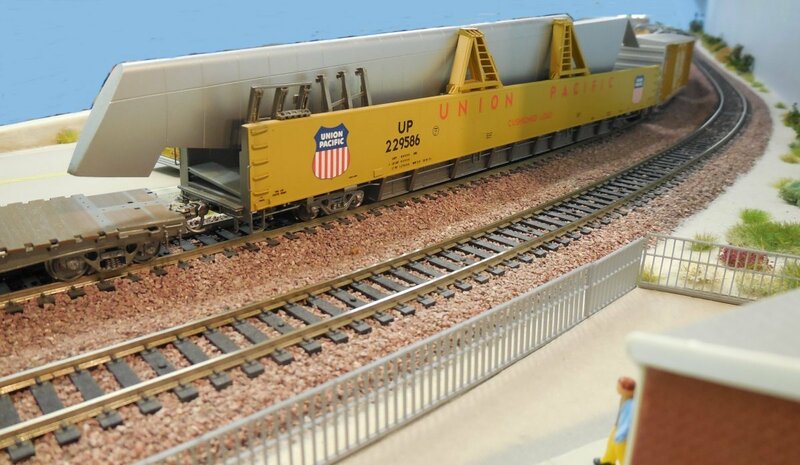 As this train is slowly moving we are able to see the rear end with the special load in the curve around the road bridges. Sorry about the endless amount of pictures but every angle looks different ! It is maybe boring to see the same cars again and again ! 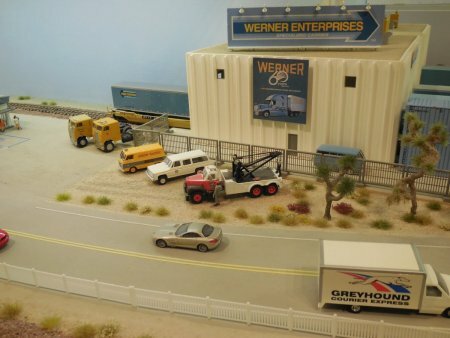 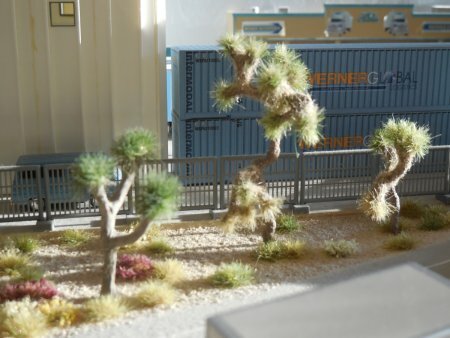 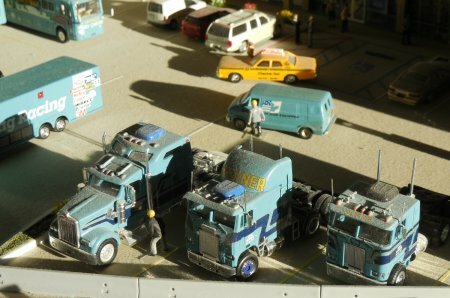 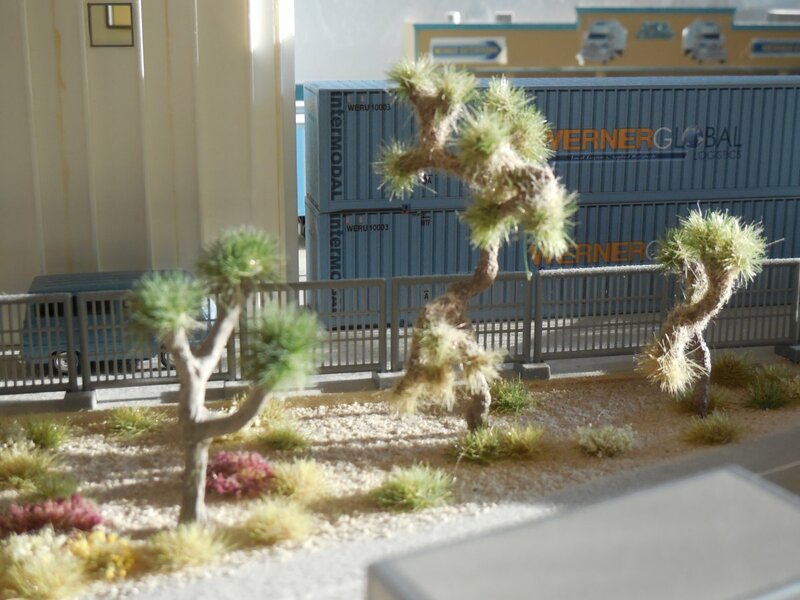 Bonus photos of the Werner Enterprises Terminal with low standing real sunlight.